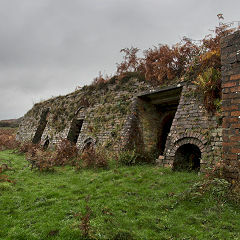 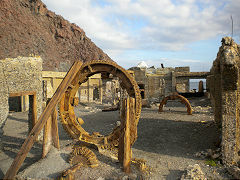 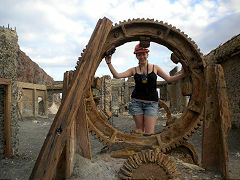 plus old forts, tunnels and many other industrial remains. 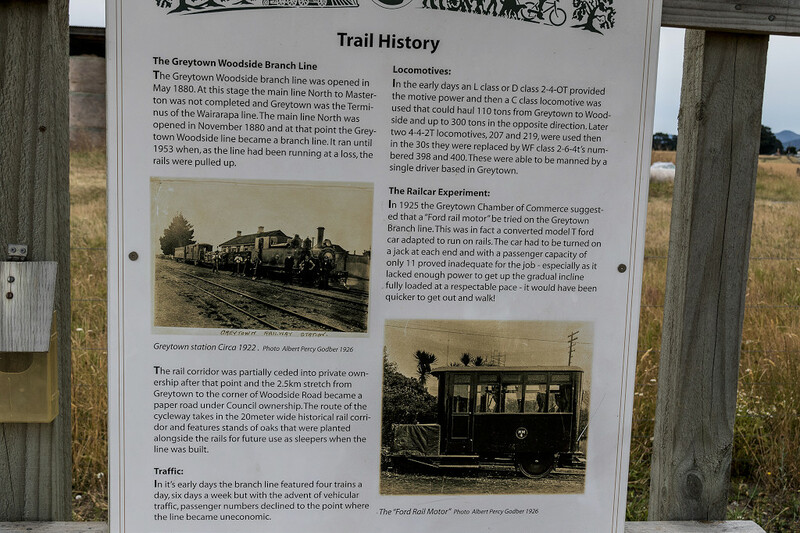 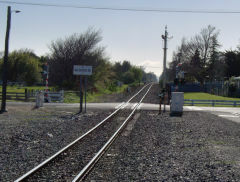 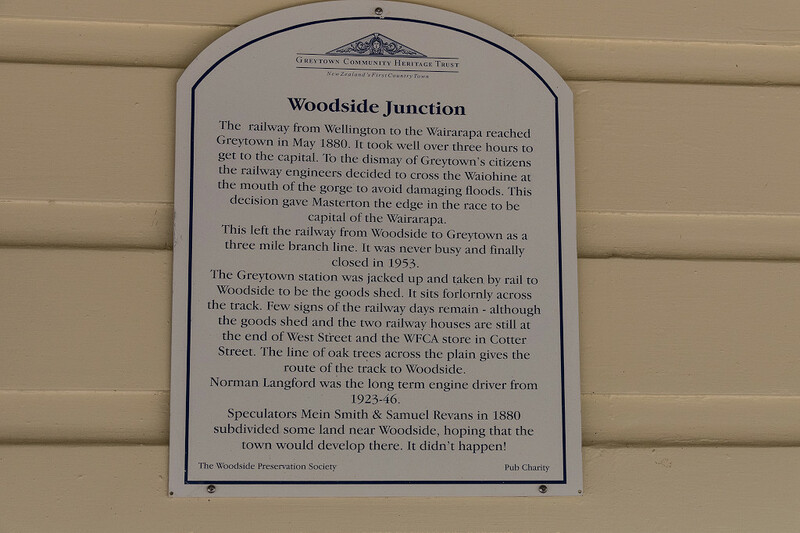 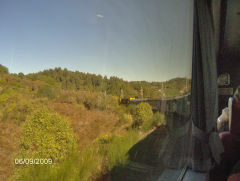 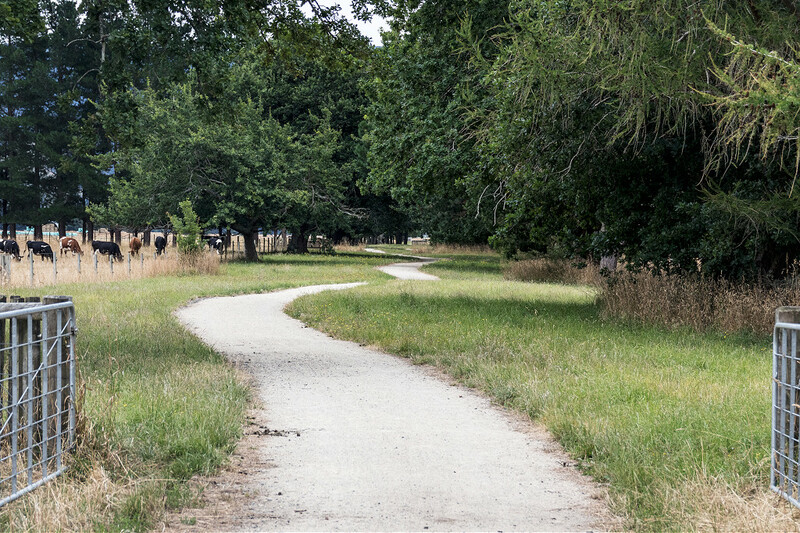 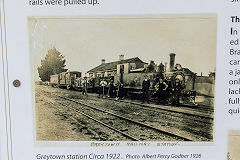 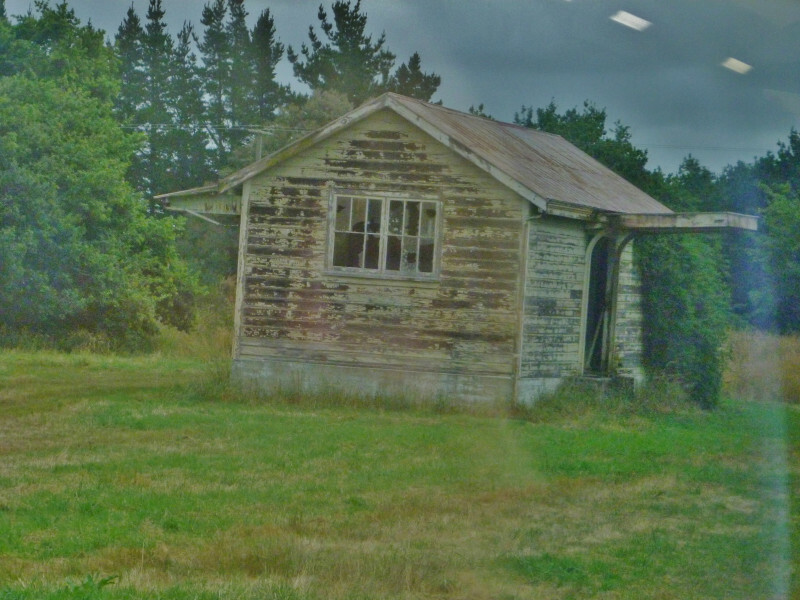 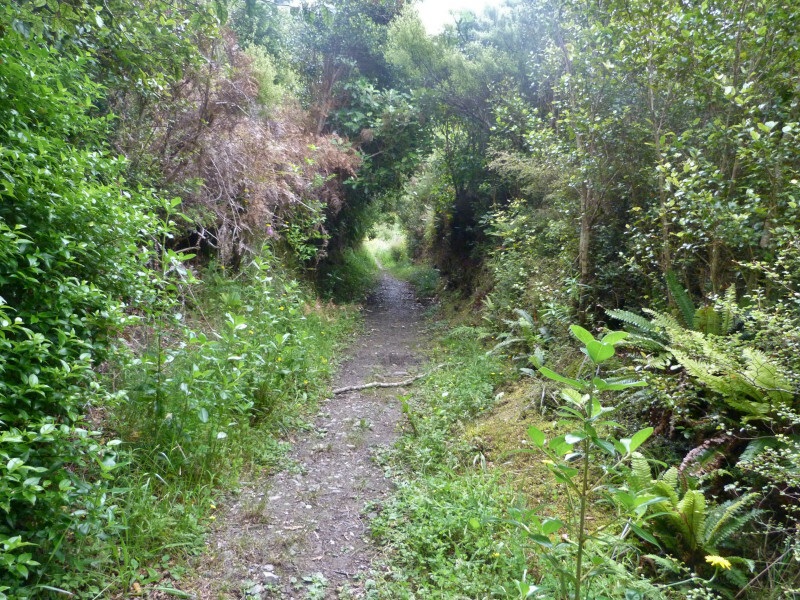 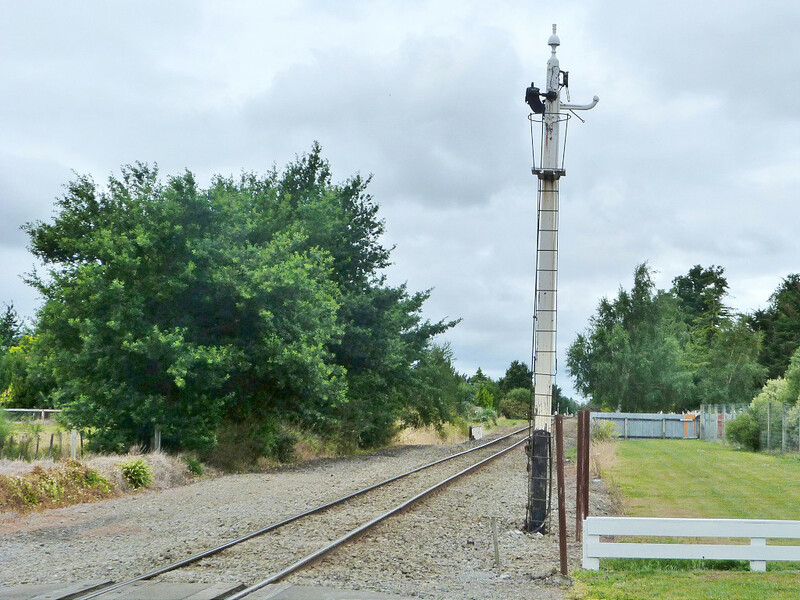 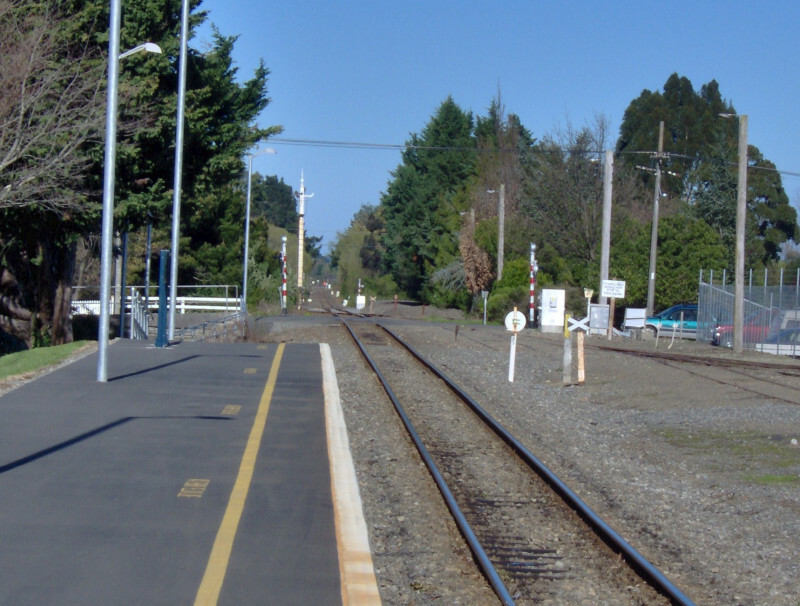 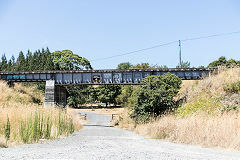 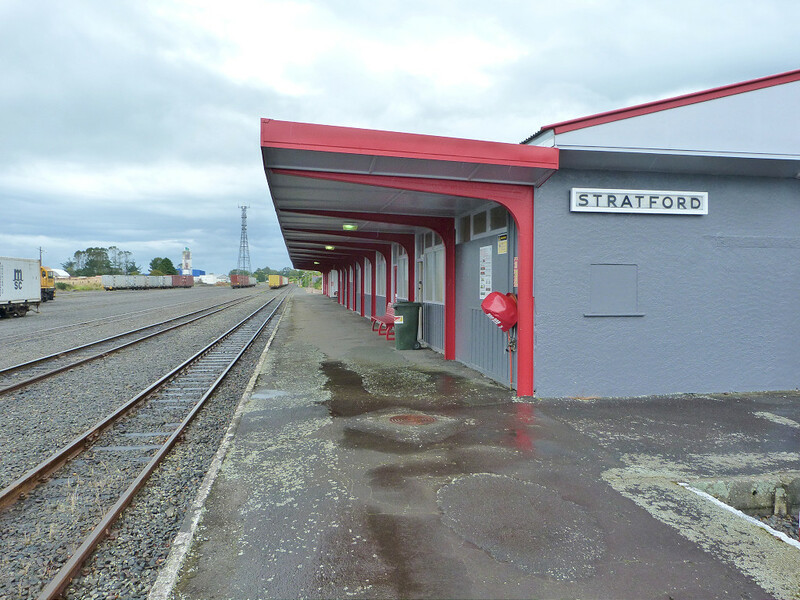 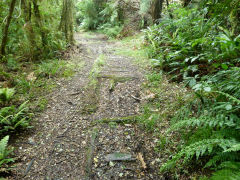 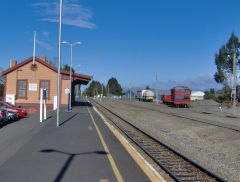 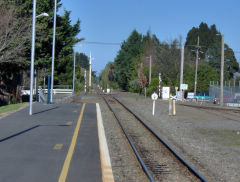 The 3 mile long Greytown branch was opened in 1880 when Woodside was the terminus of the line from Wellington. 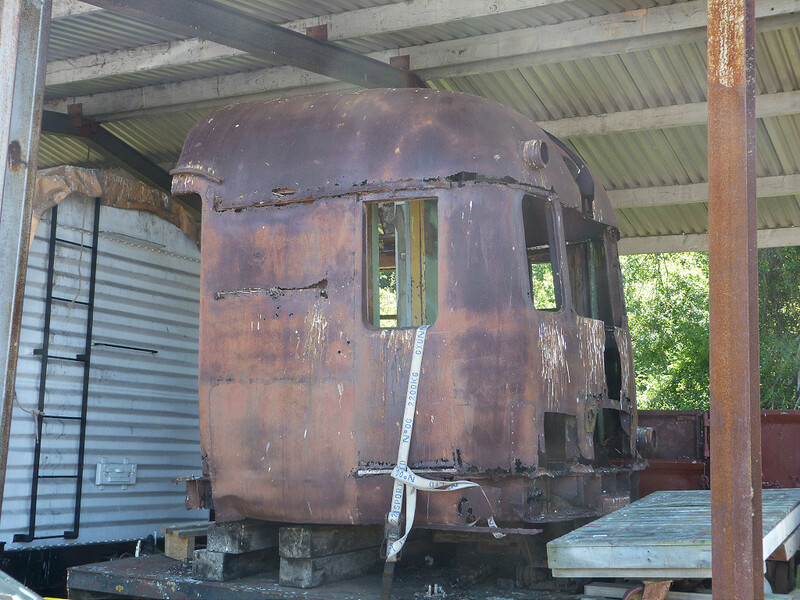 There was an early experiment in 1926 using 'RM4', a Ford railcar but it was very underpowered. 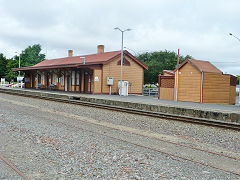 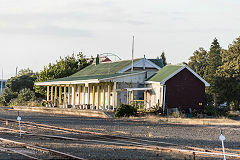 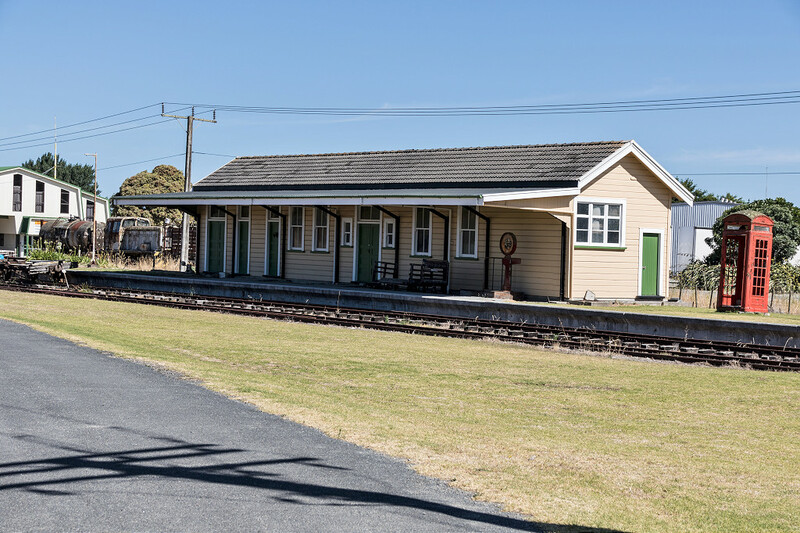 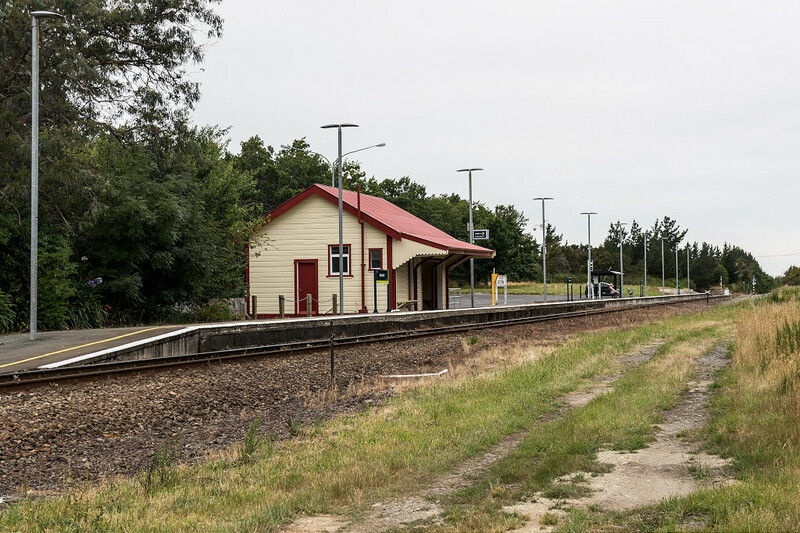 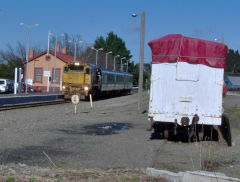 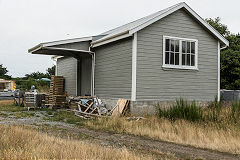 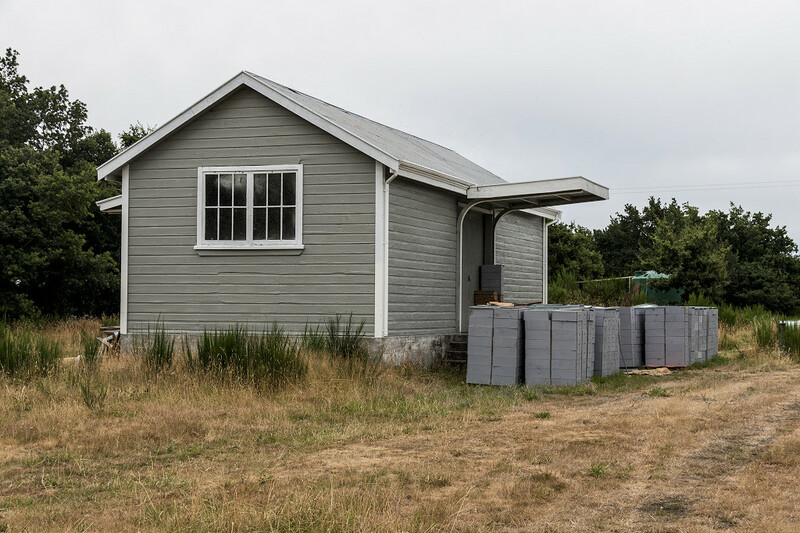 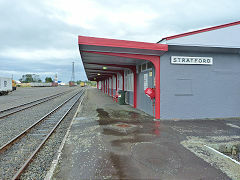 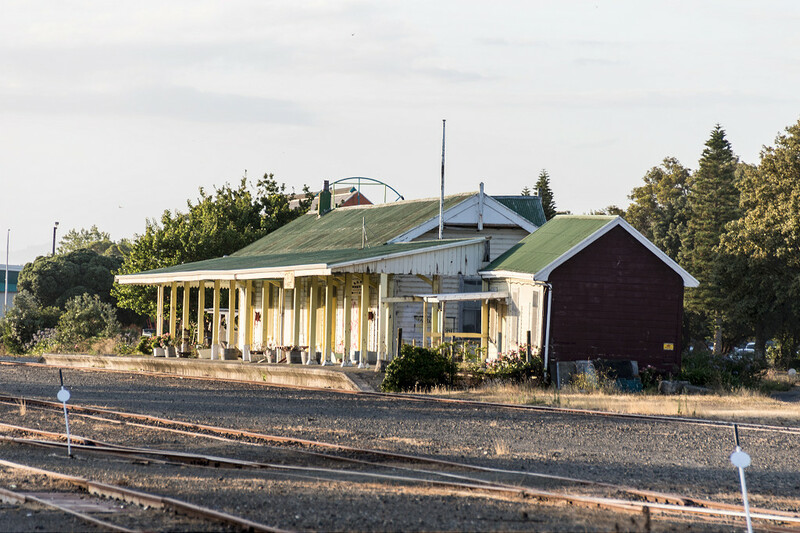 The line closed in 1953 and Greytown Station was moved to Woodside to act as the goods shed, now restored to its former glory. 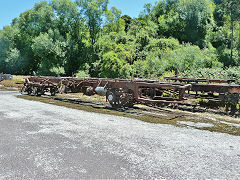 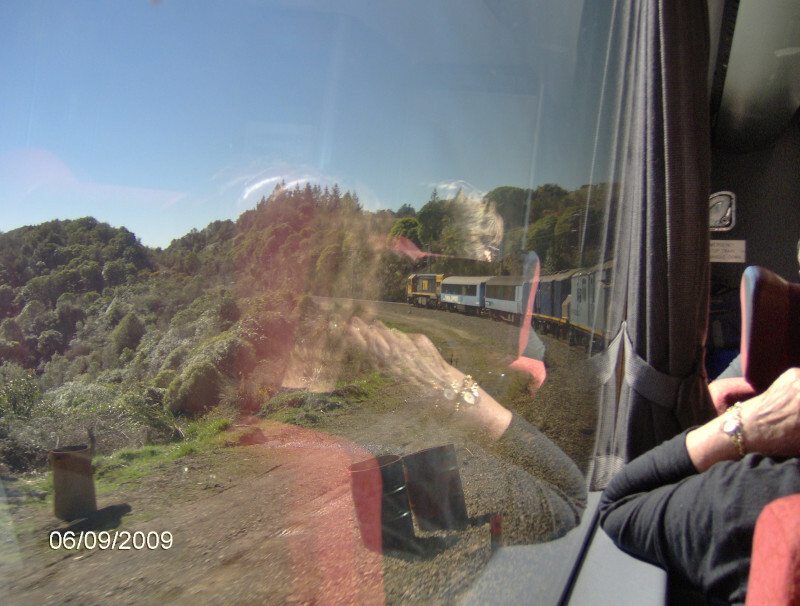 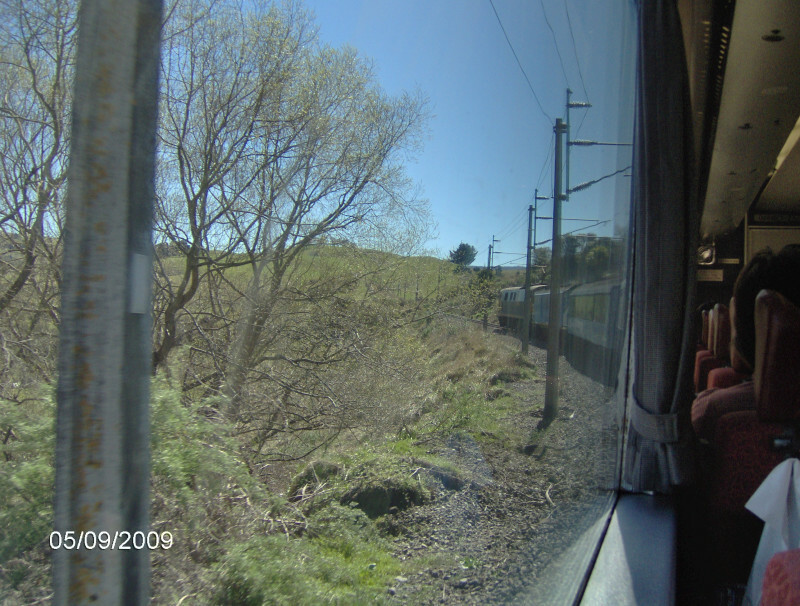 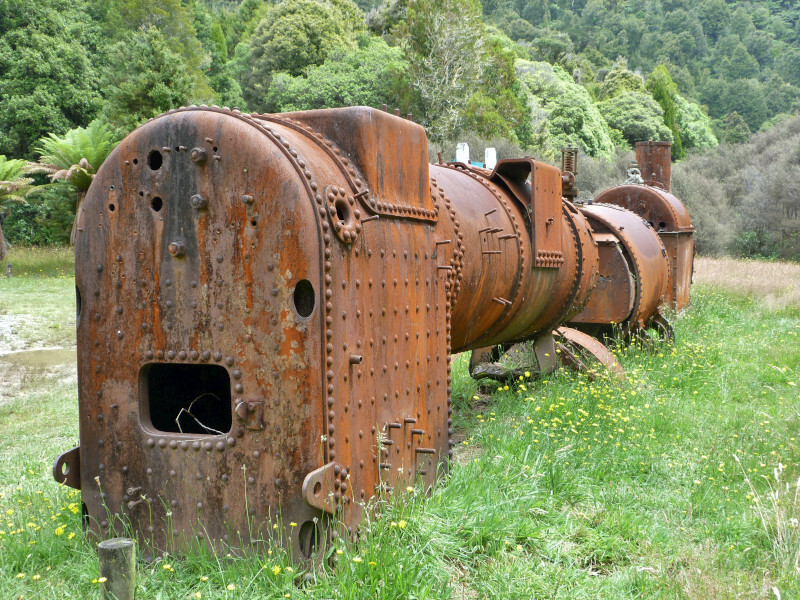 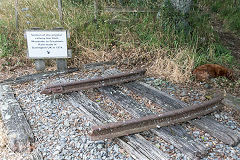 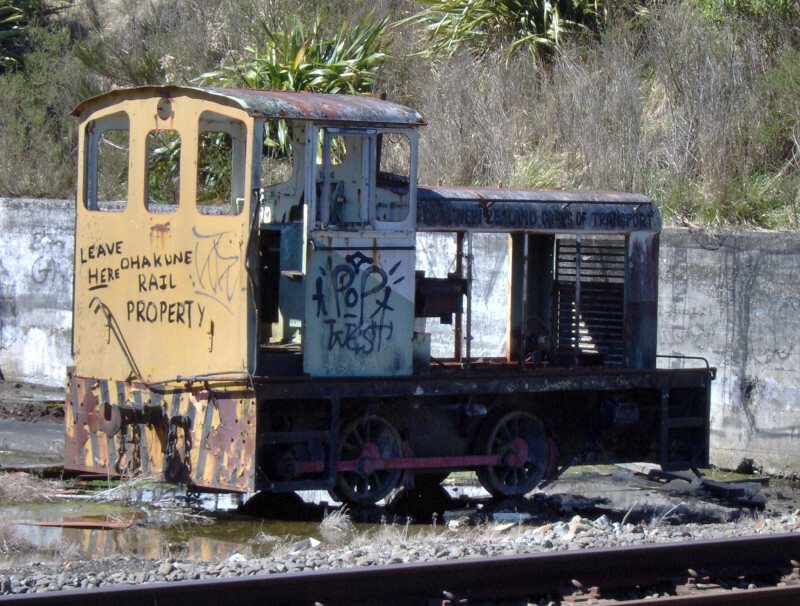 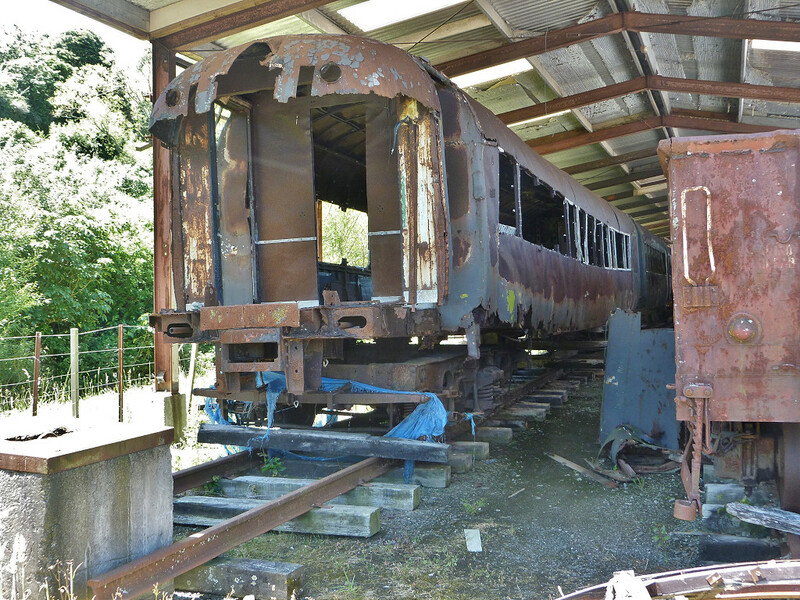 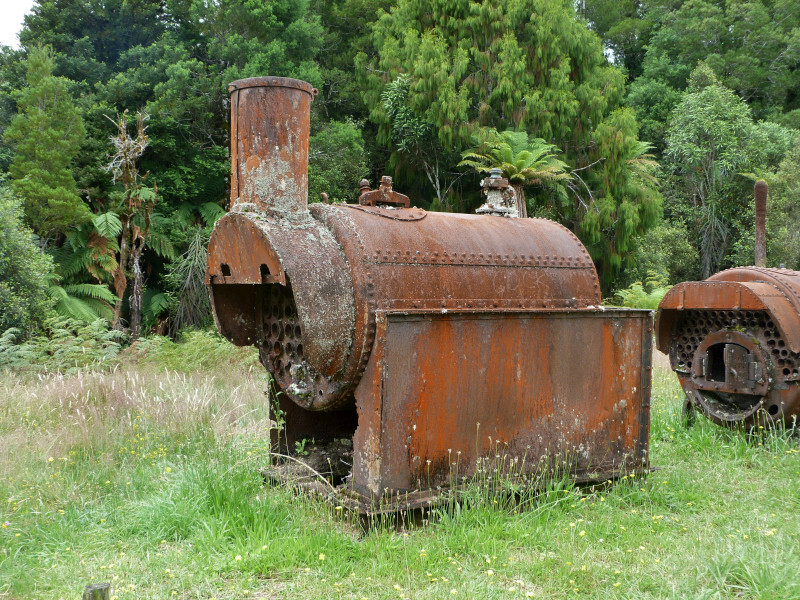 Unfortunately the line from Napier to Gisborne is disused though an occasonal logging train may reach Wairoa now. 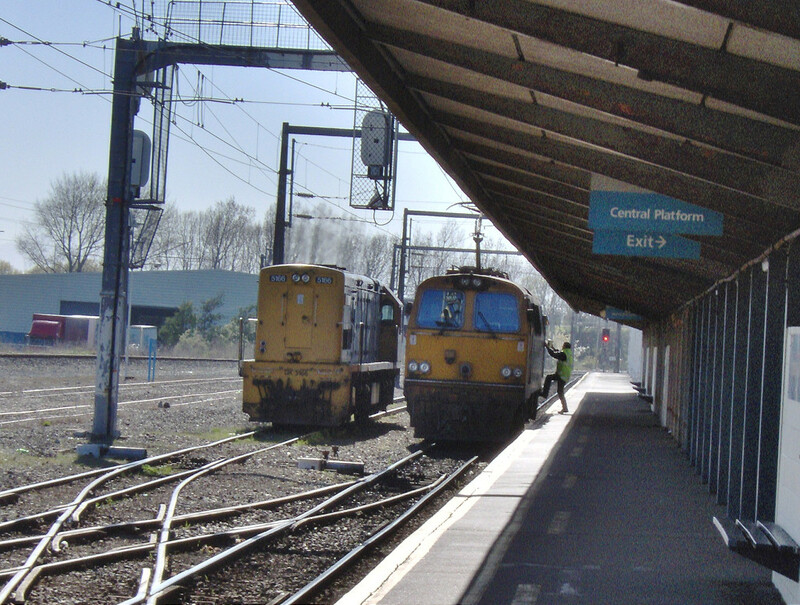 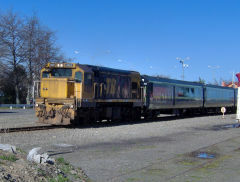 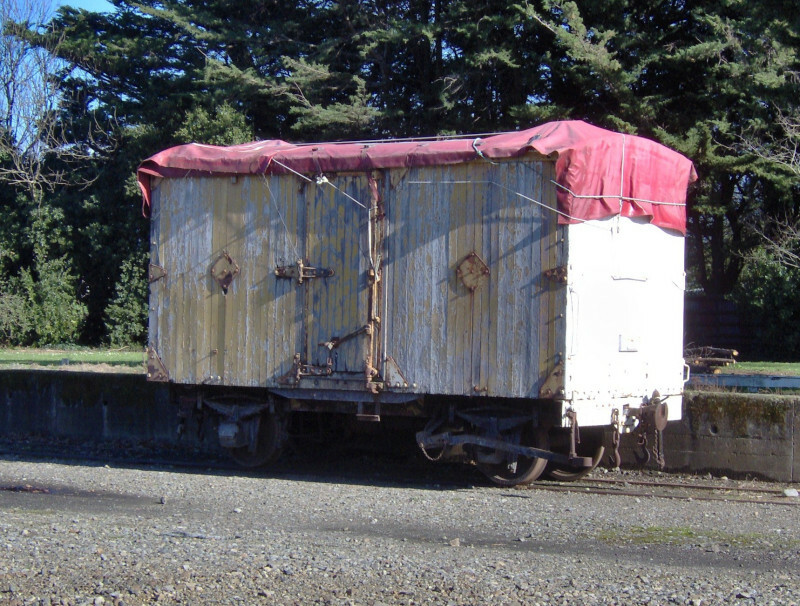 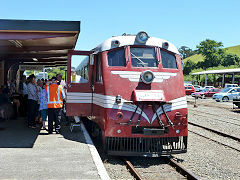 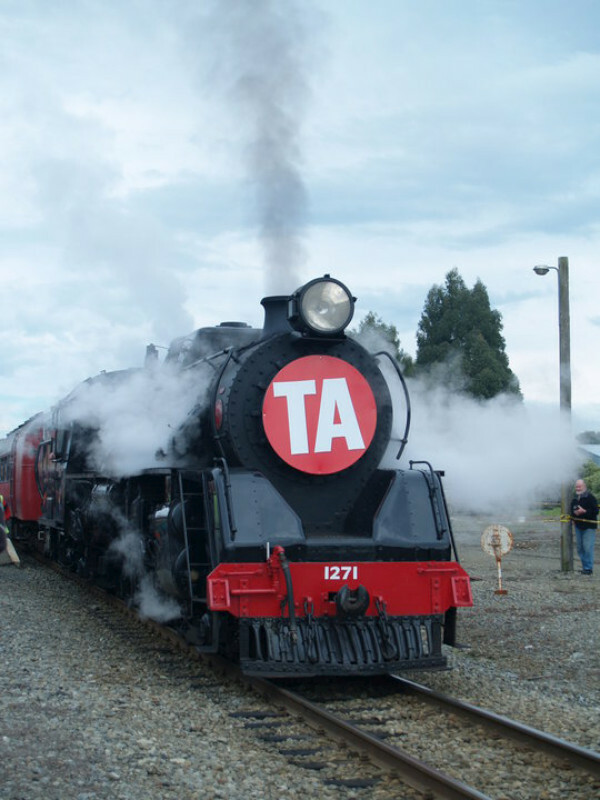 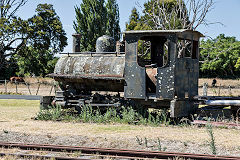 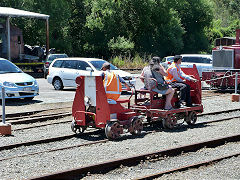 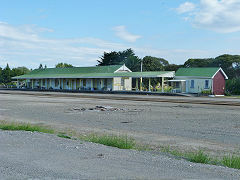 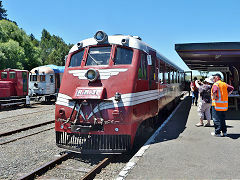 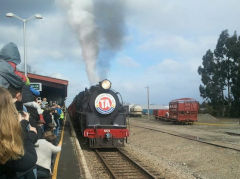 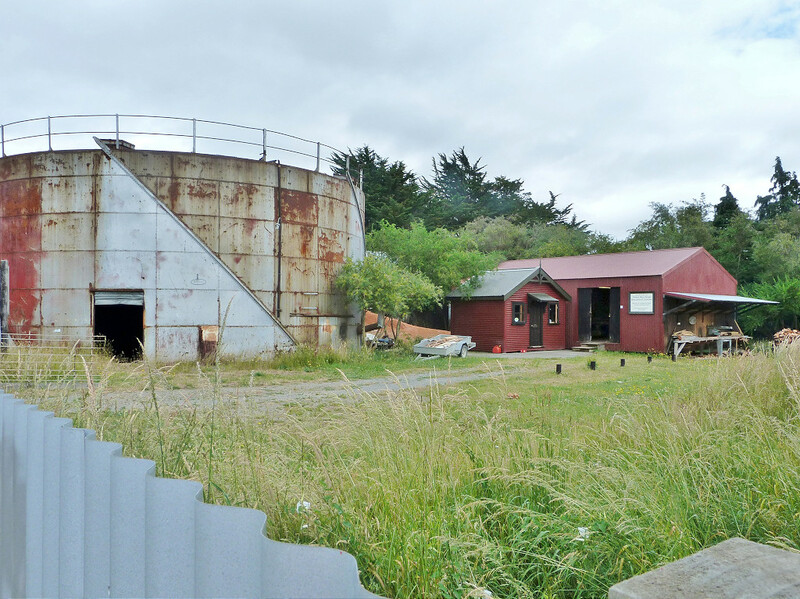 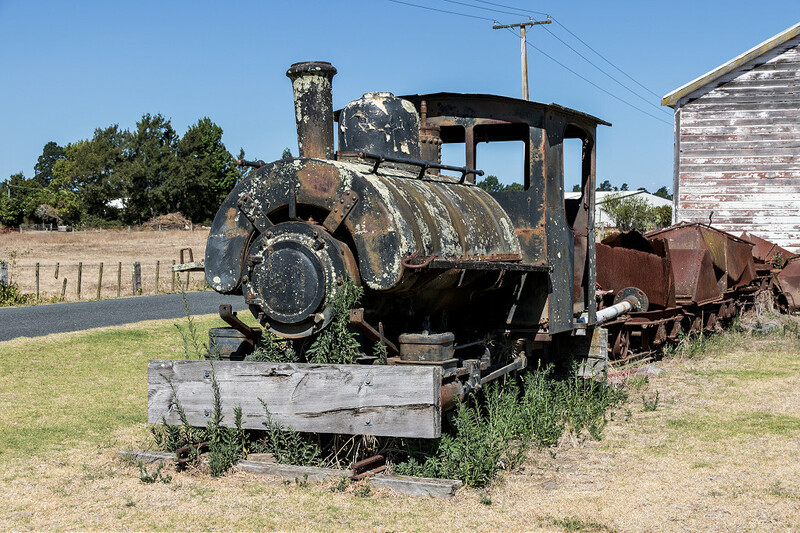 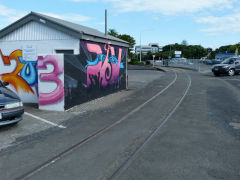 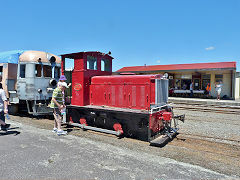 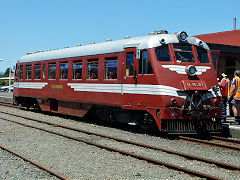 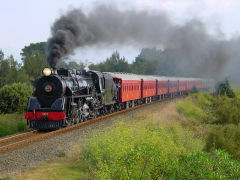 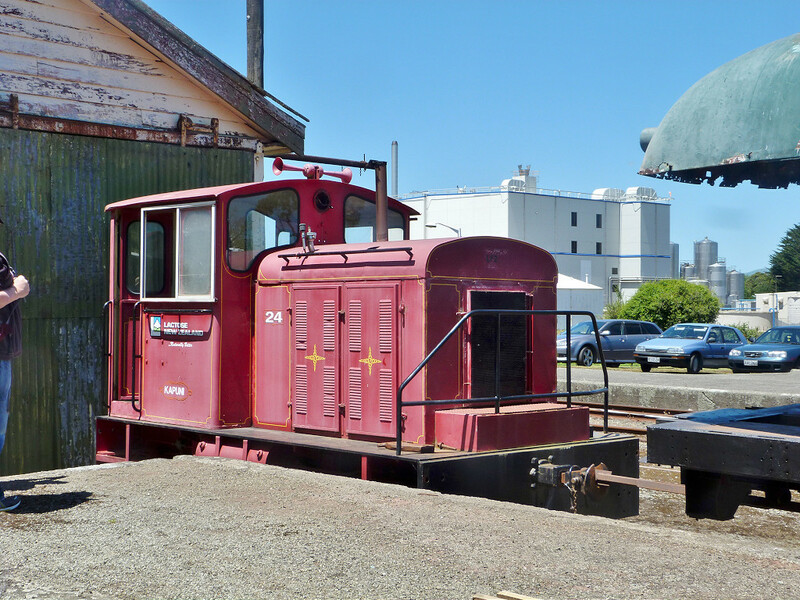 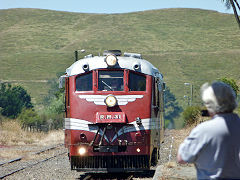 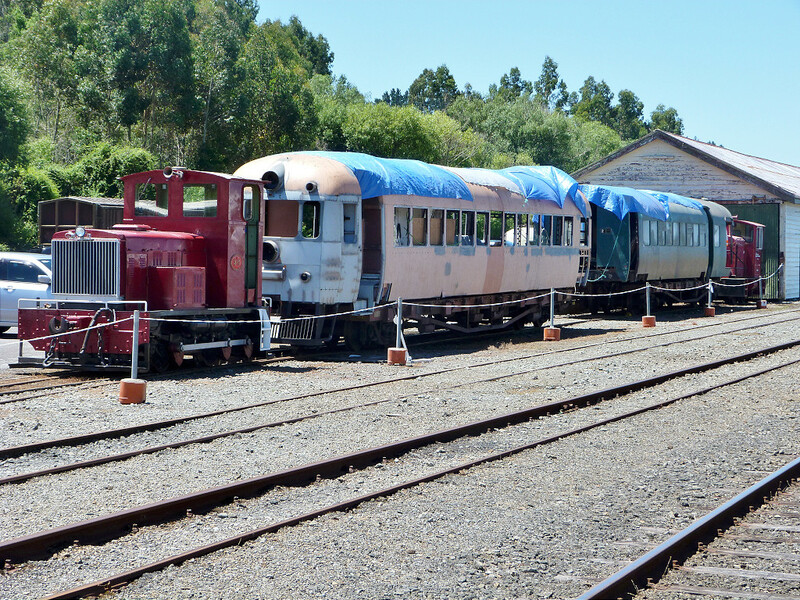 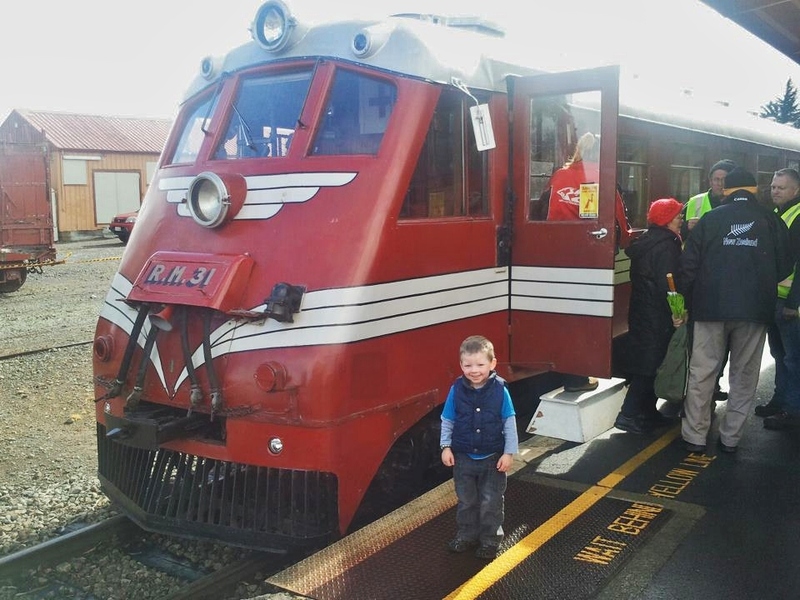 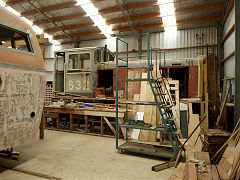 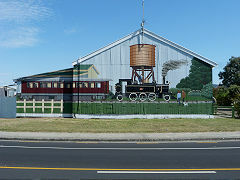 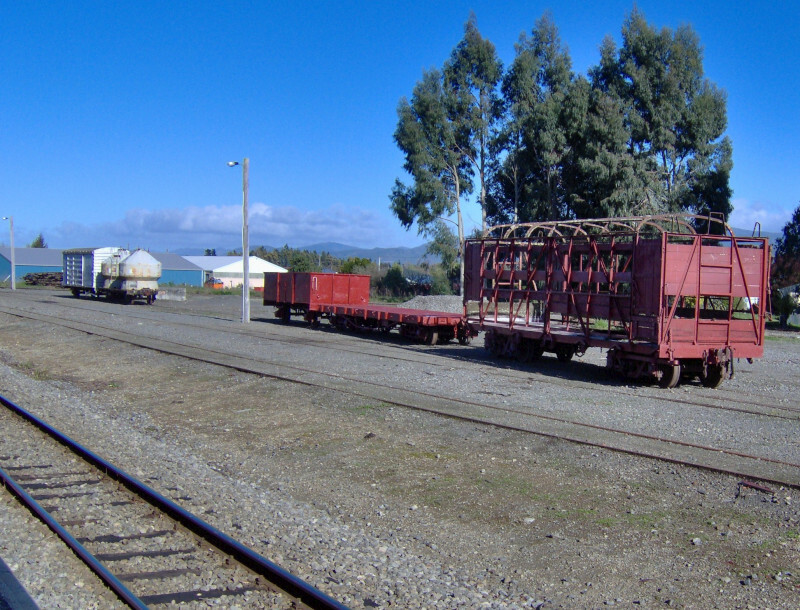 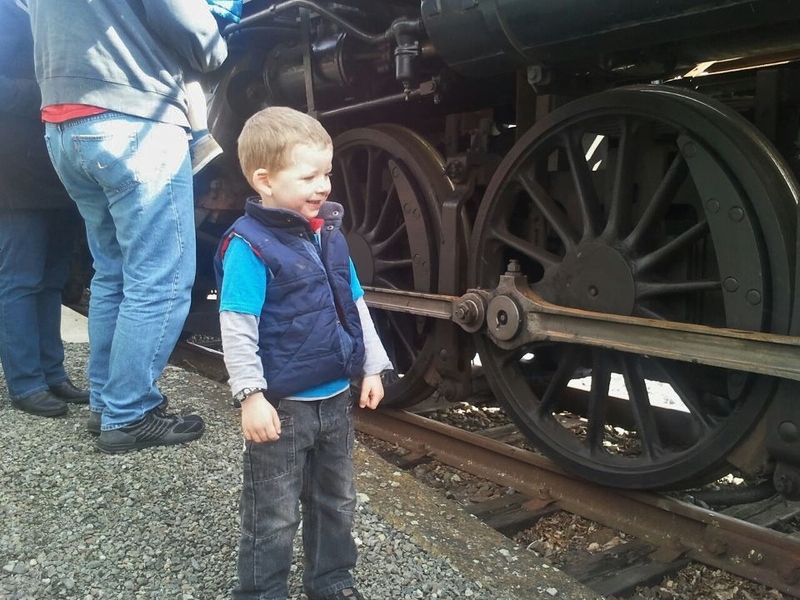 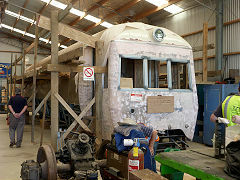 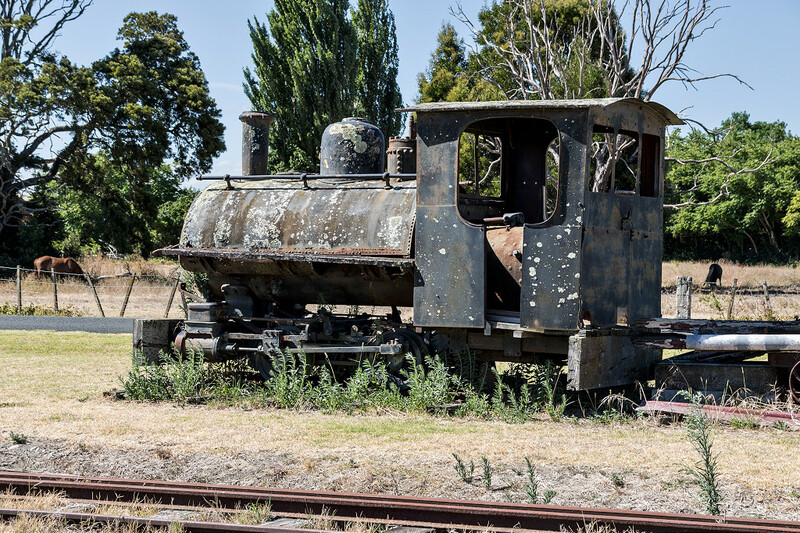 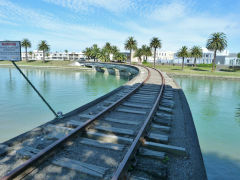 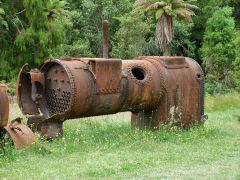 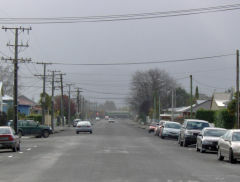 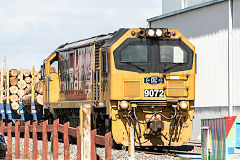 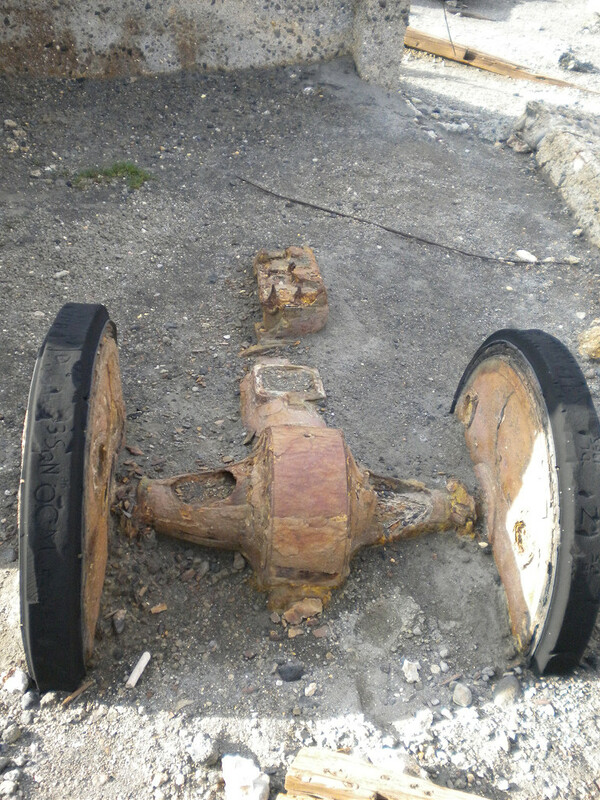 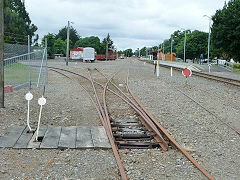 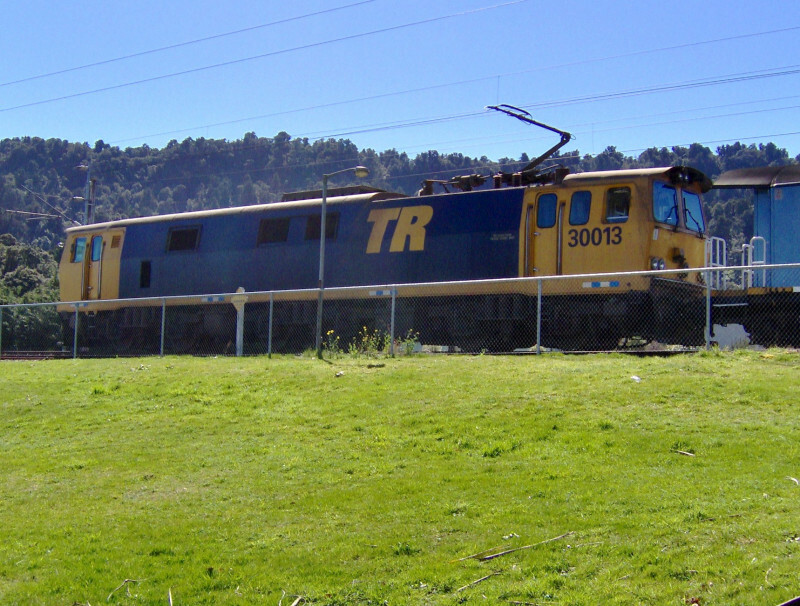 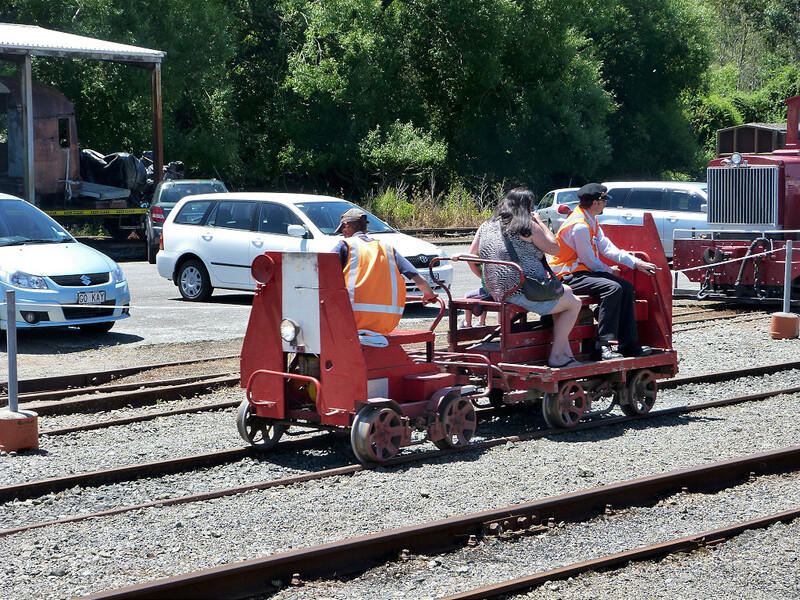 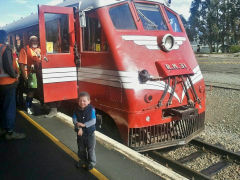 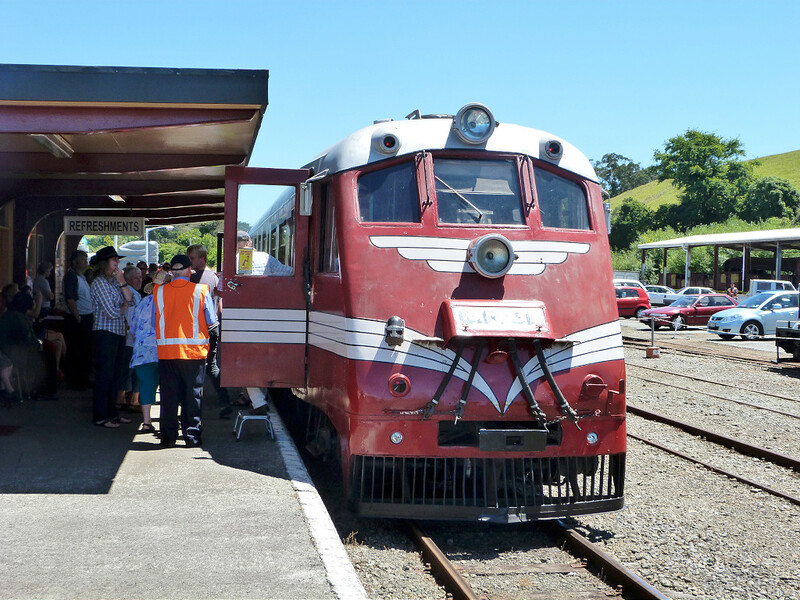 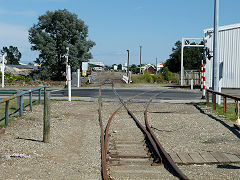 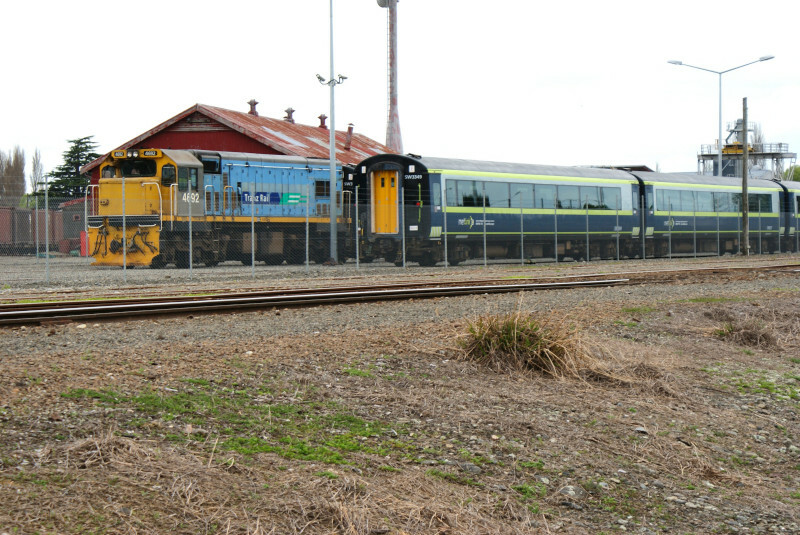 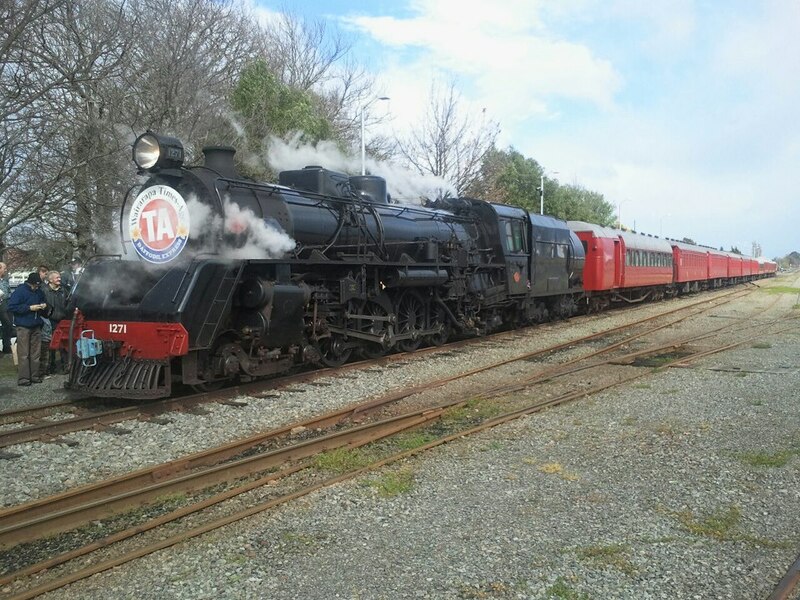 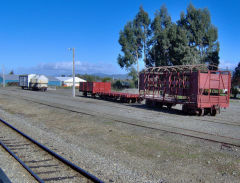 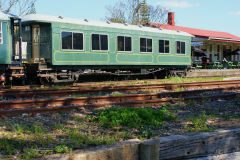 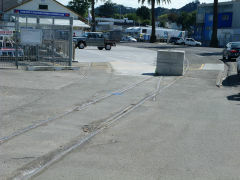 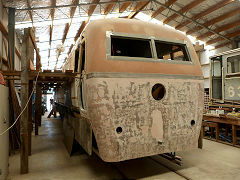 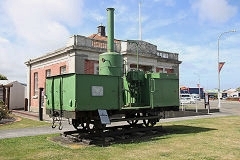 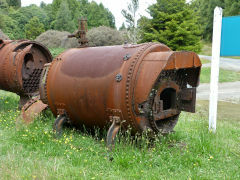 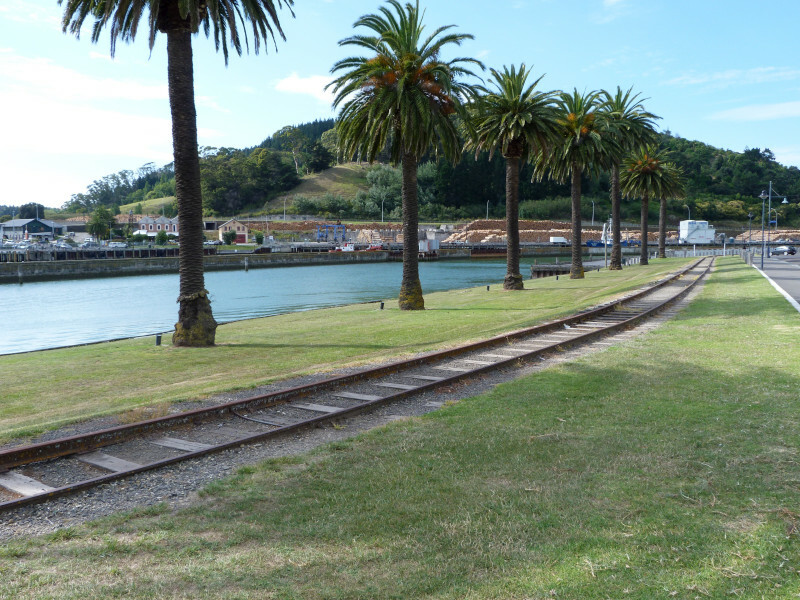 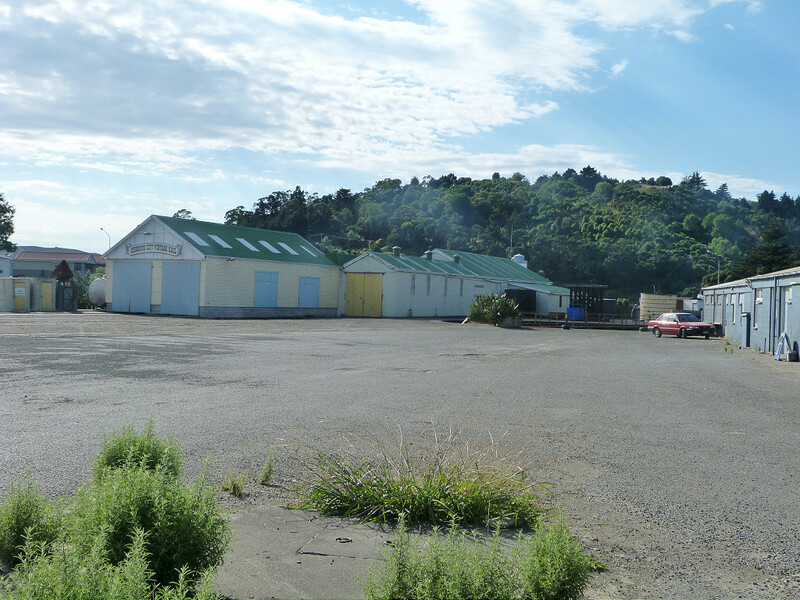 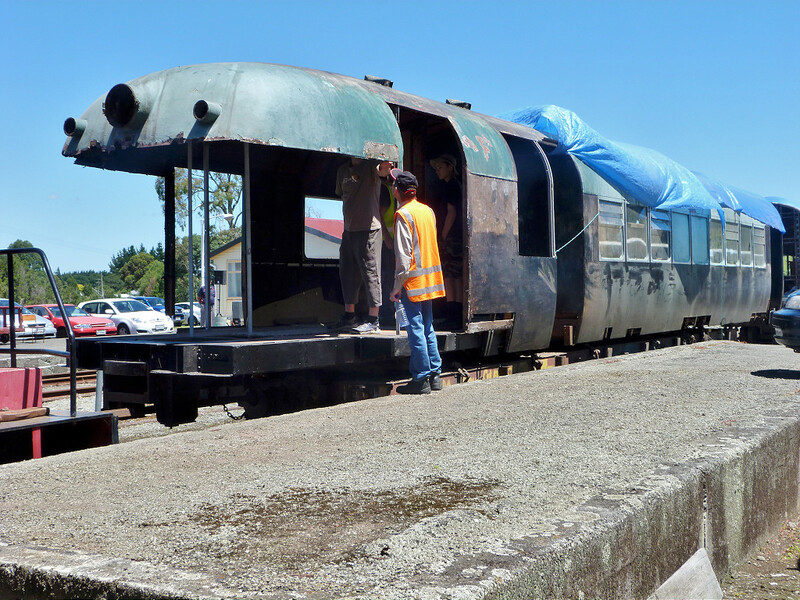 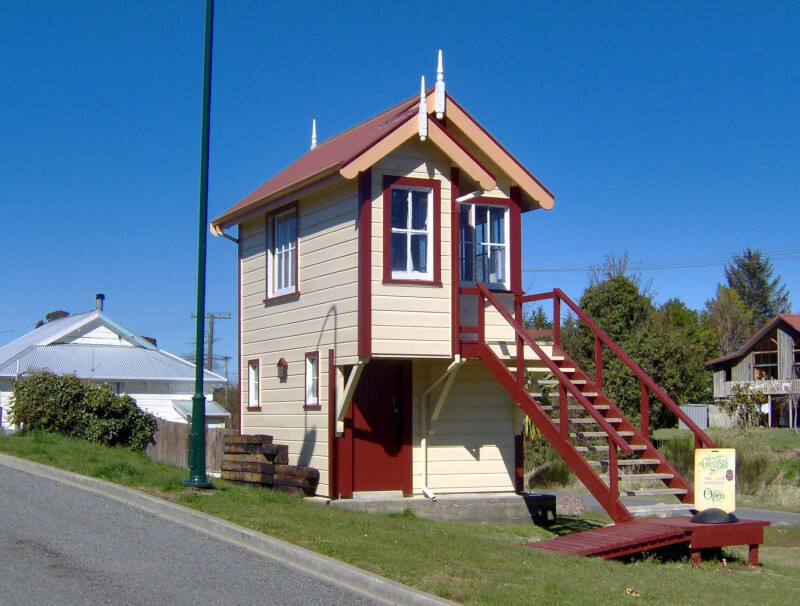 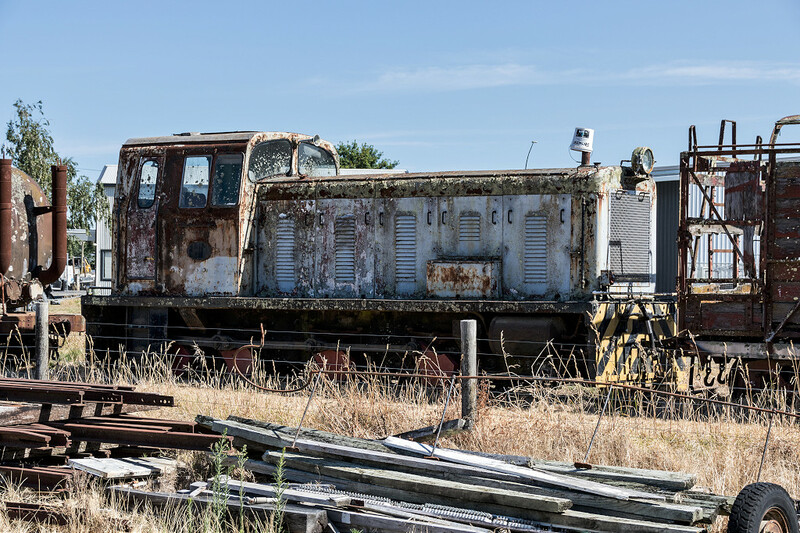 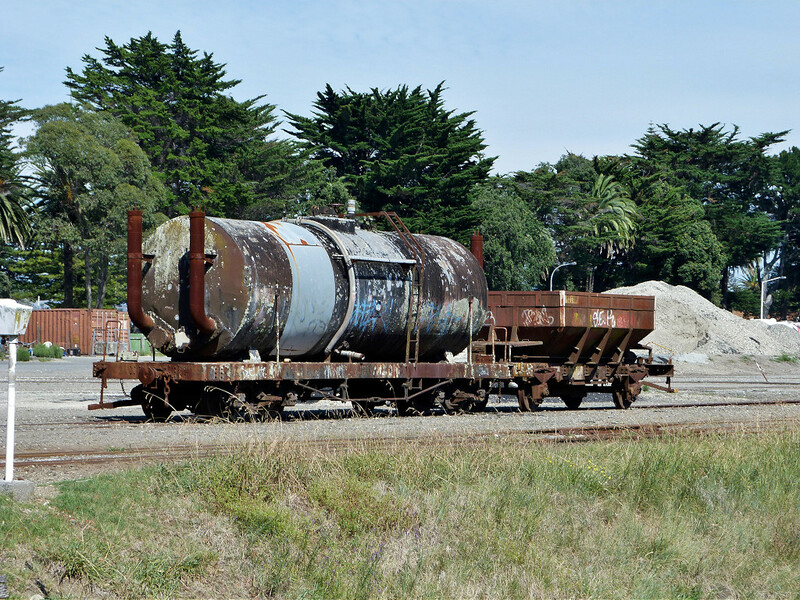 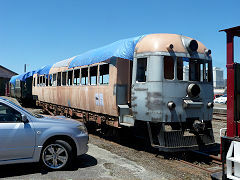 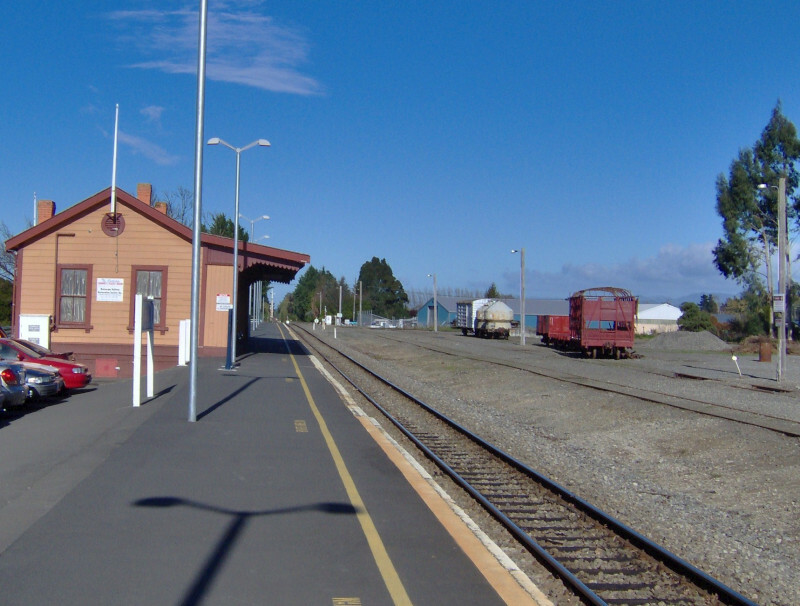 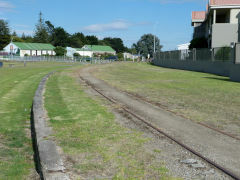 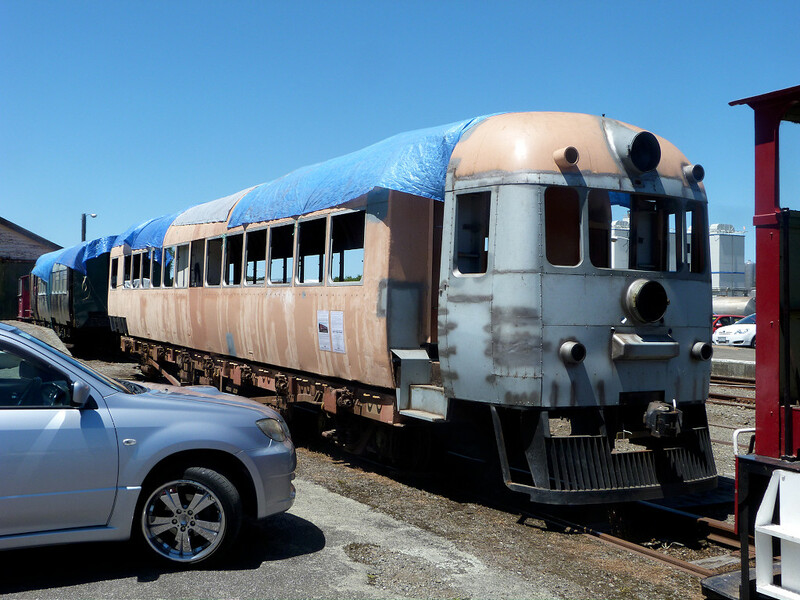 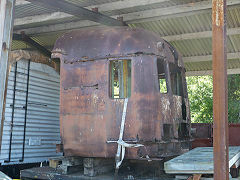 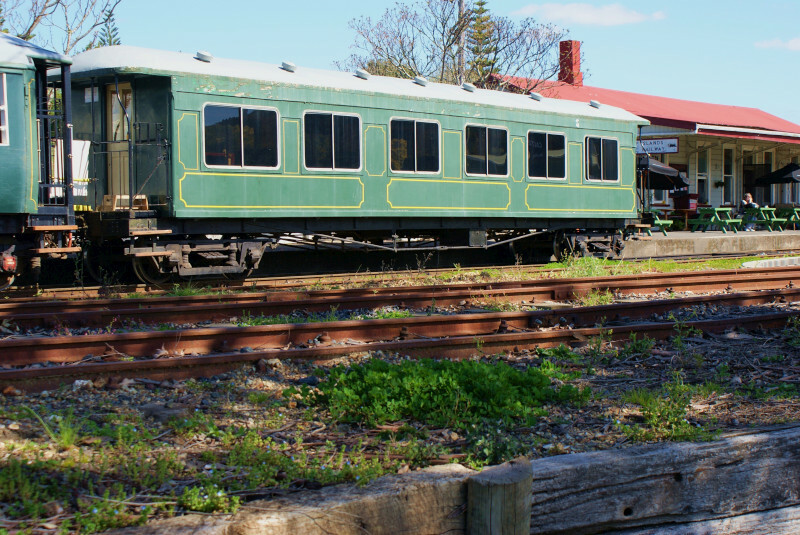 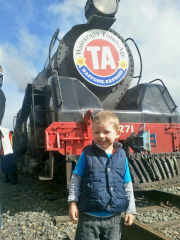 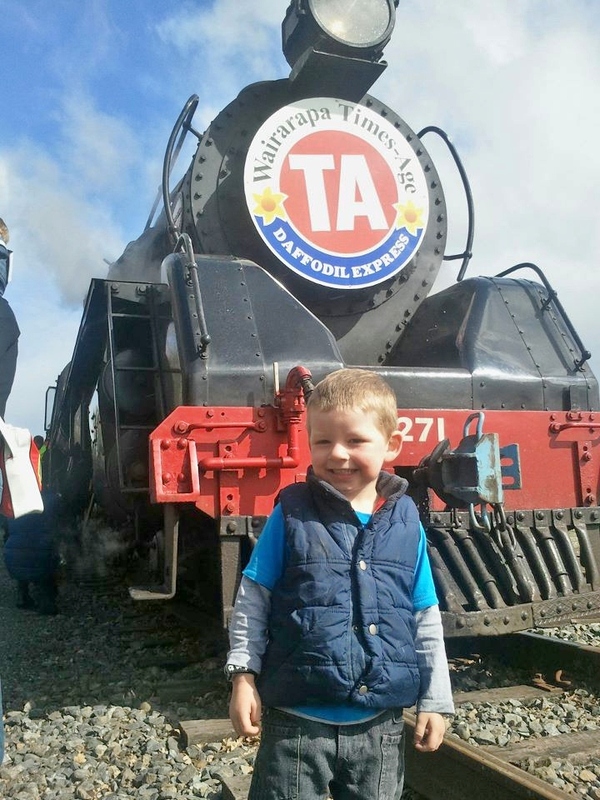 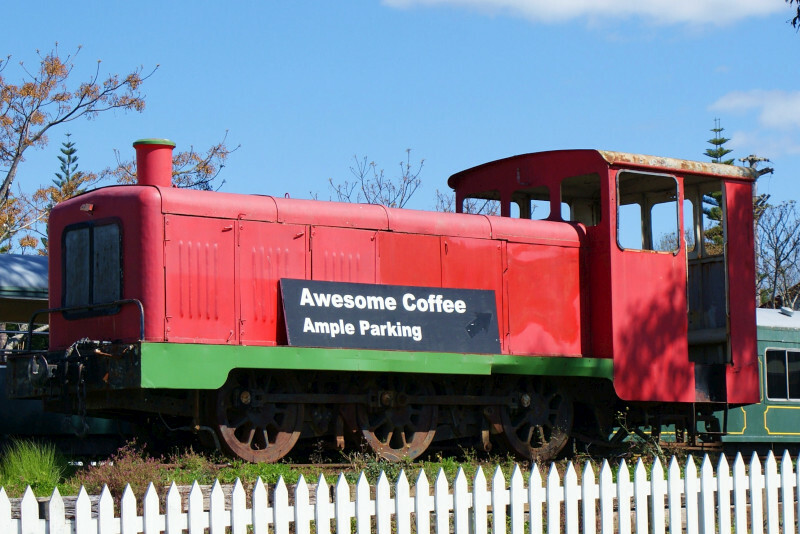 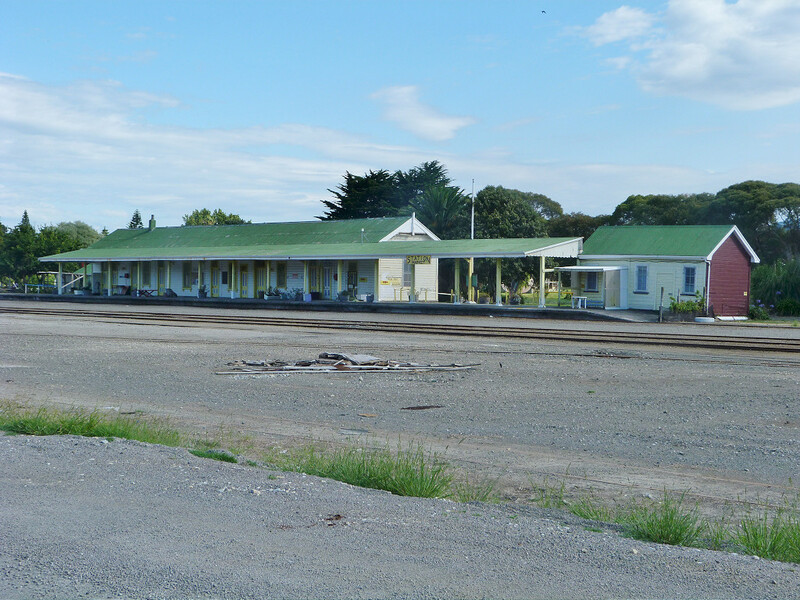 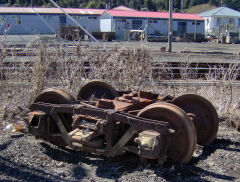 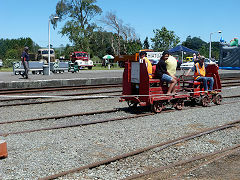 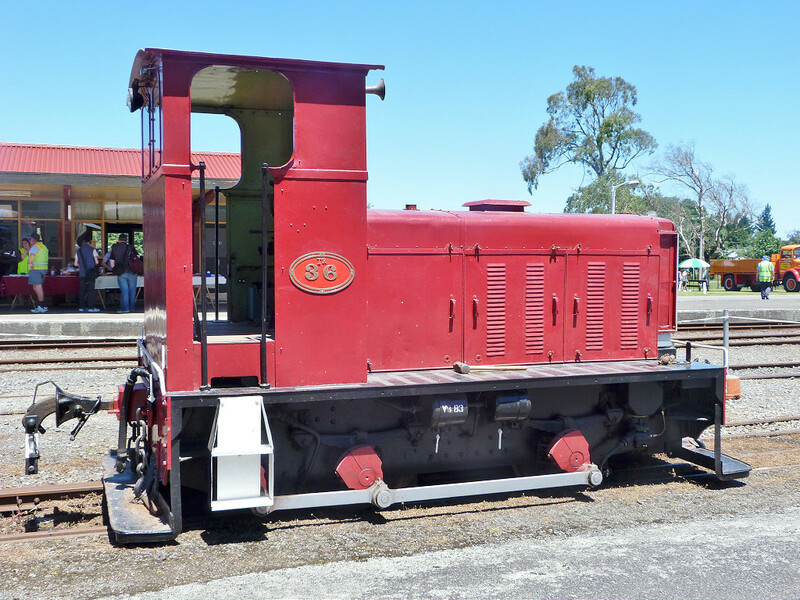 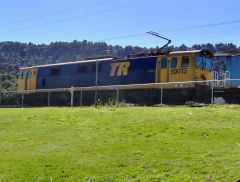 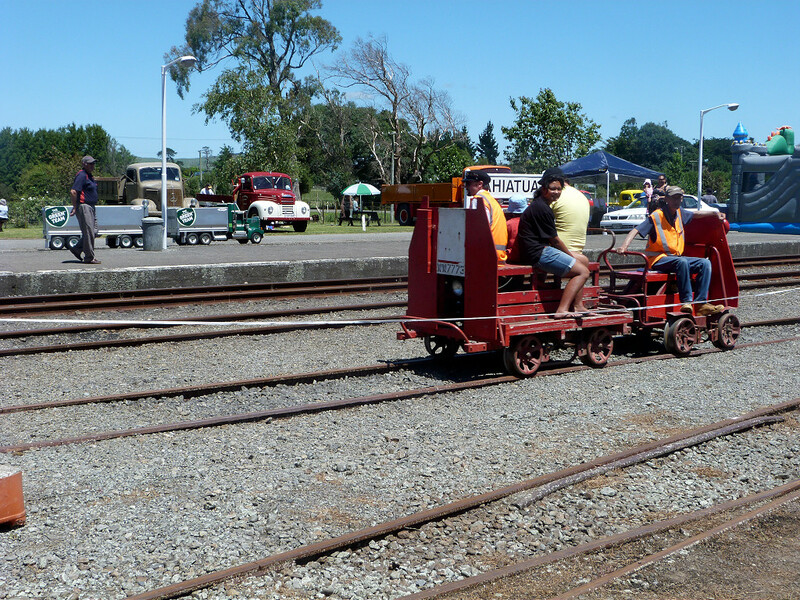 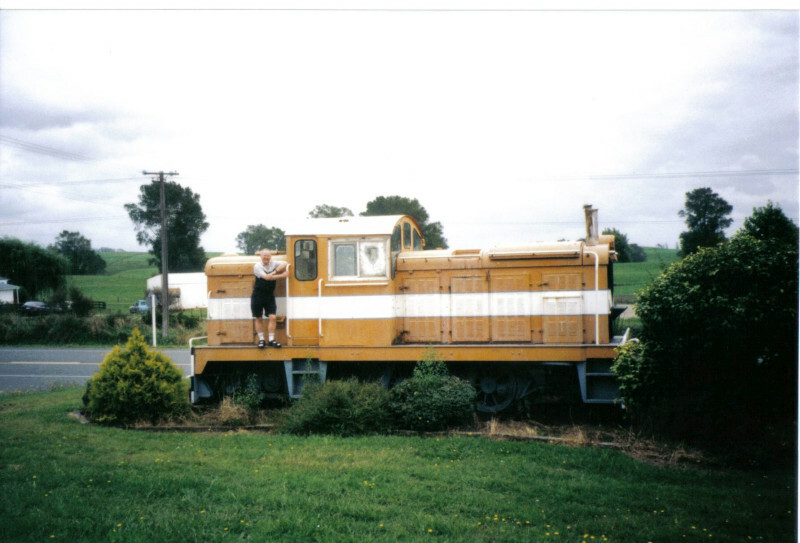 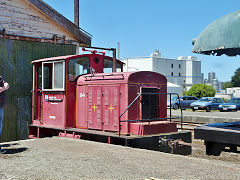 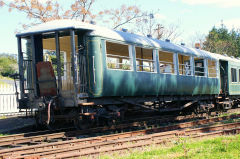 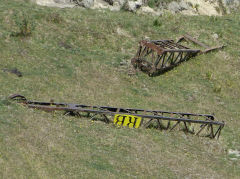 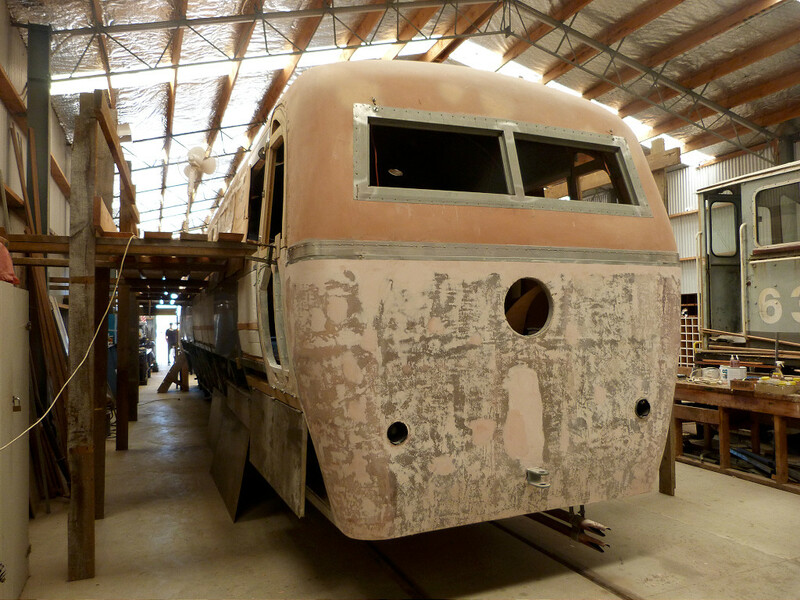 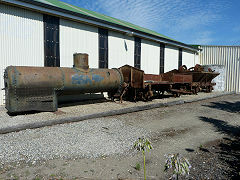 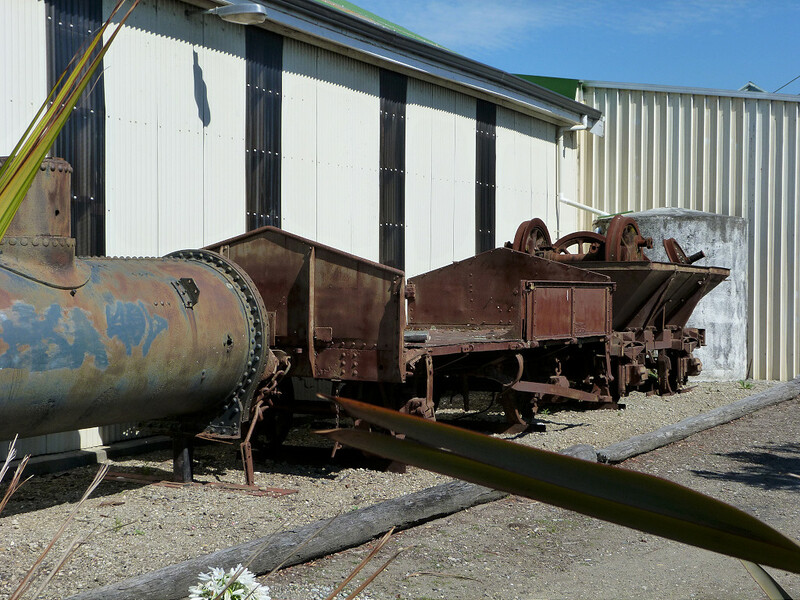 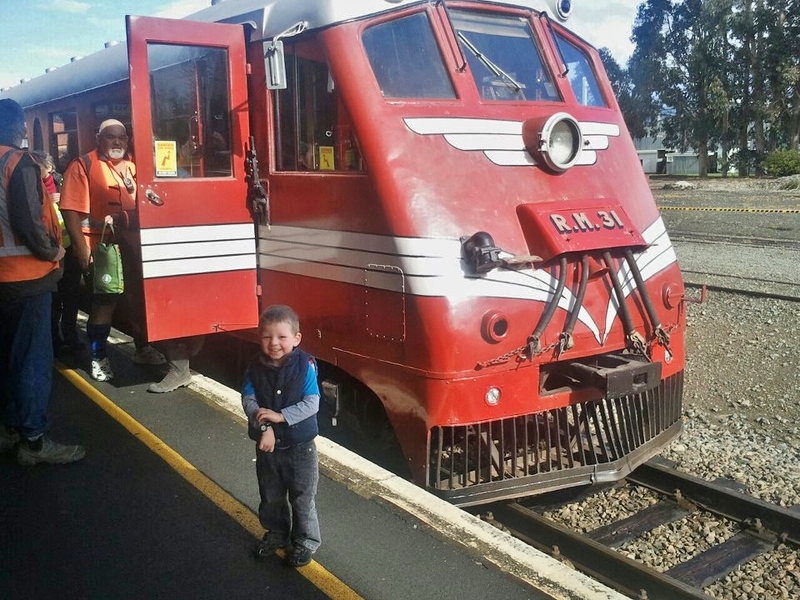 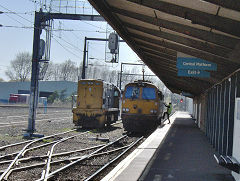 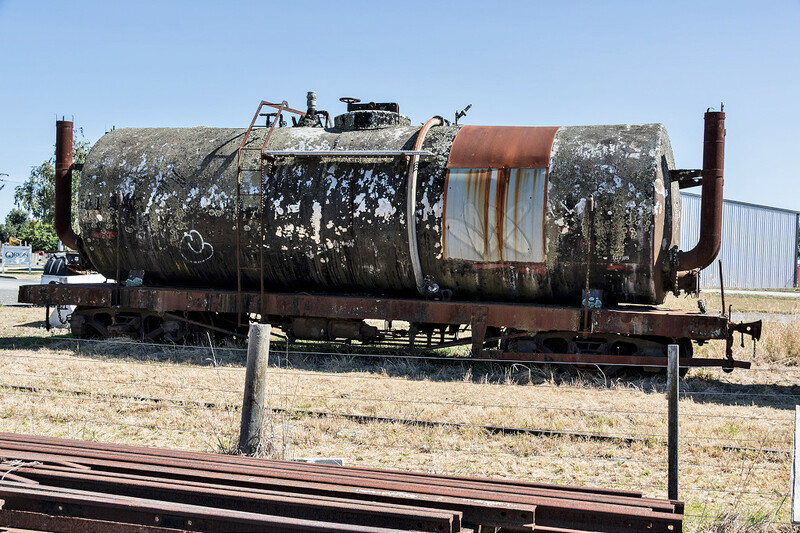 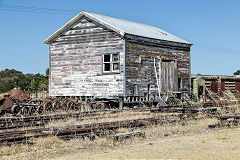 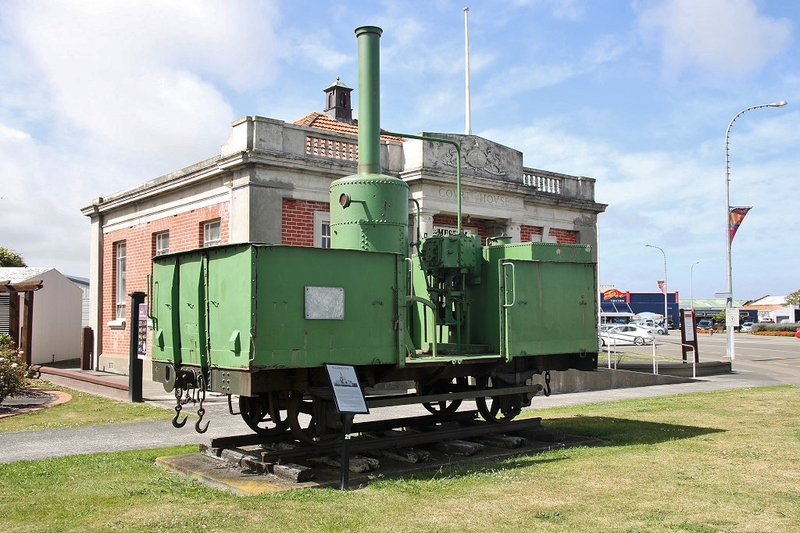 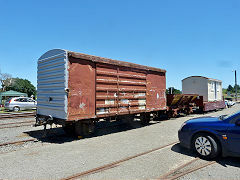 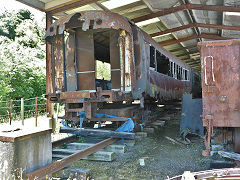 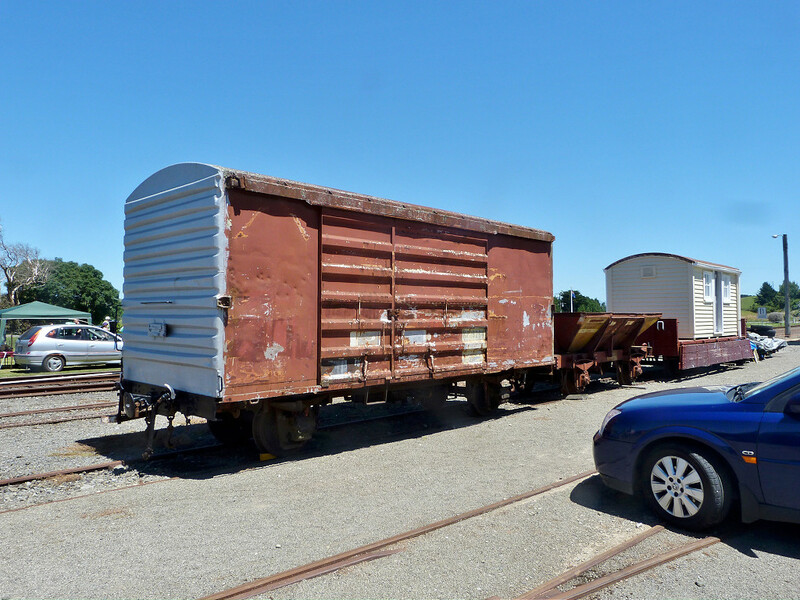 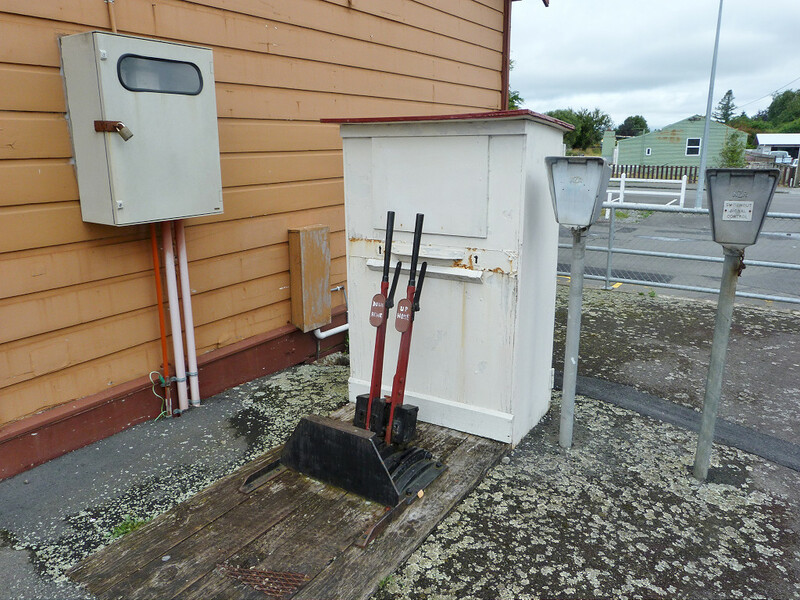 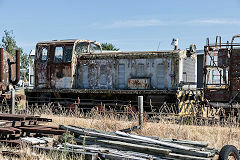 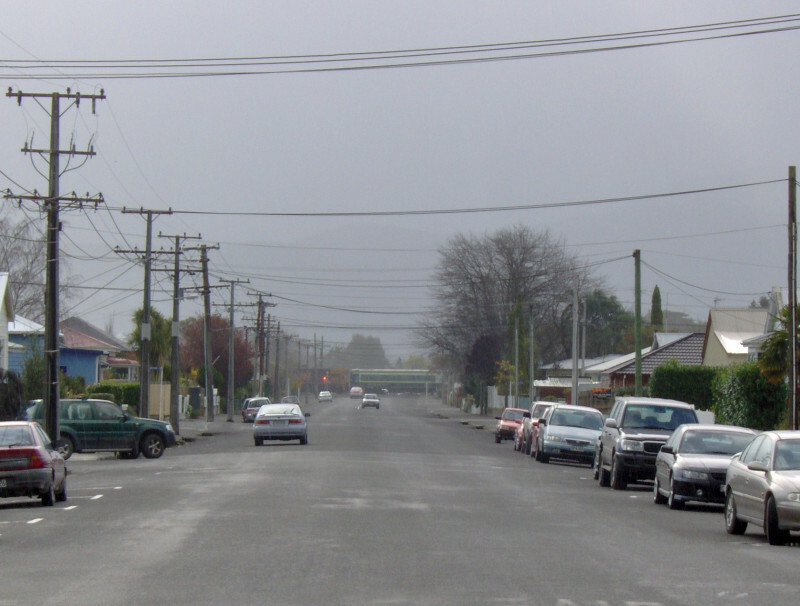 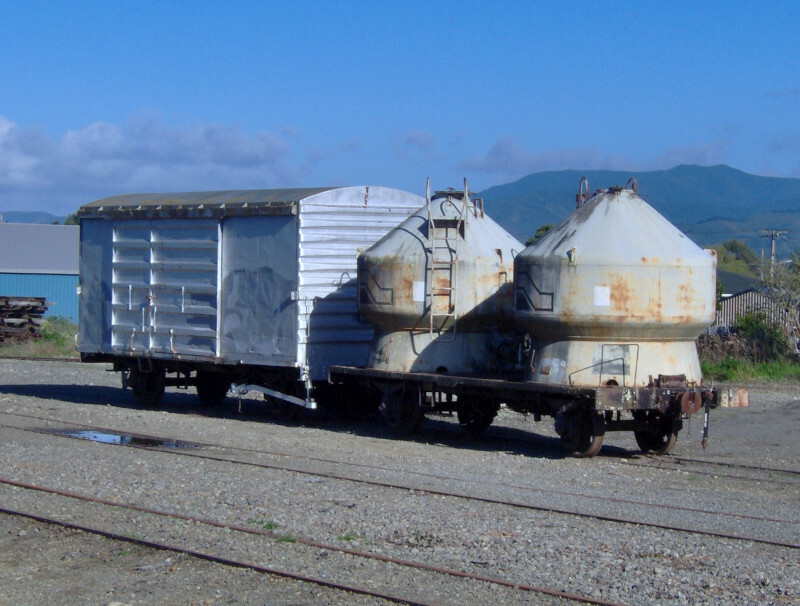 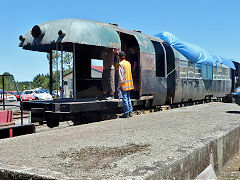 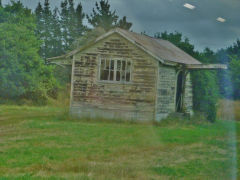 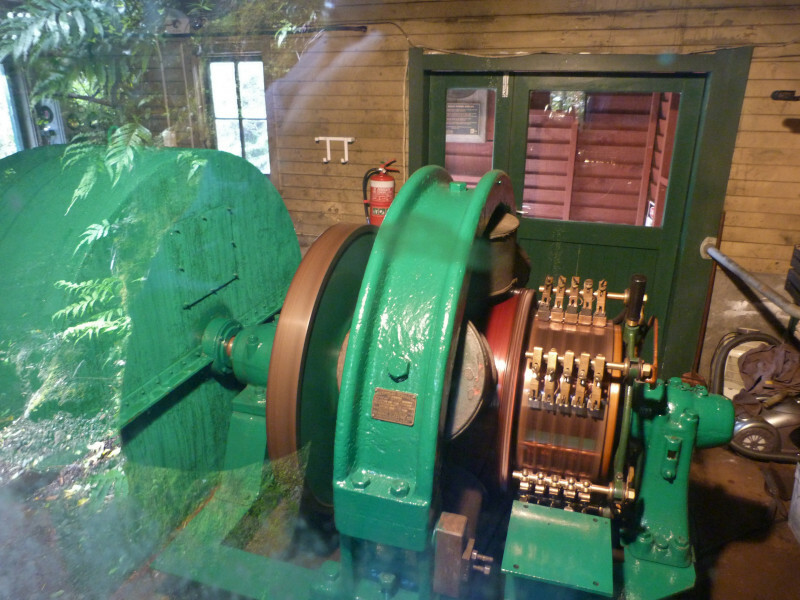 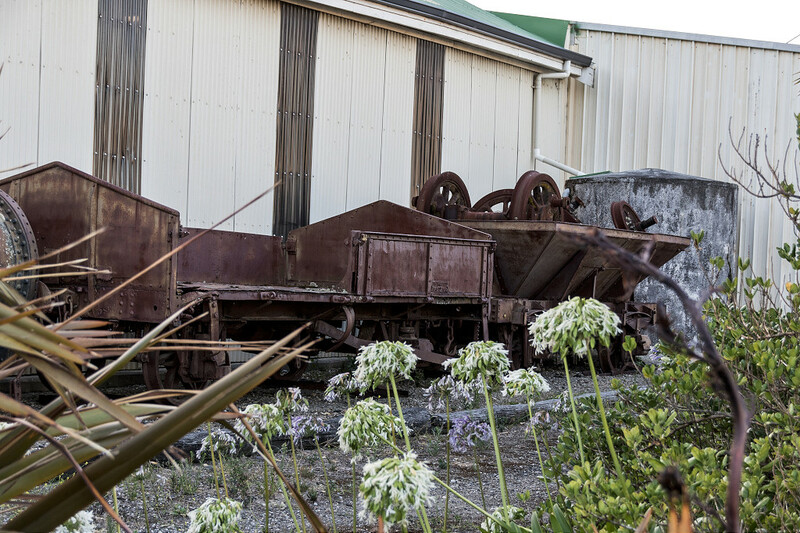 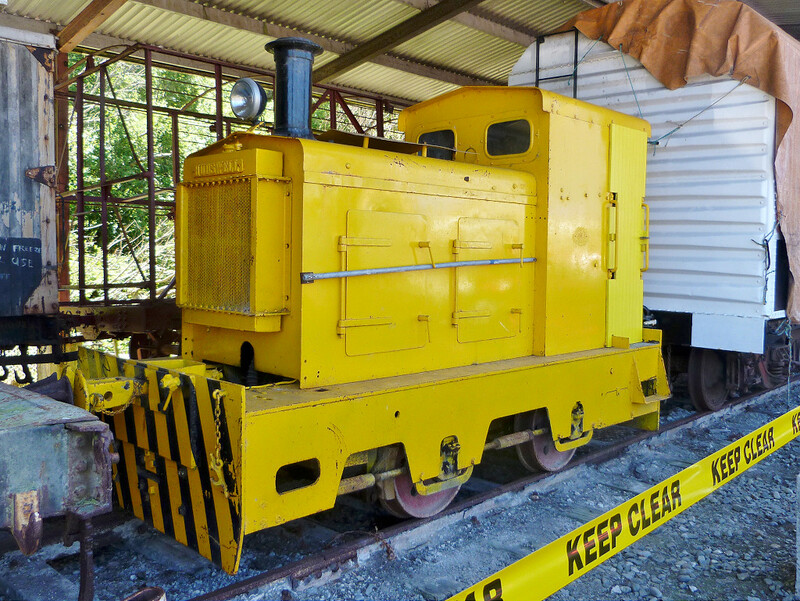 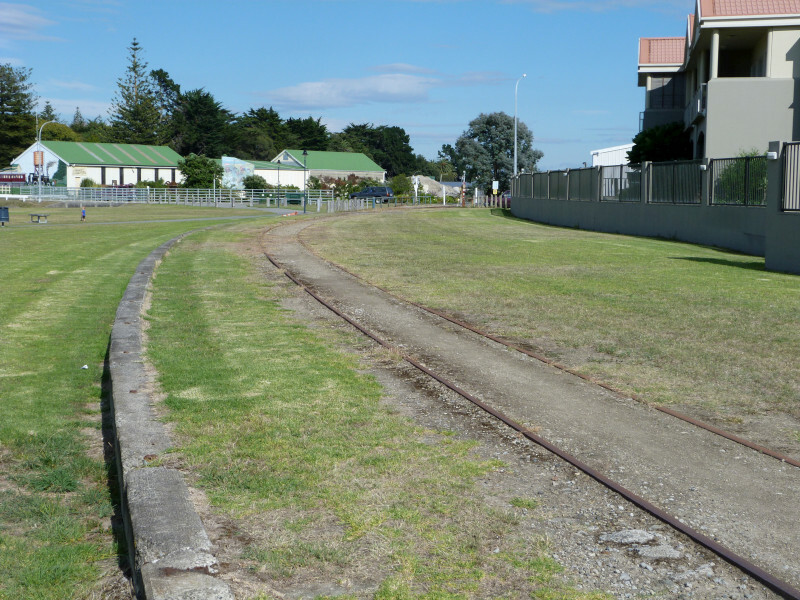 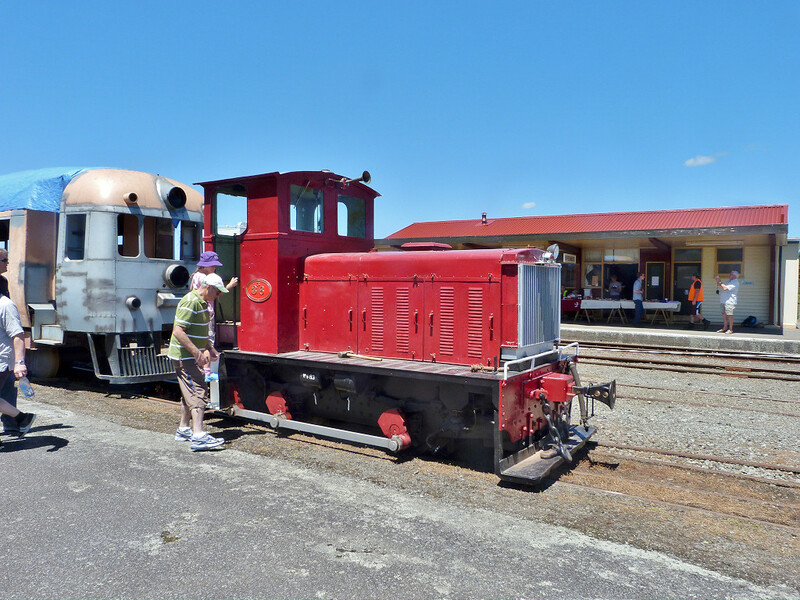 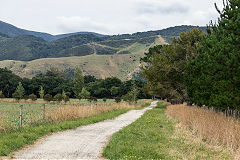 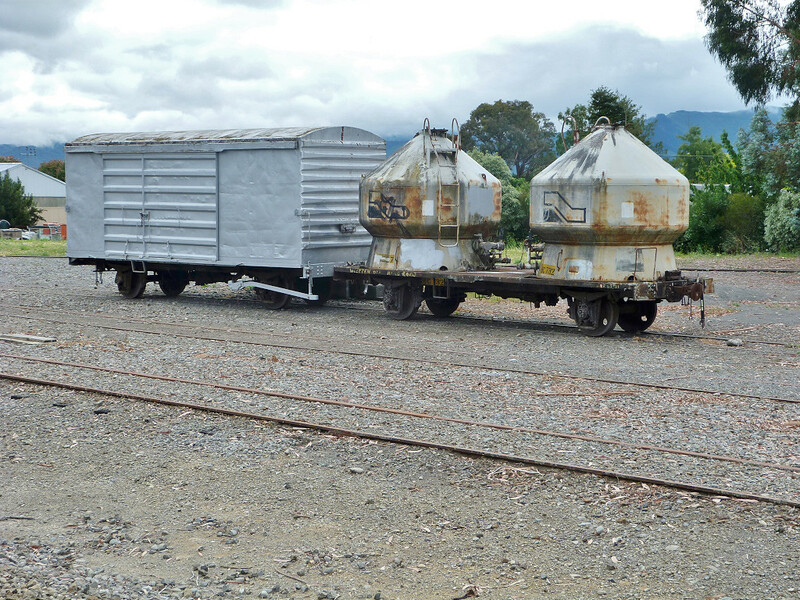 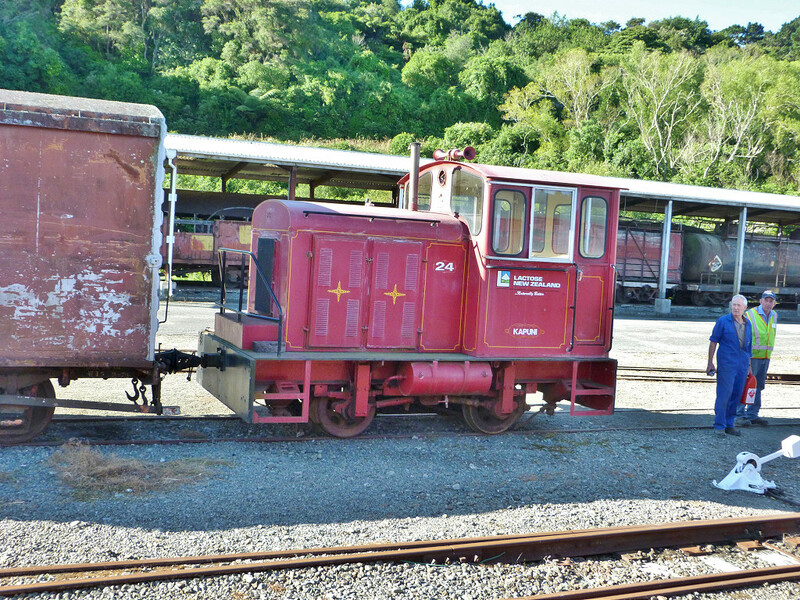 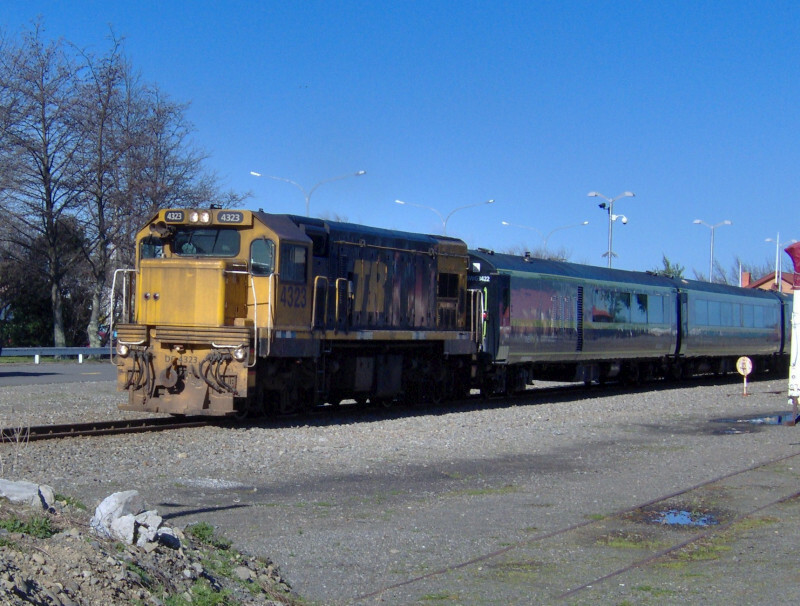 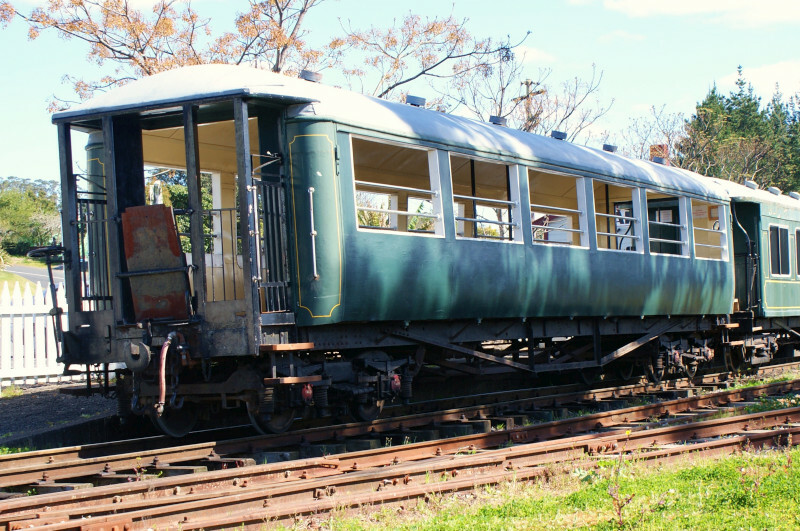 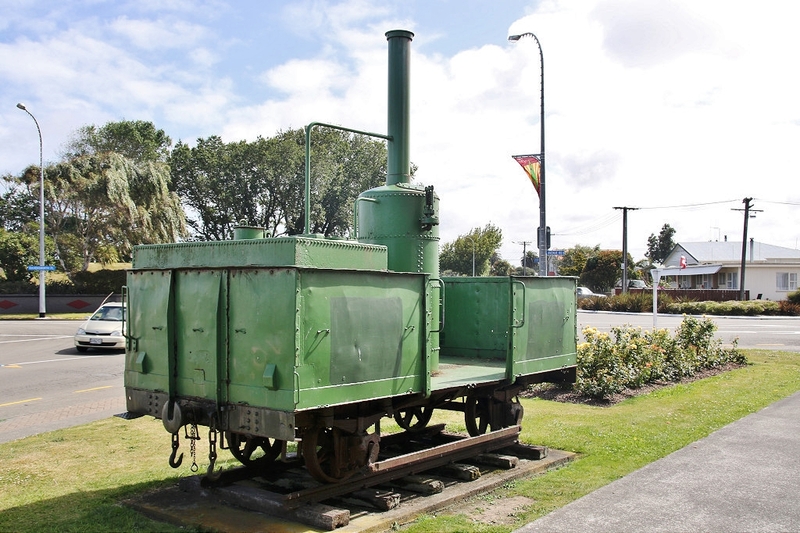 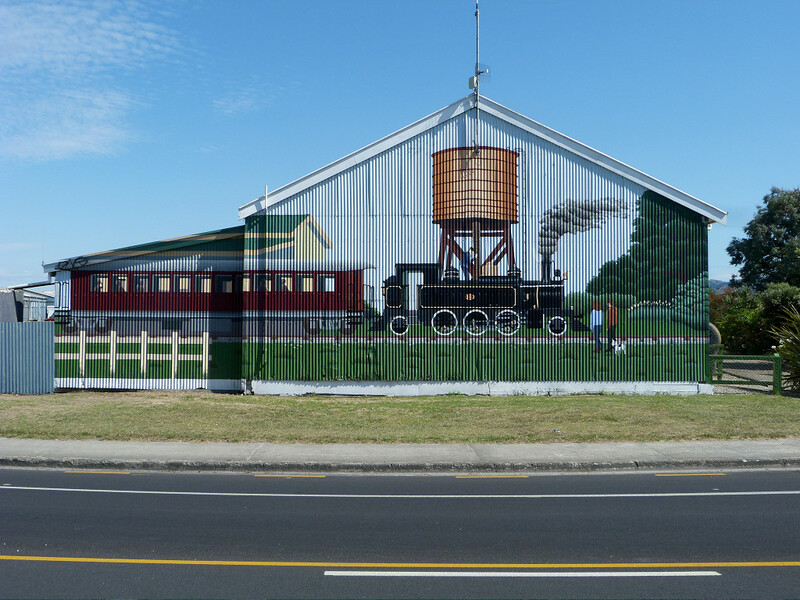 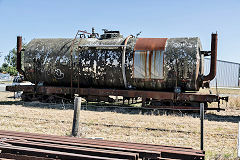 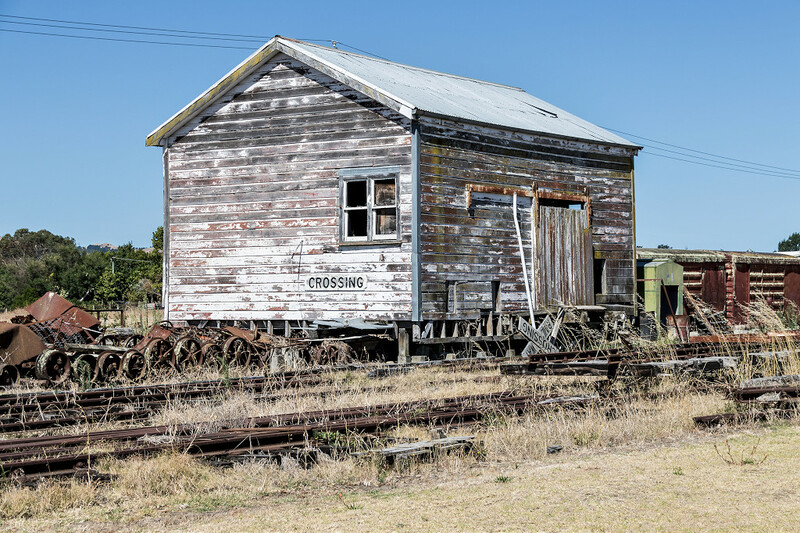 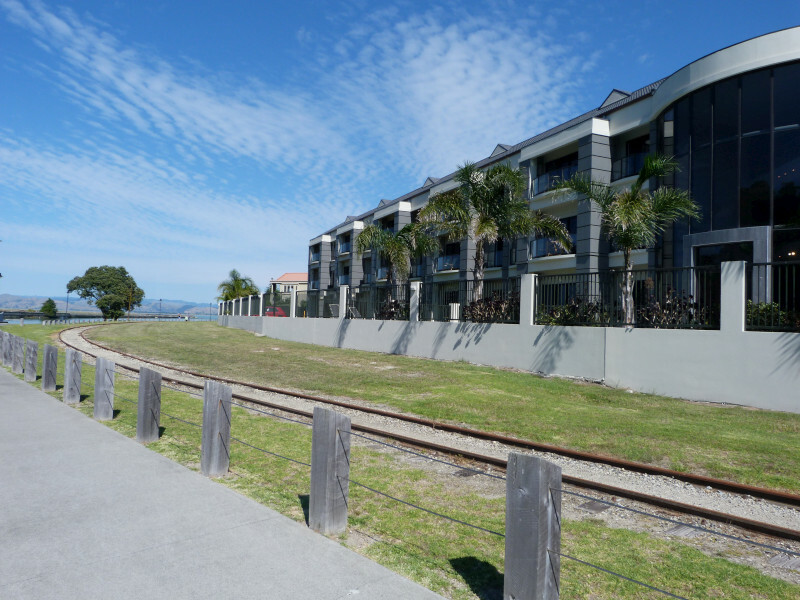 Gisborne is the home of the City Vintage Railway and the East Coast Museum of Technology. 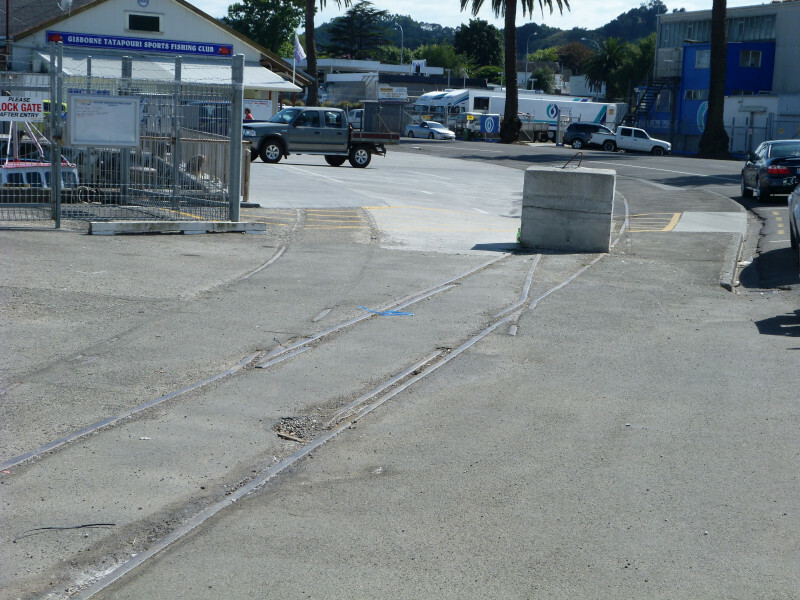 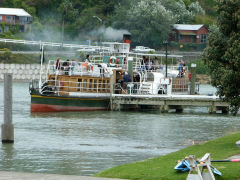 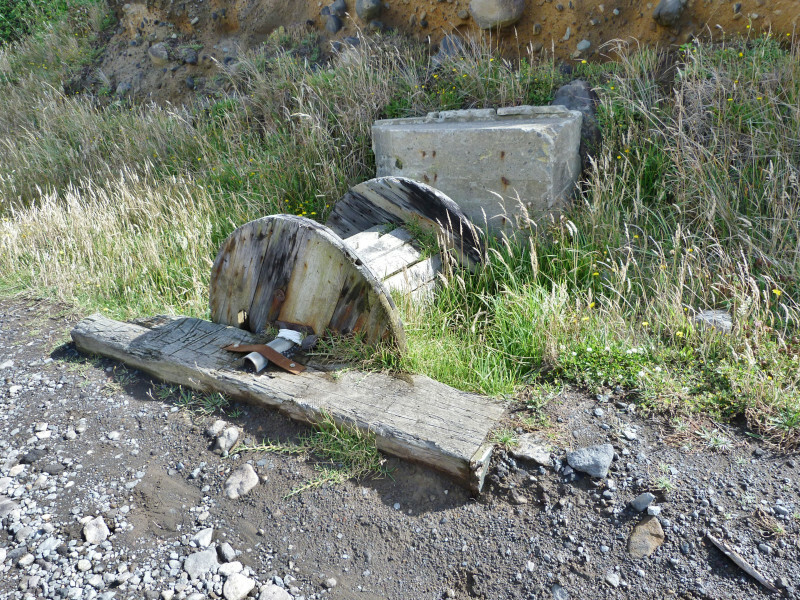 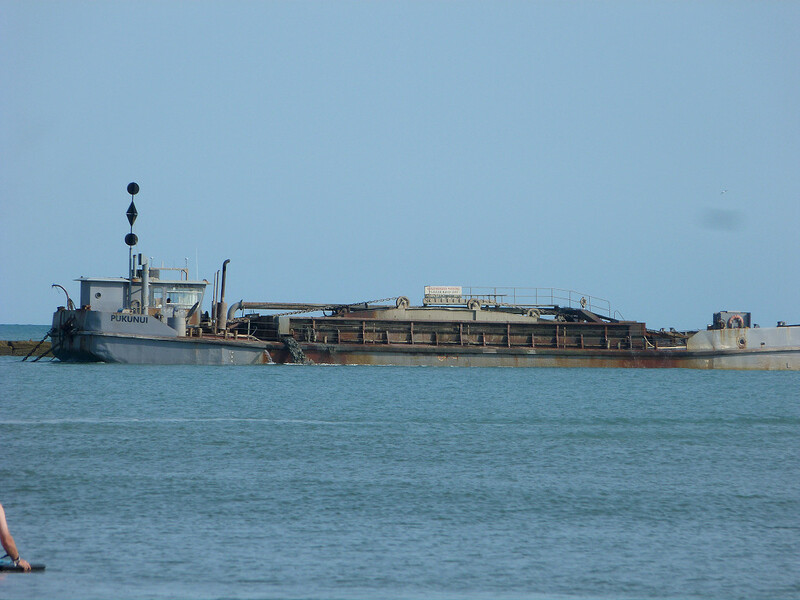 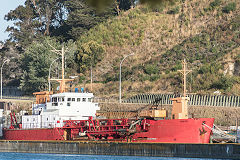 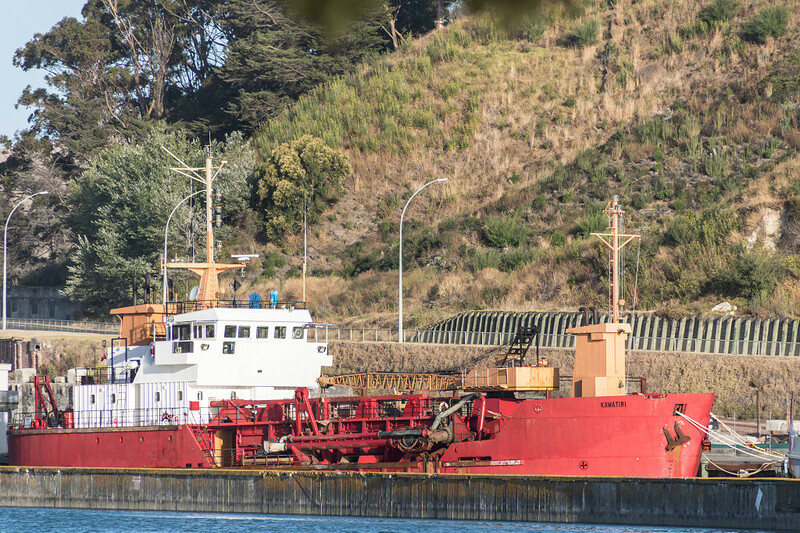 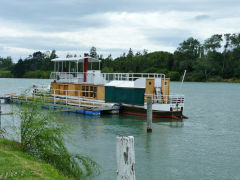 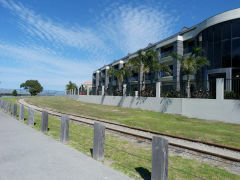 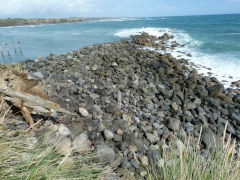 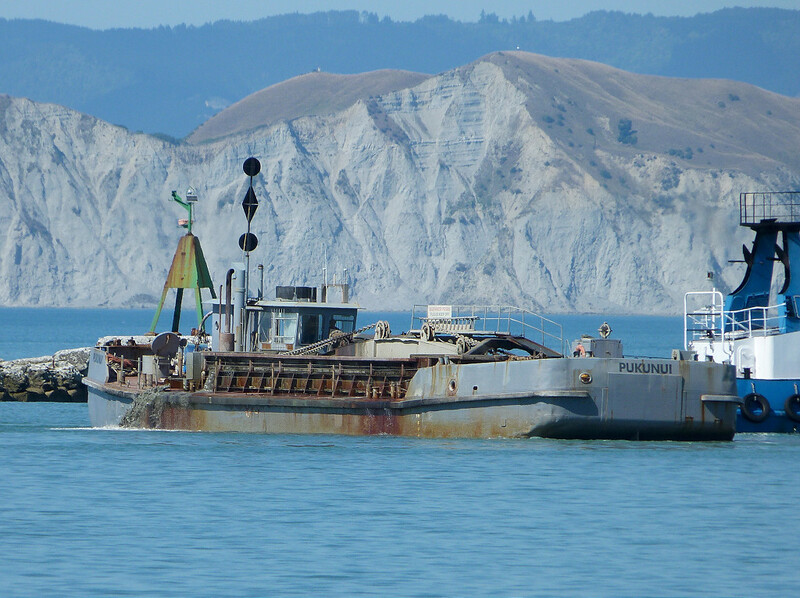 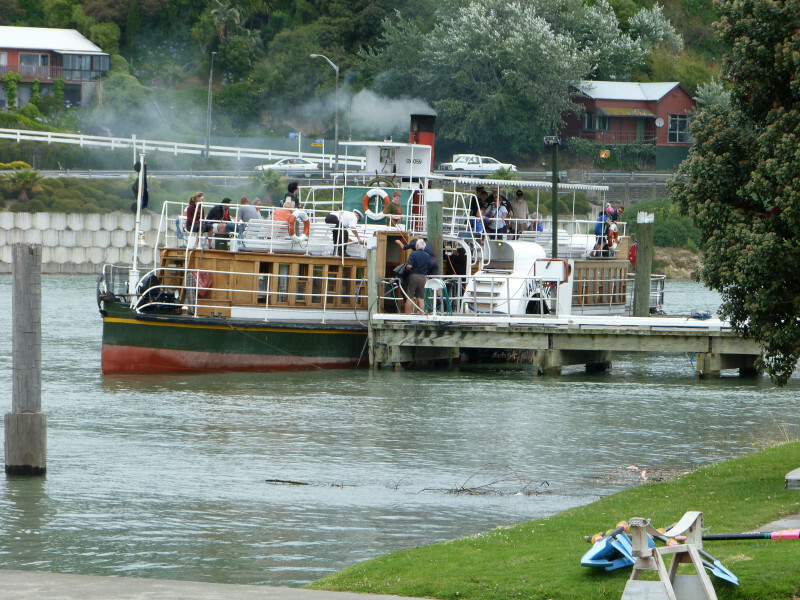 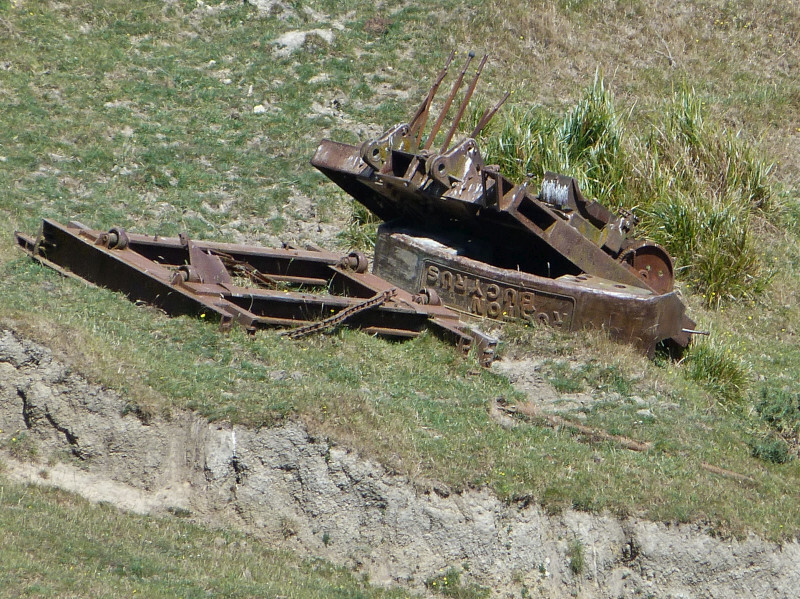 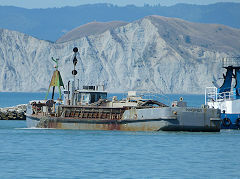 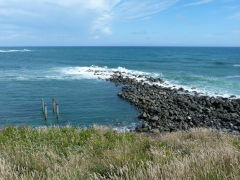 The Gisborne Harbour branch is also well worth walking along. 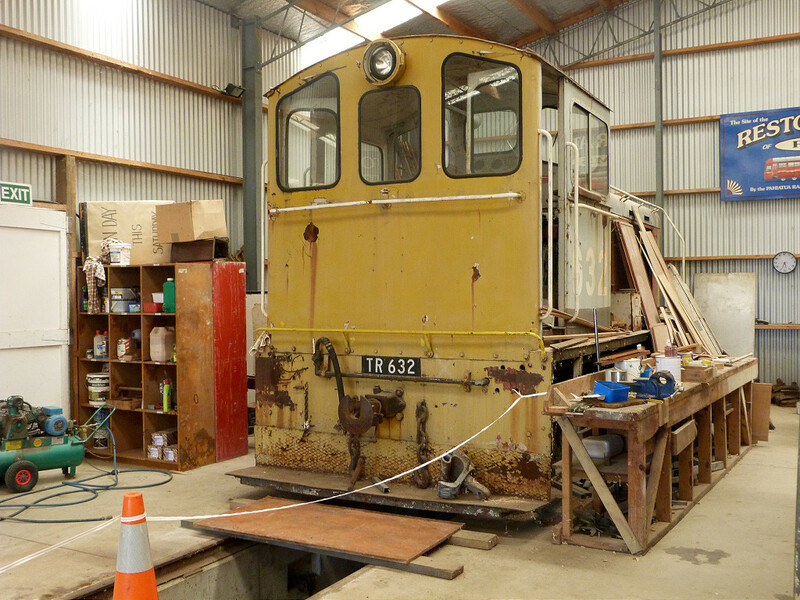 A quick look at the stock of the East Coast Museum of Technology at Gisborne just as it was closing for the day. 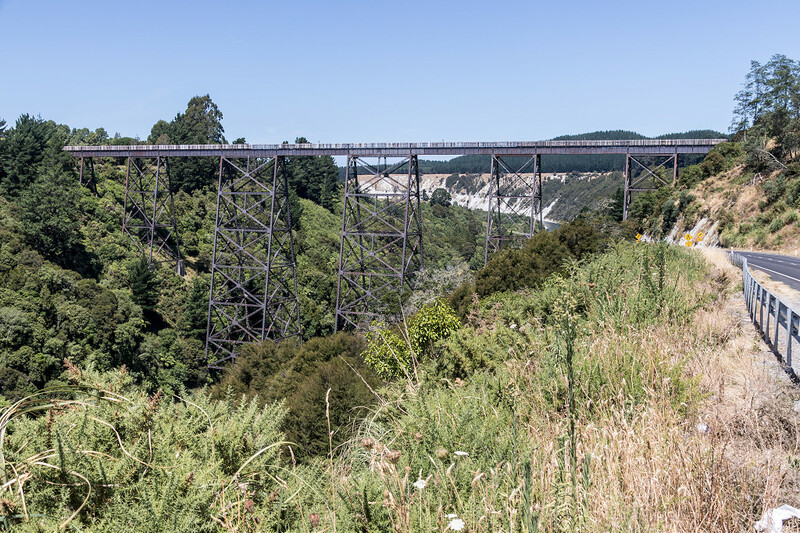 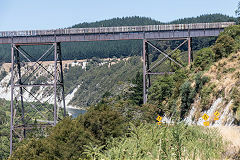 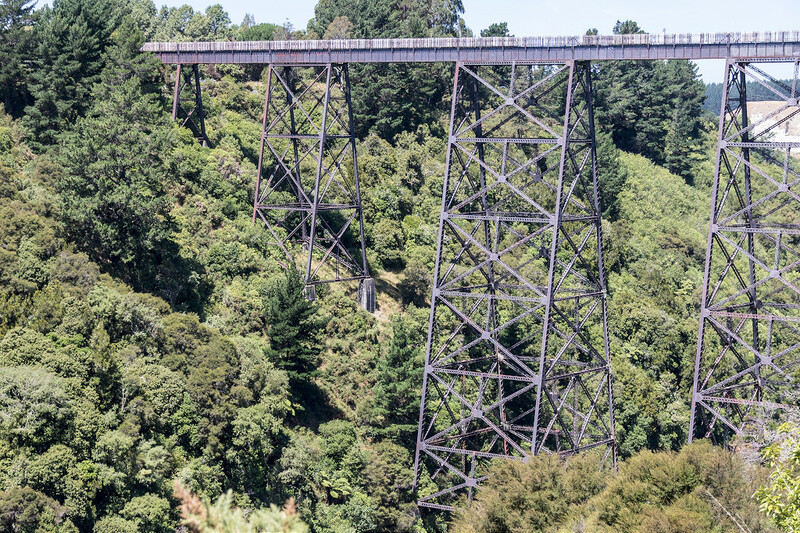 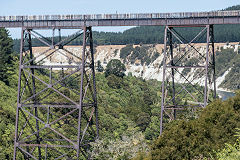 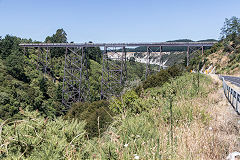 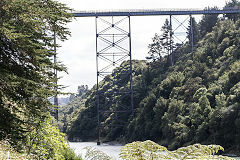 Mohaka Viaduct was built between 1930 and 1937 by the PWD and is 908ft long and 312ft tall, being the highest viaduct in New Zealand, in fact the whole of Australasia. 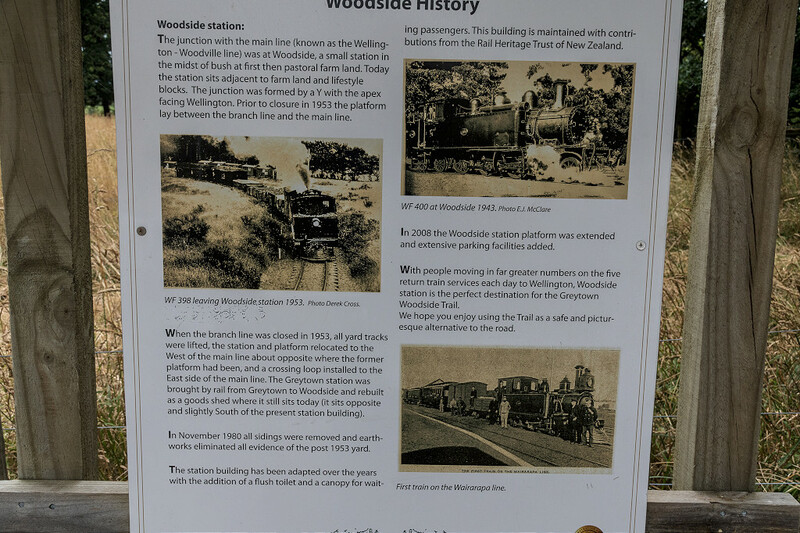 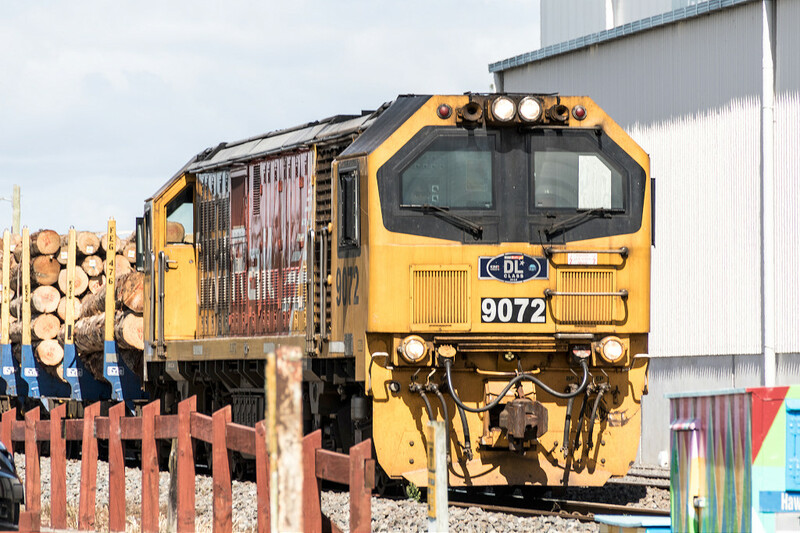 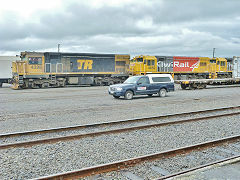 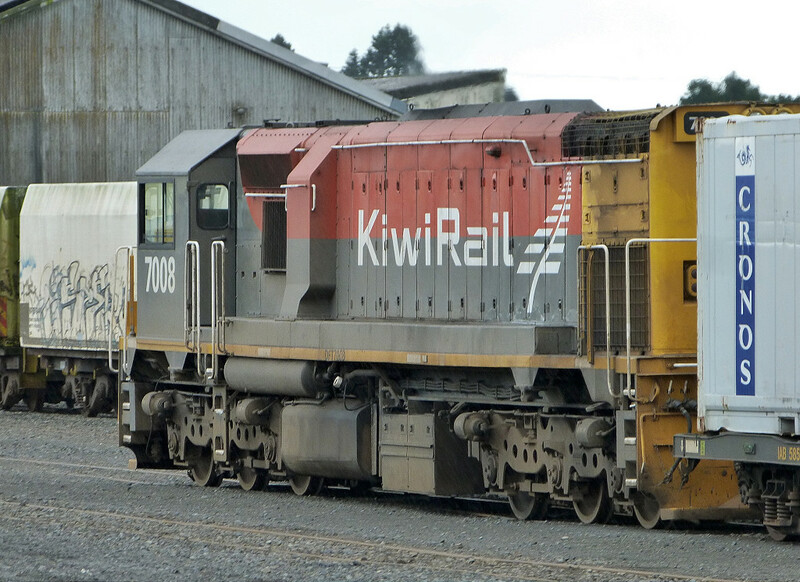 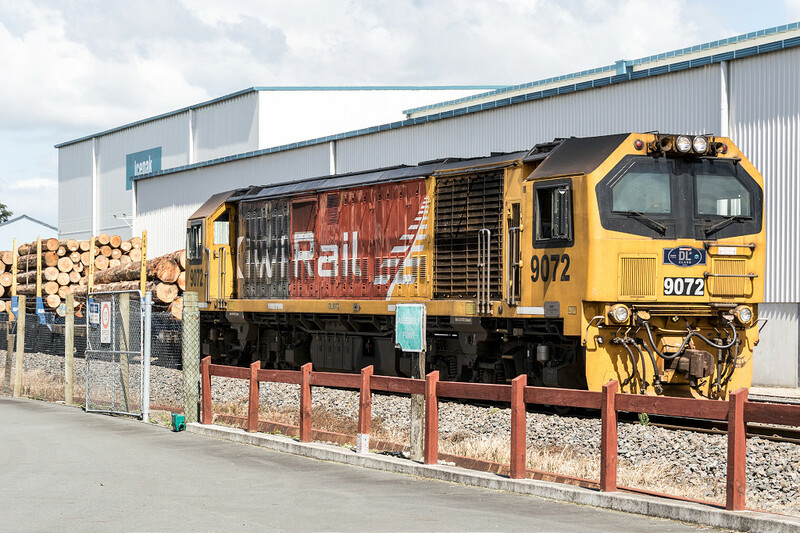 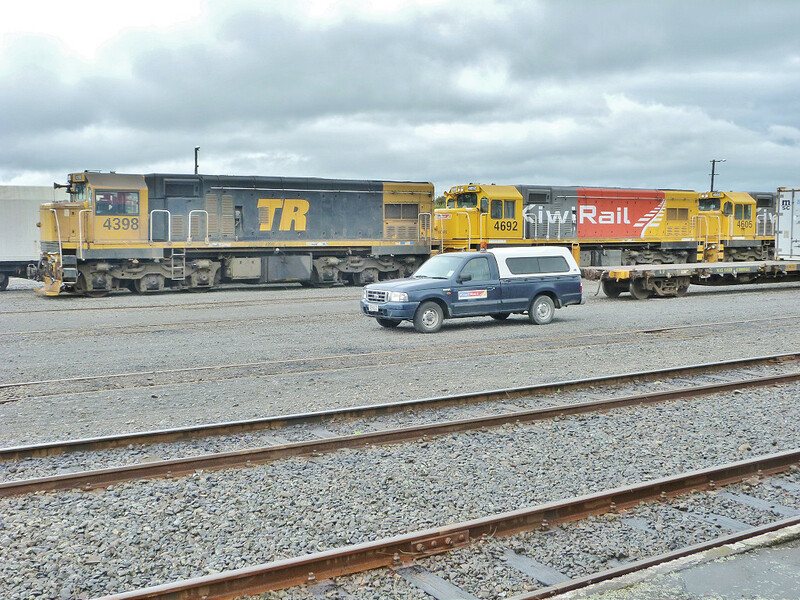 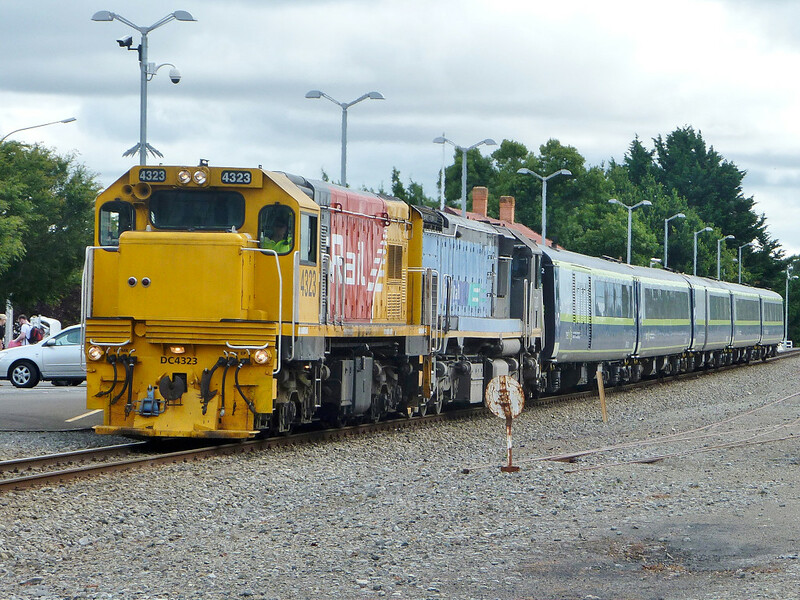 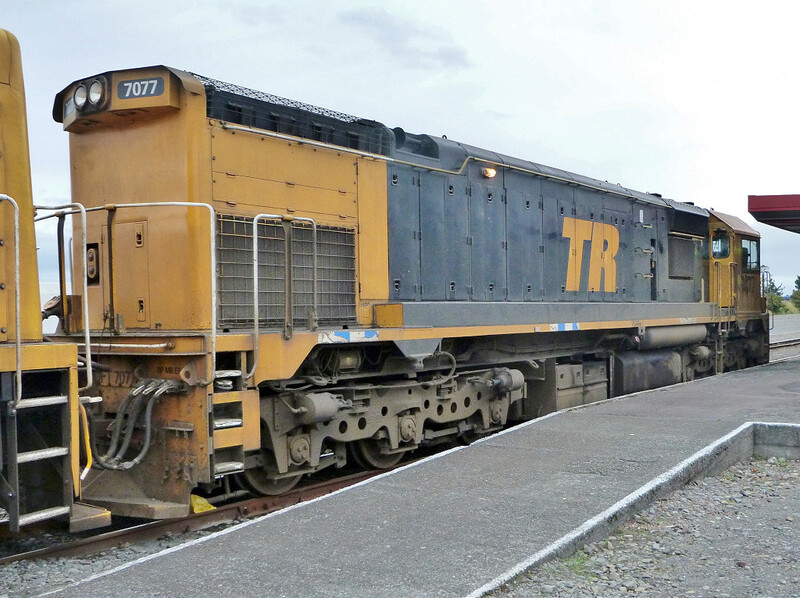 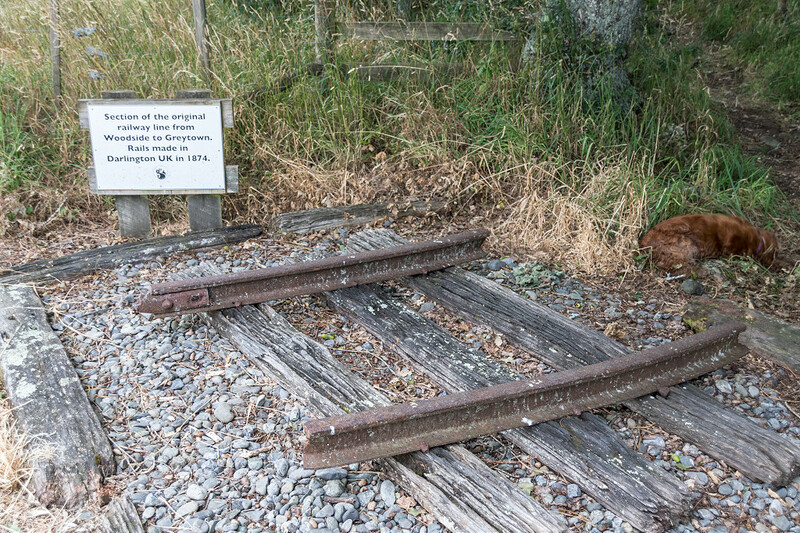 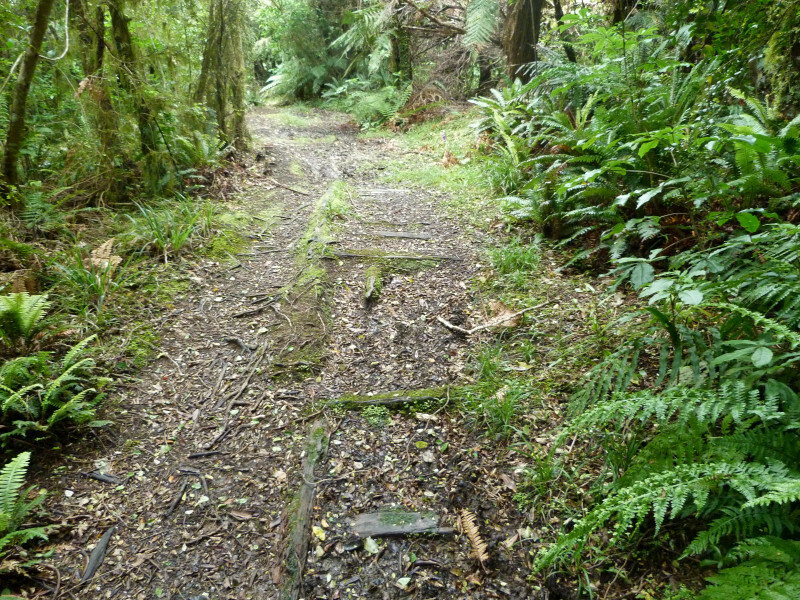 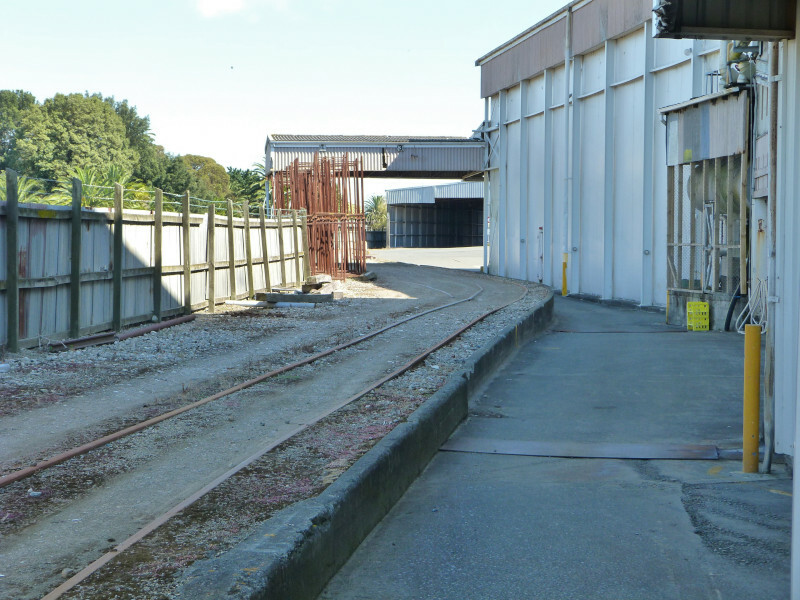 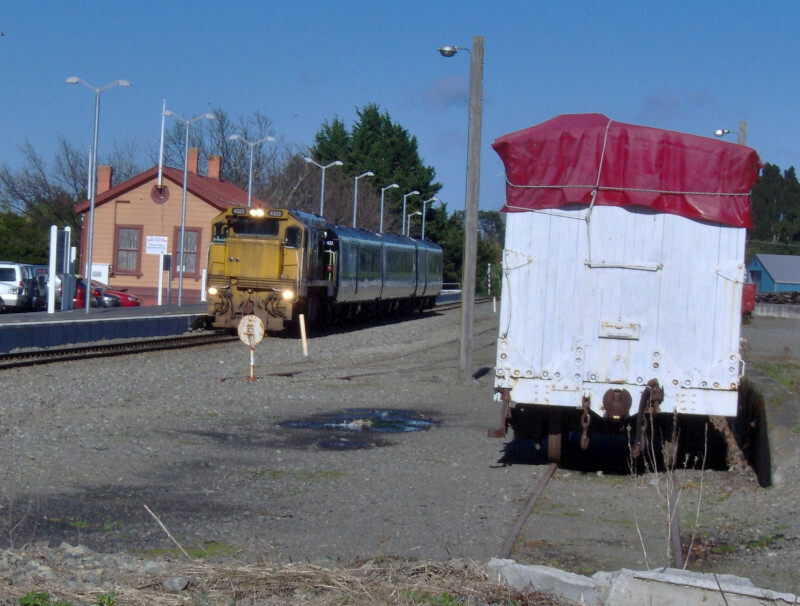 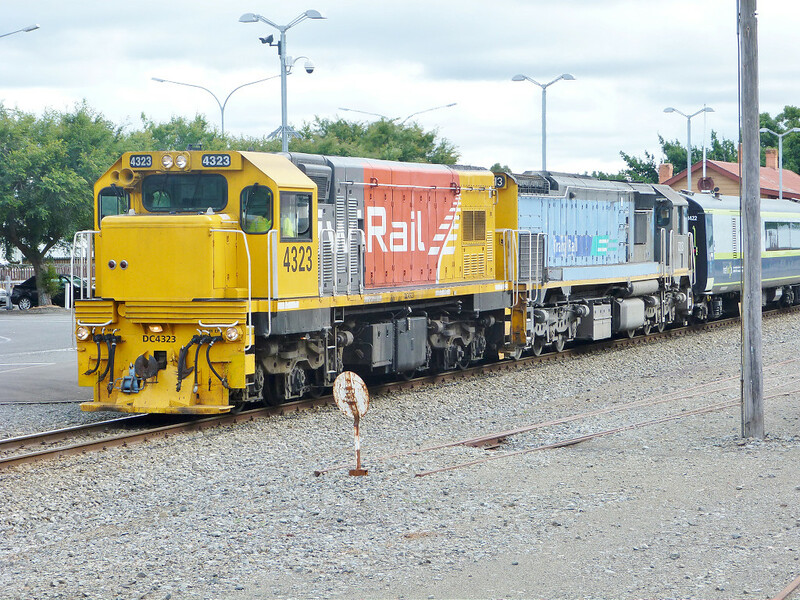 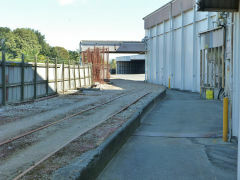 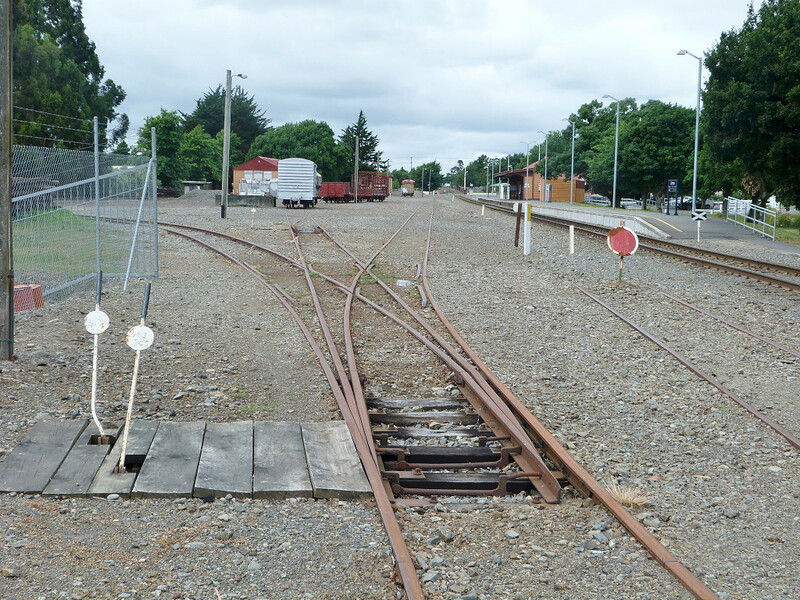 The line was disused from 2012 to 2017 but logging trains have begun again from Wairoa. 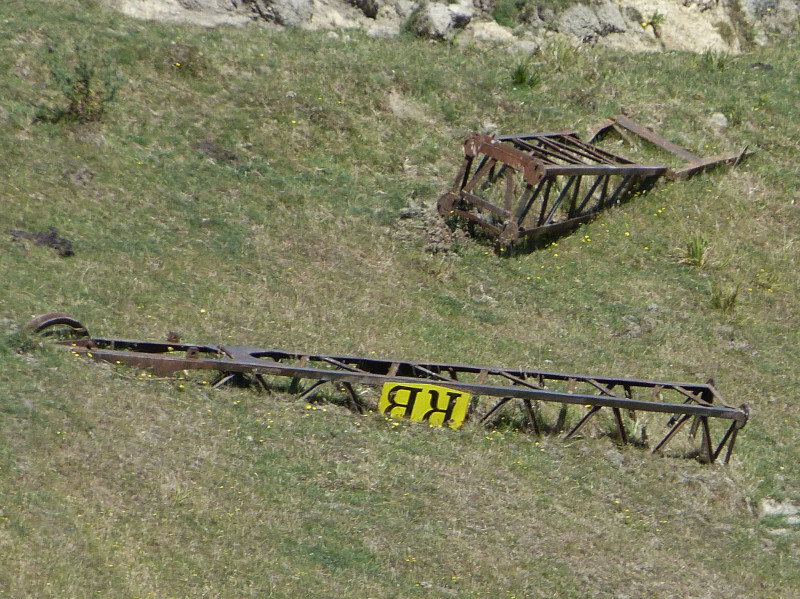 Between Stratford and Whangamomona off SH43 near Strathmore. Constructed in 1907, the timber lining had decayed by 1919 and was replaced by the present concrete pillars. A major upgrade followed in 1998. 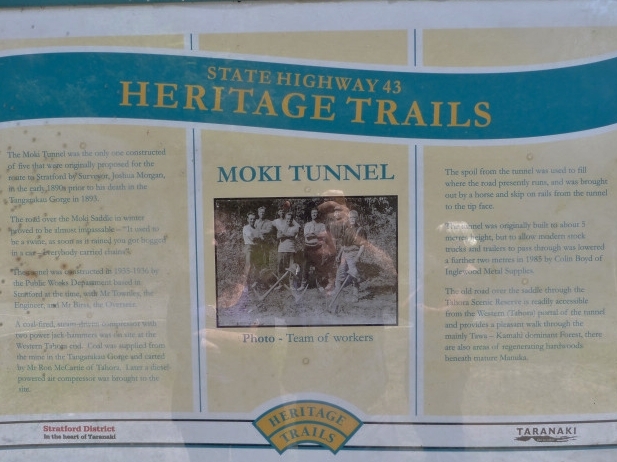 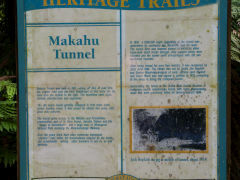 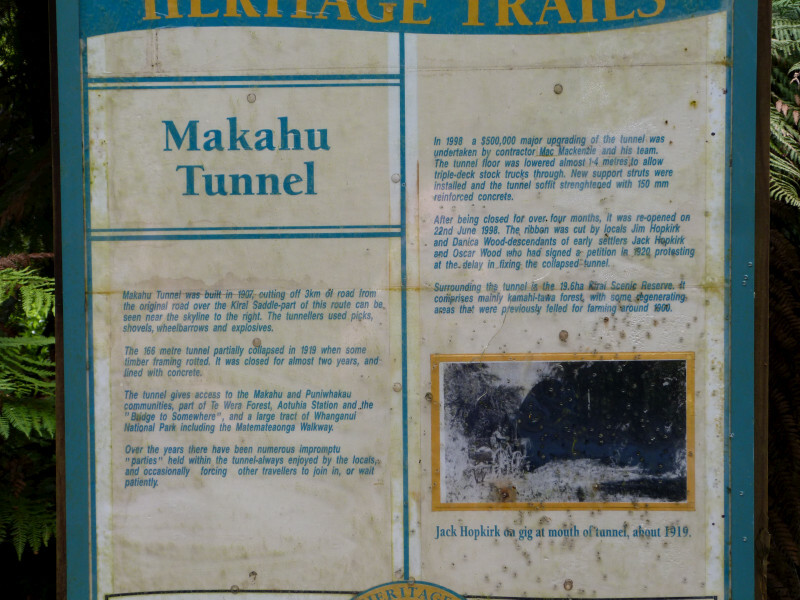 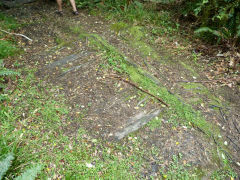 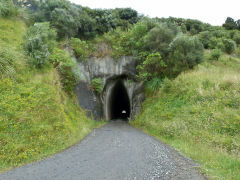 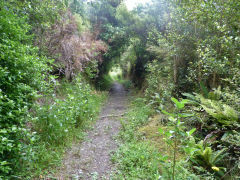 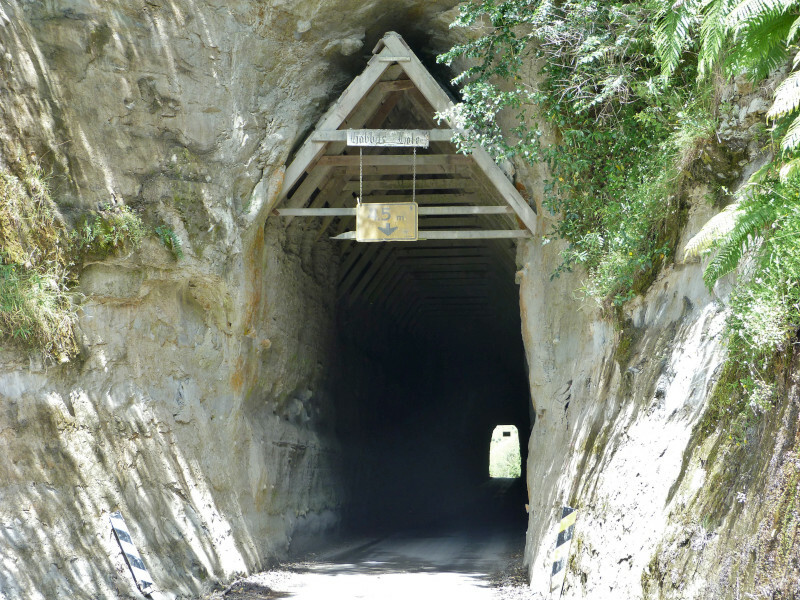 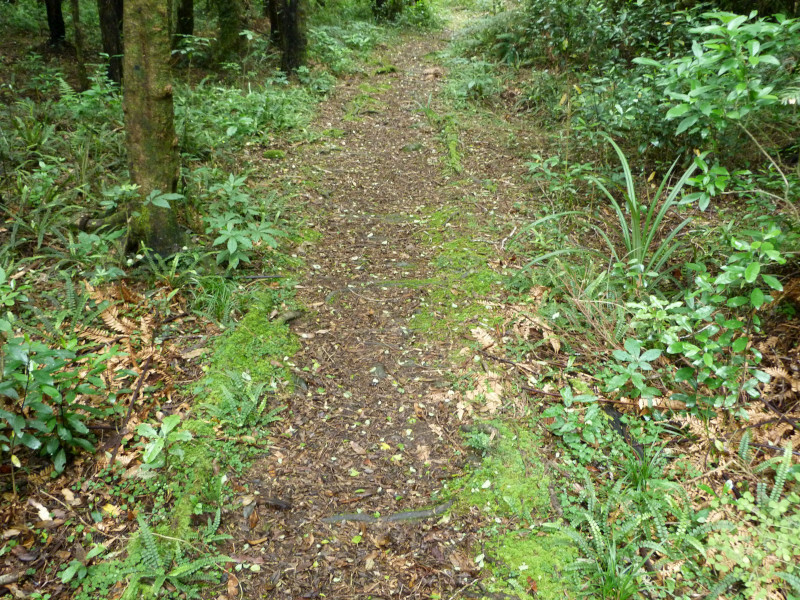 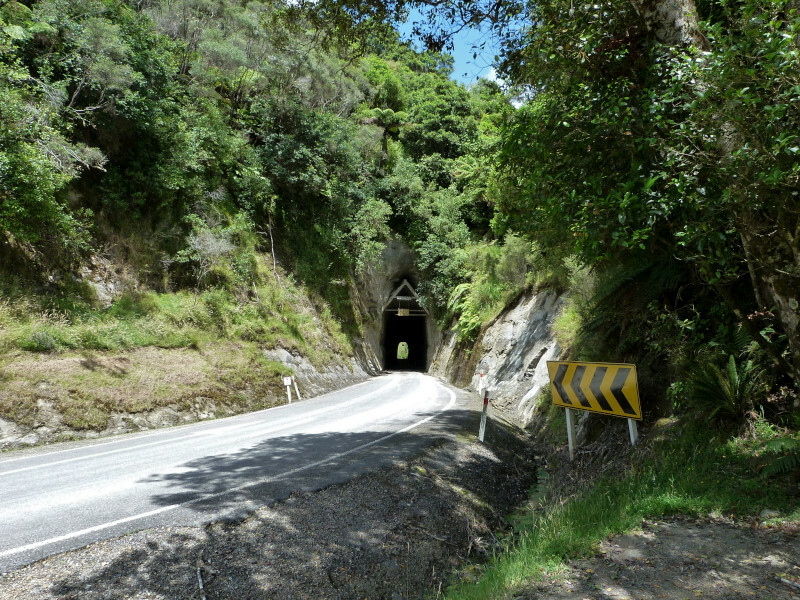 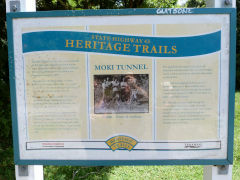 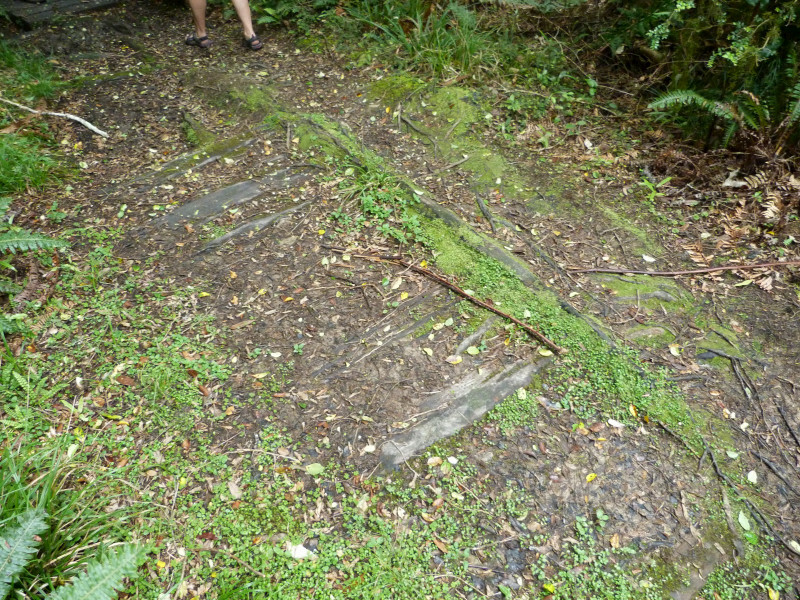 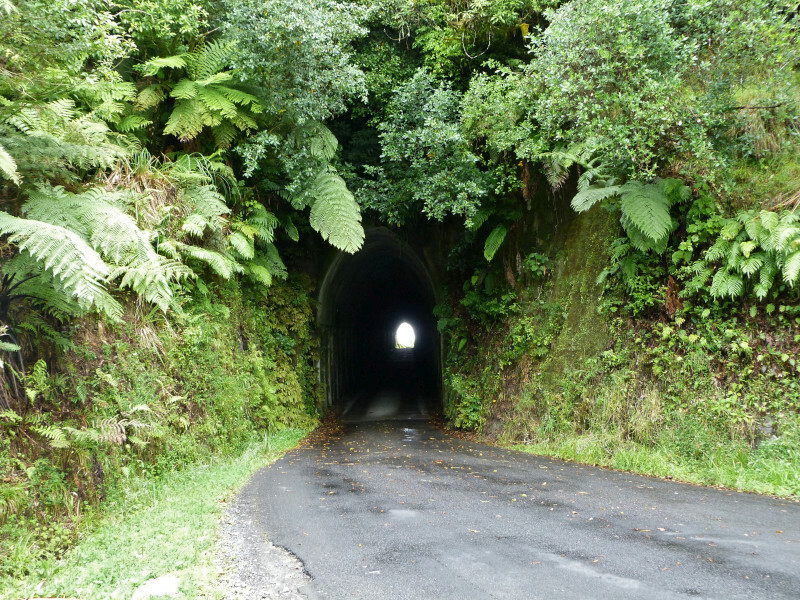 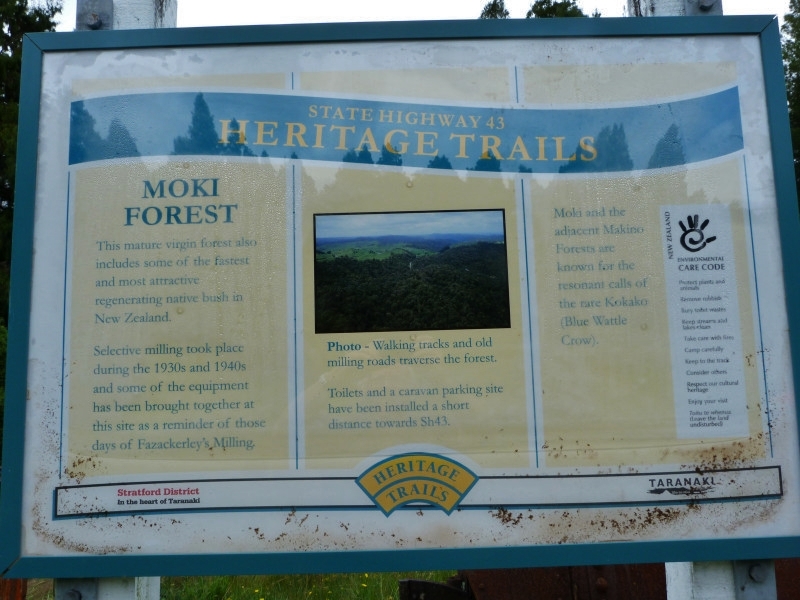 The Moki Tunnel was one of five tunnels proposed by Joshua Morgan (a surveyor in Whangamomona) in the 1890s, before his unfortunate death in 1893. 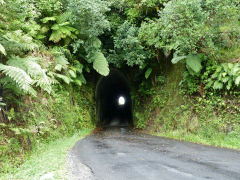 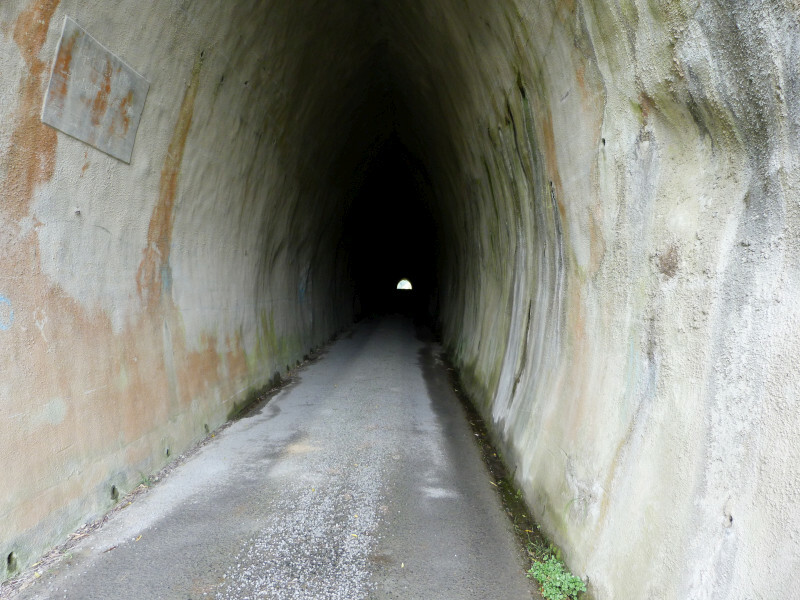 This tunnel was the only one to be constructed out of the five, constructed in 1935-1936 by the Public Works Department, after they had completed metalling the road. Mr. Townley was the engineer, and Mr. Birss the overseer. 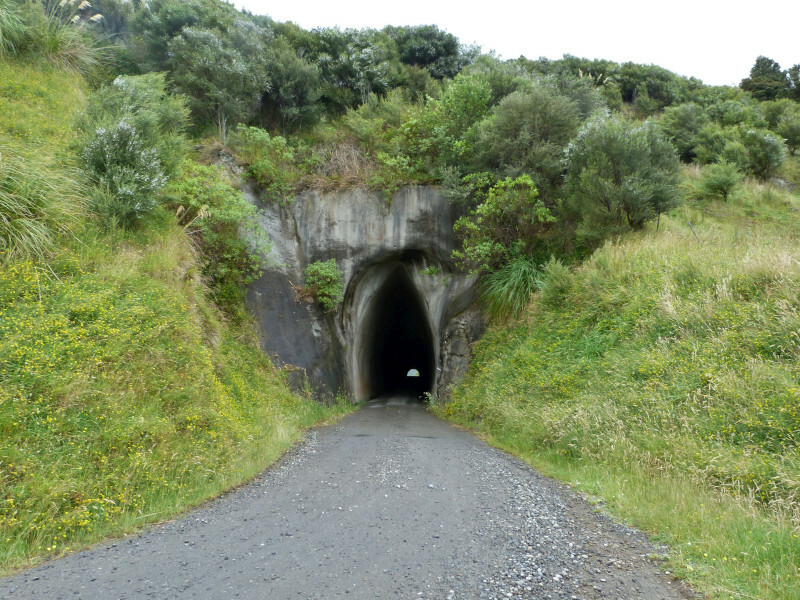 It was dug using two power jack-hammers driven by a coal-fired steam compressor, which was situated at the western Tahora end of the tunnel. 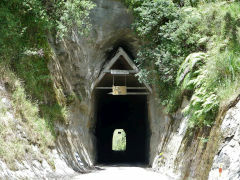 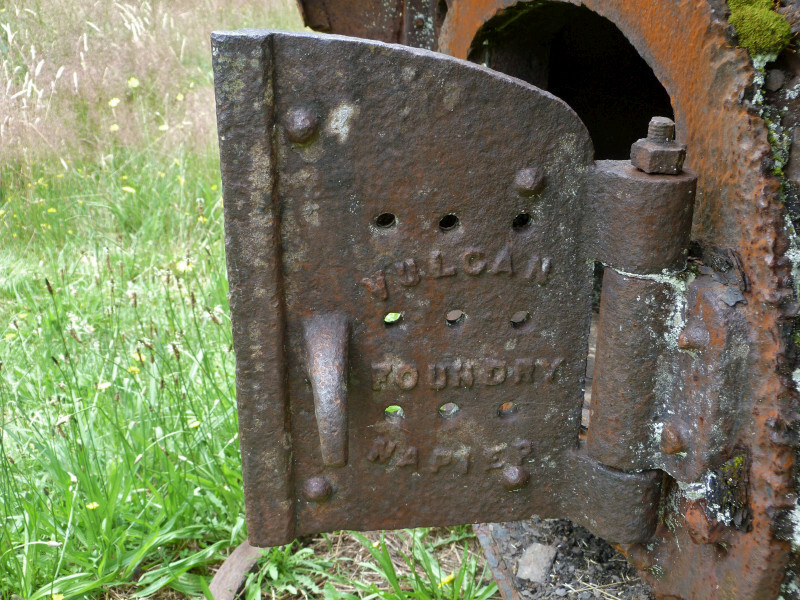 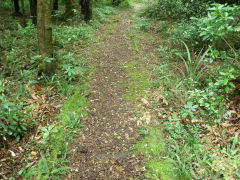 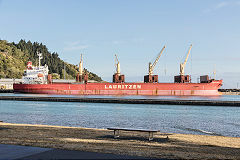 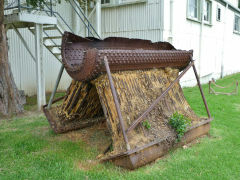 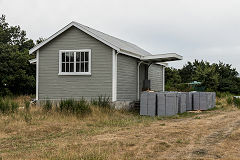 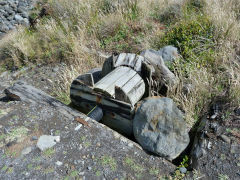 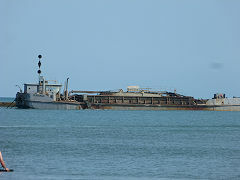 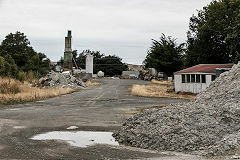 The coal was supplied from the Tangarakau Gorge mine, and was brought to the site by Mr. Ron McCartie, a Tahora settler. As the work on the tunnel continued, the coal-fired compressor was replaced with a diesel-powered air compressor, lessening the need for coal. 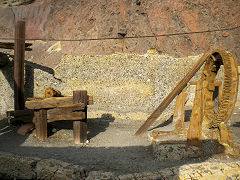 While the tunnel was being dug, many unique fossils were found. 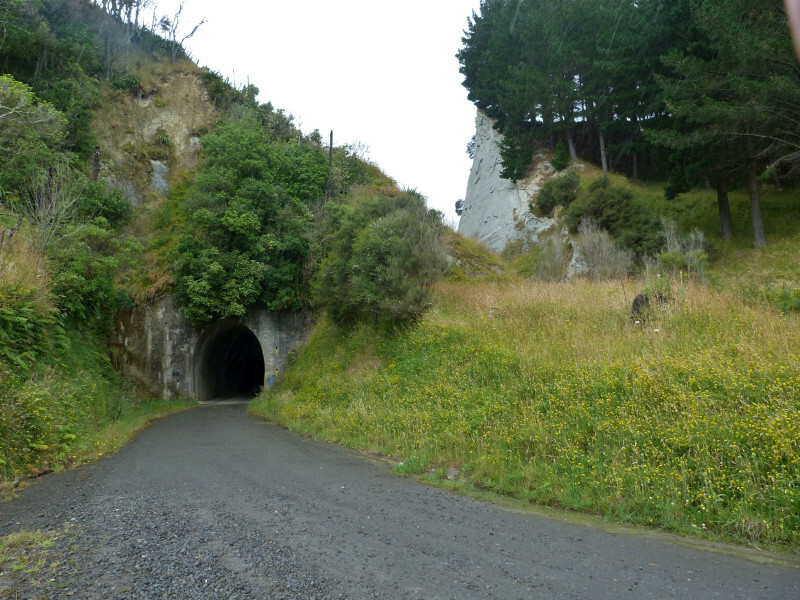 The spoil from the tunnel was carried out by horse and skip on steel rails that had been laid from the tunnel to the tip face, making the road wider on either side and was used to fill where the road presently runs, which has been broadened to a two-lane sealed road. 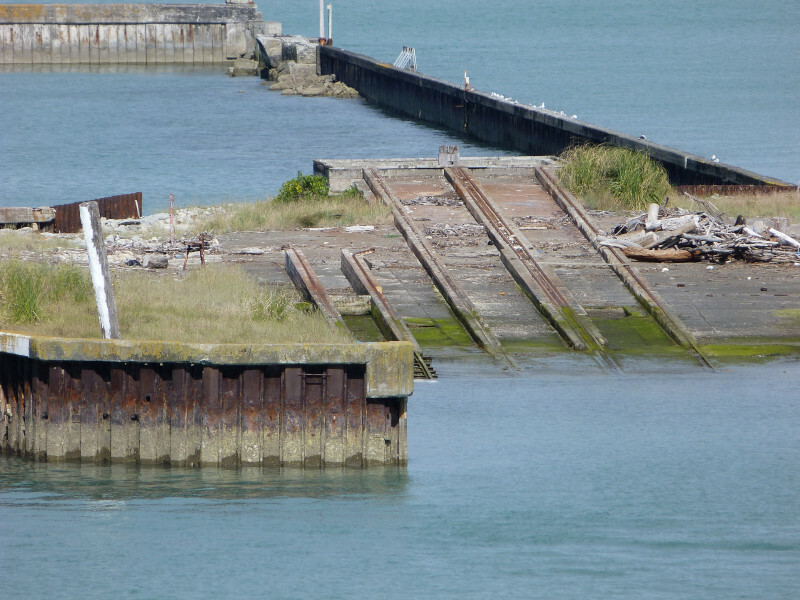 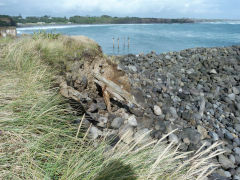 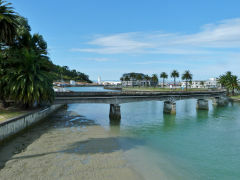 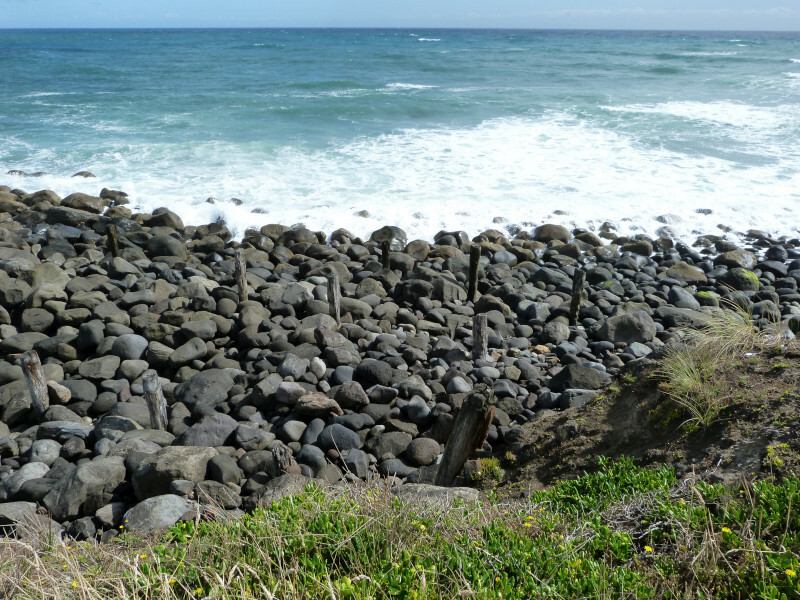 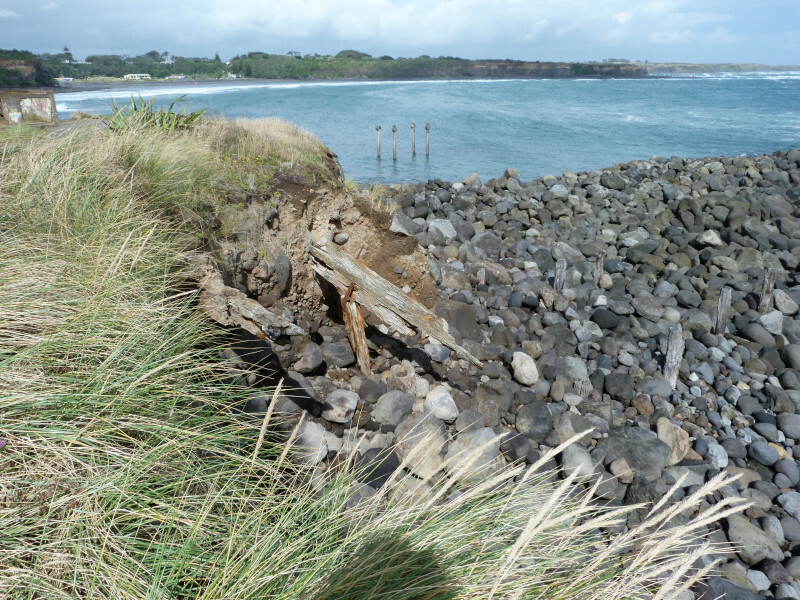 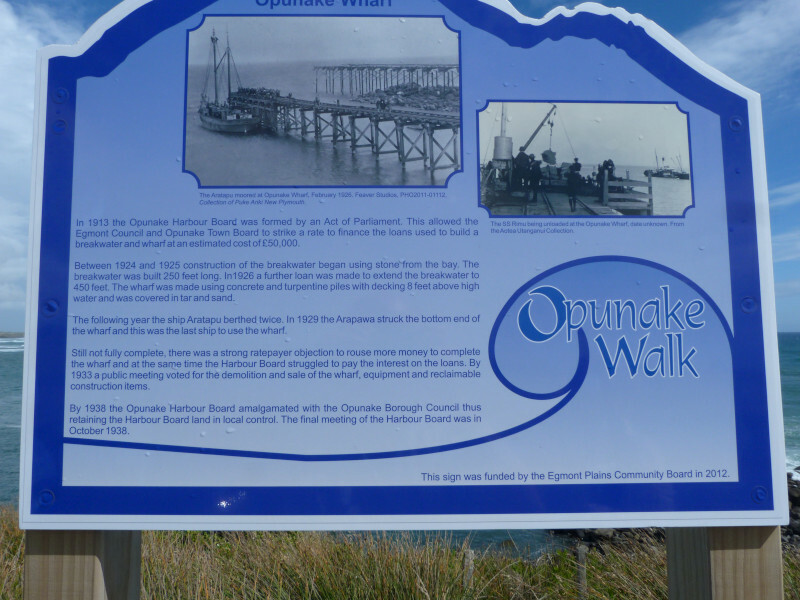 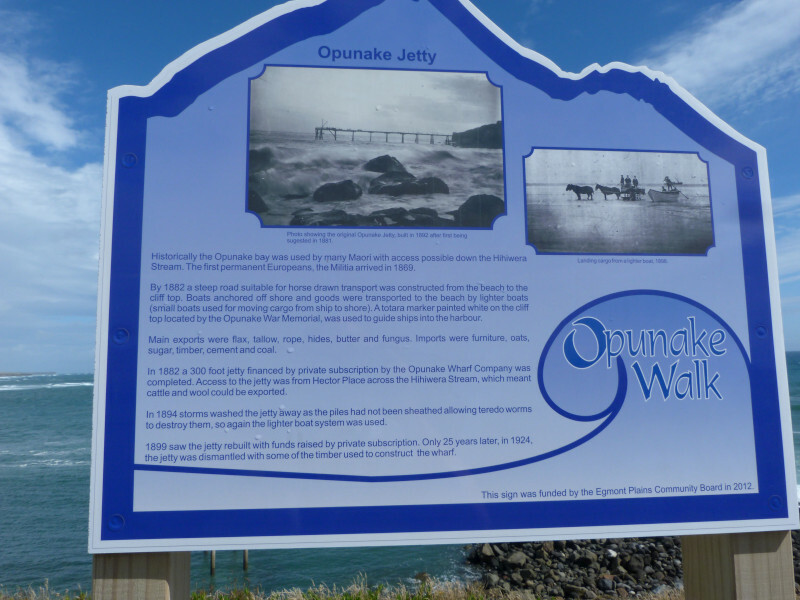 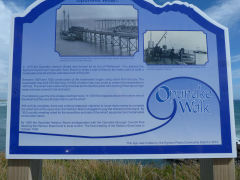 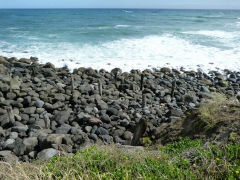 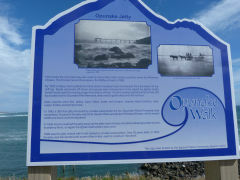 In 1882 a jetty was built at Opunake on the Southwest coast, followed by a breakwater and wharf in 1924. 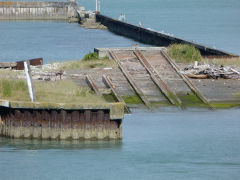 Unfortunately a ship hit the end of the wharf in 1929 and it was demolished in 1933. 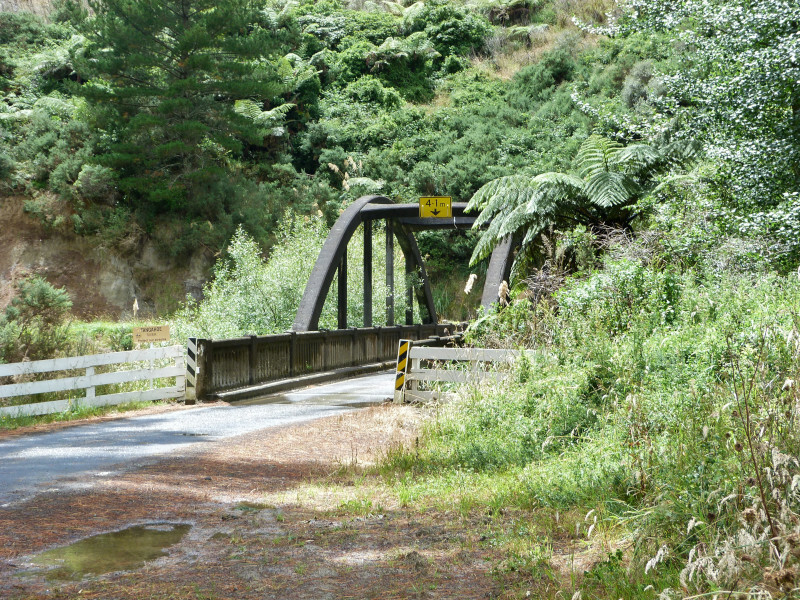 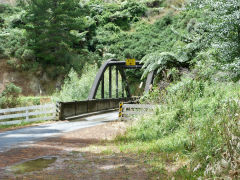 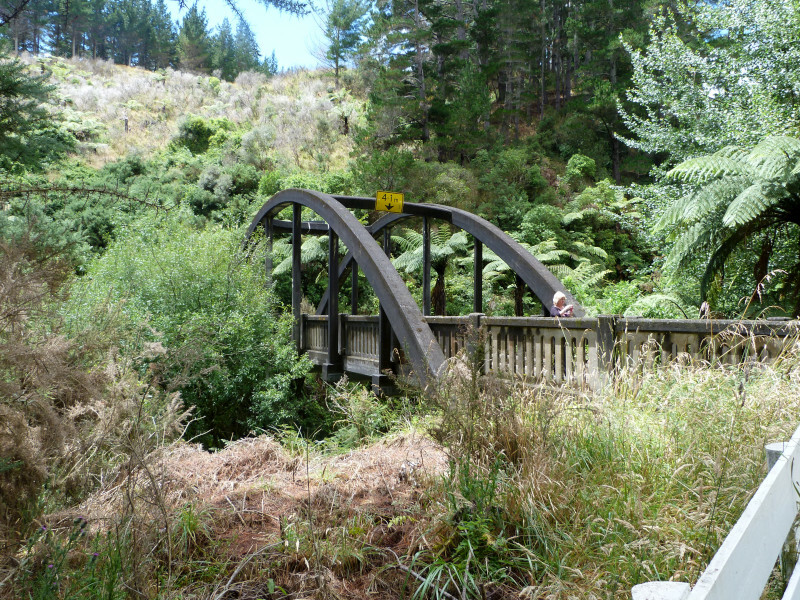 In 1937 a new bridge was built over the Tangahoe River on the Tangahoe Valley Road replacing a structure that had been destroyed by floods. It has an arch span of 24.2 metres. 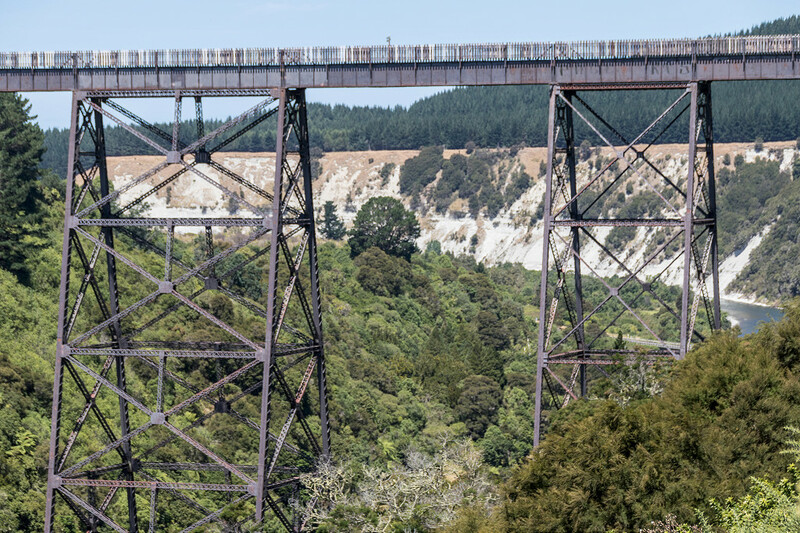 This is an interesting bridge, the deck passing through the arch about mid-point, with the legs of the arch anchored into the abutments in a visually impressive manner. 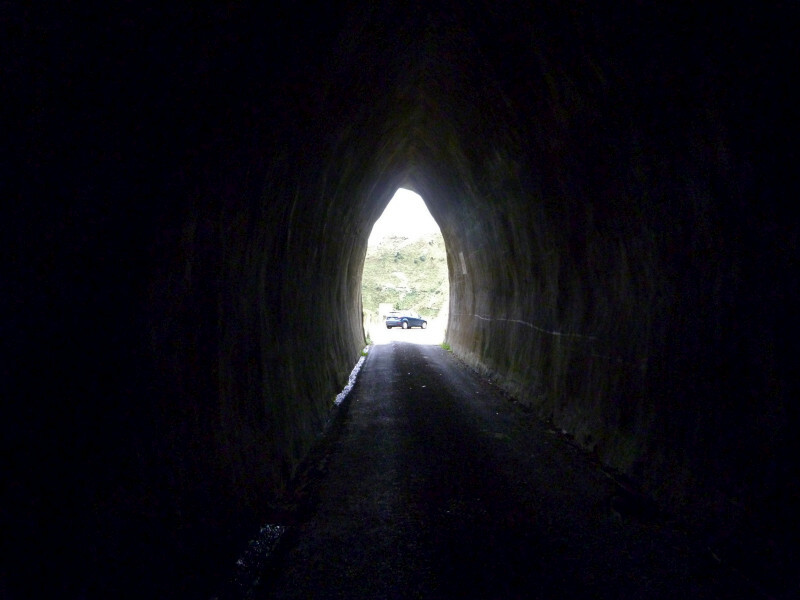 This is known as a half-through arch. 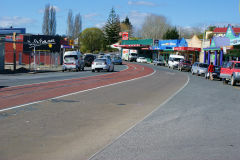 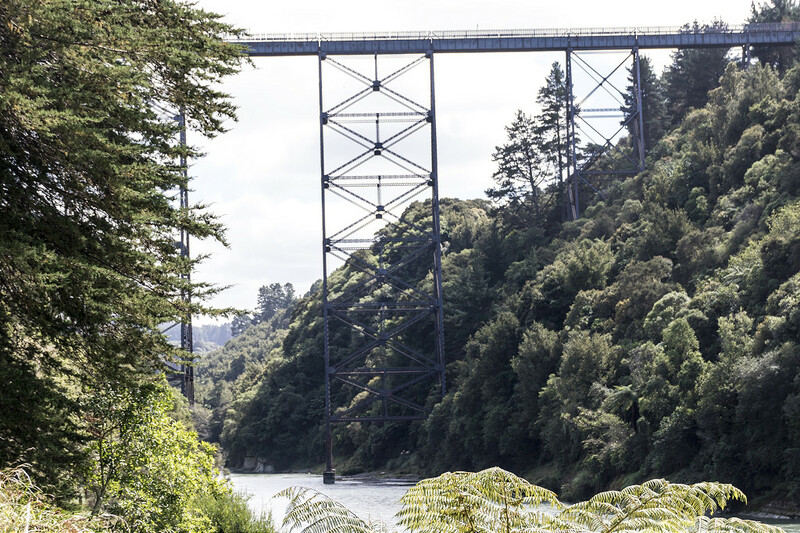 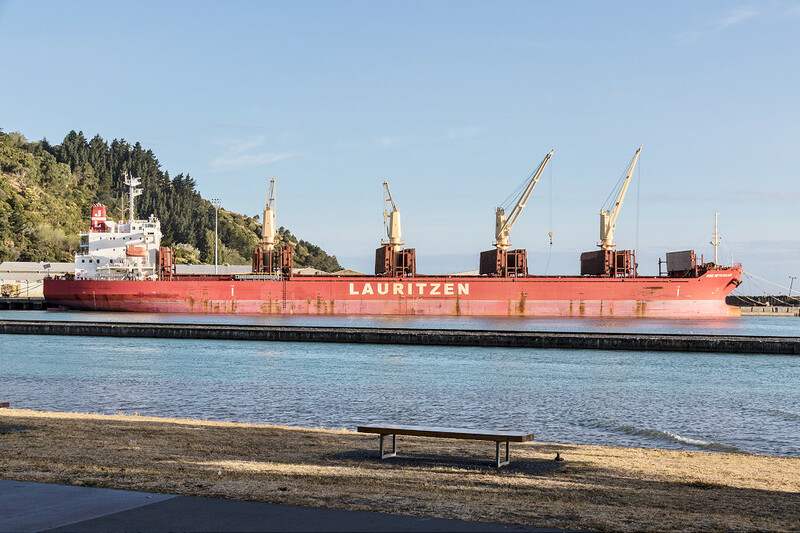 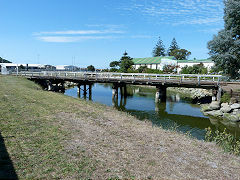 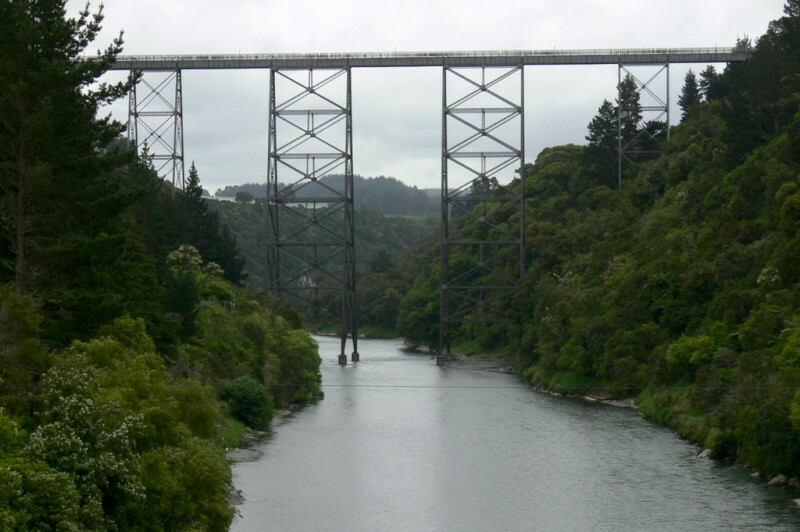 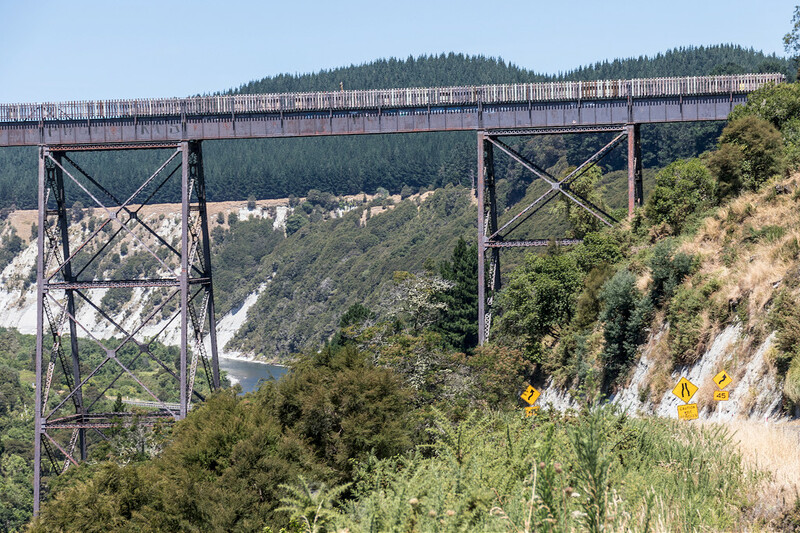 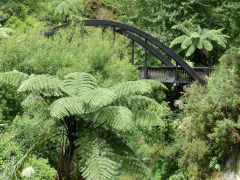 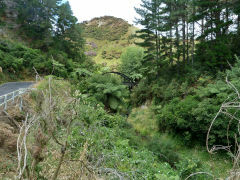 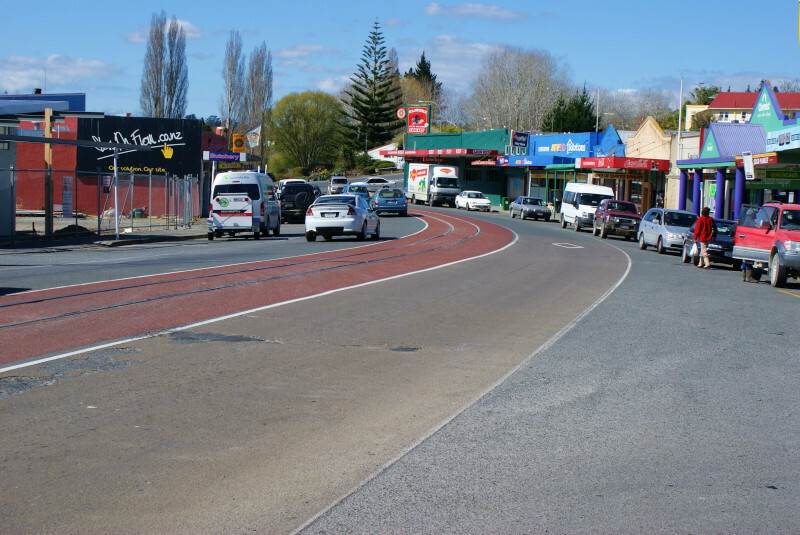 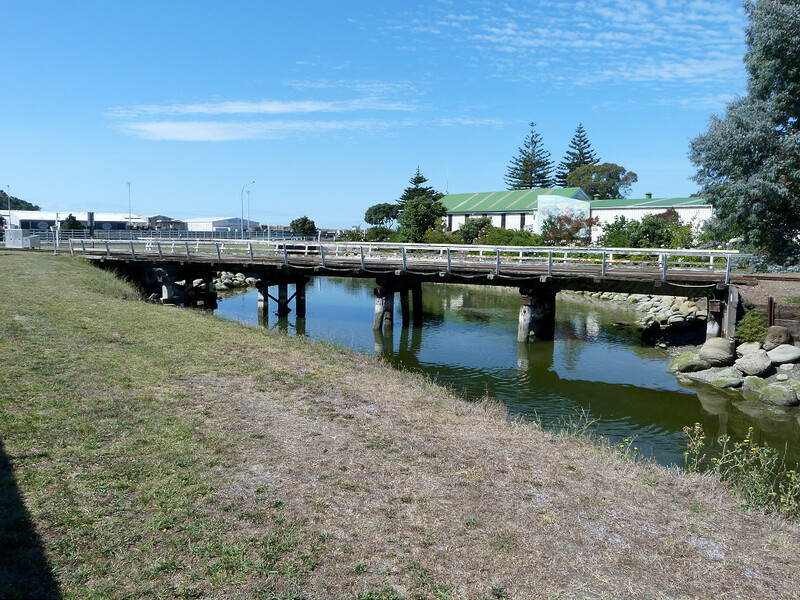 The bridge was designed for the Hawera County Council by the Public Works Department to give a 2.4m clearance above the highest recorded flood level. 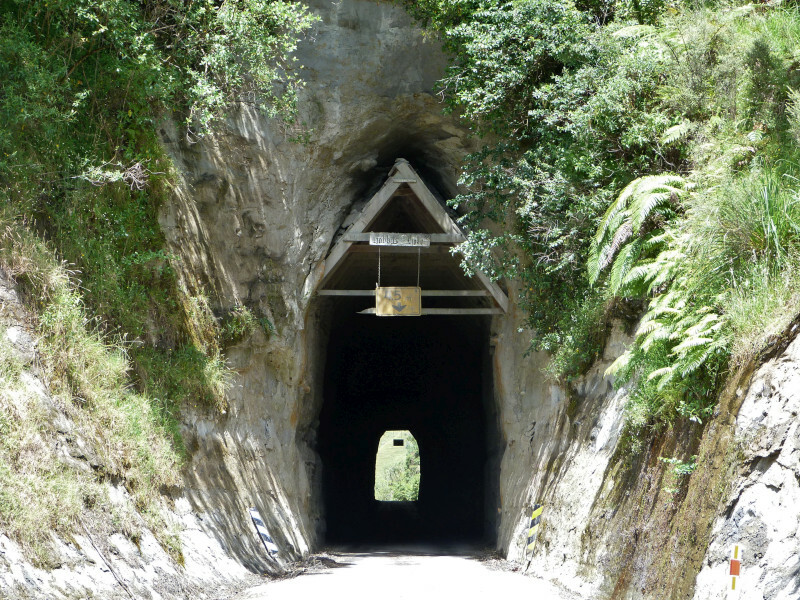 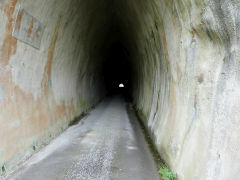 The Tangahoe Tunnel was constructed in 1928. 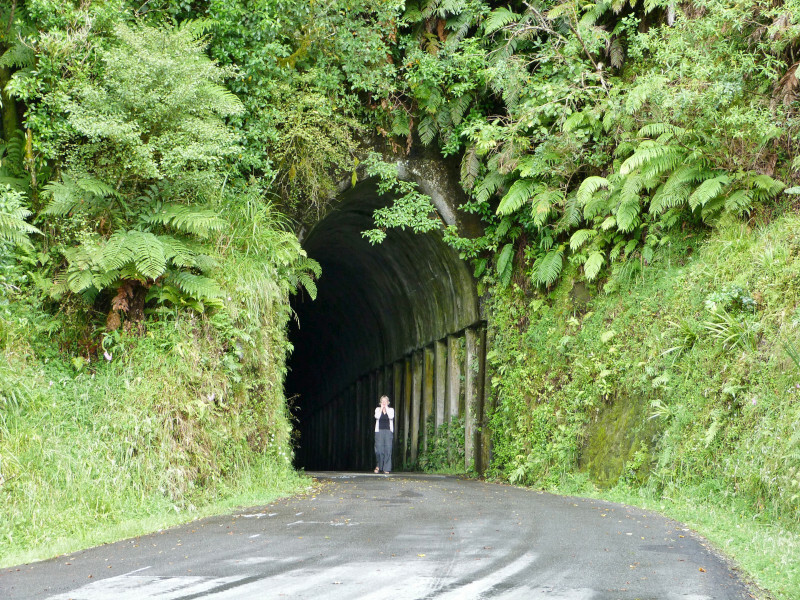 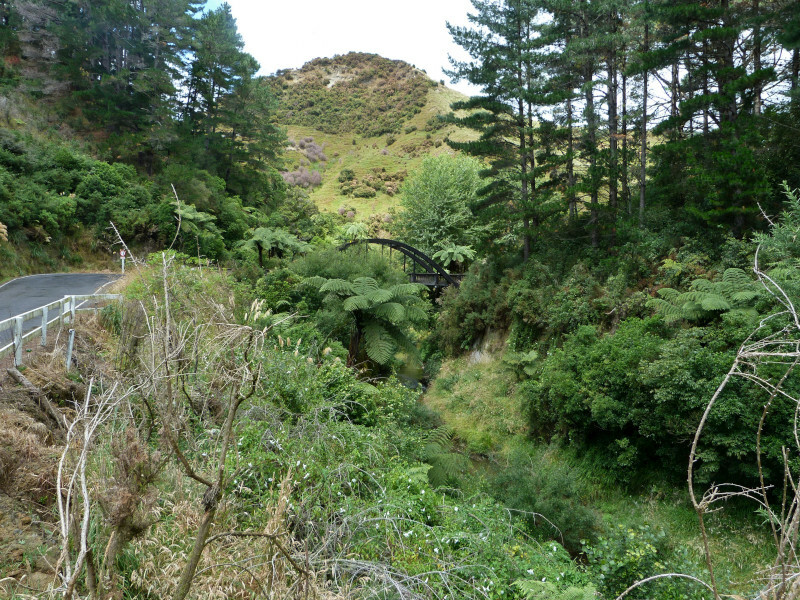 At 160 metres long it's one of the longest of Taranaki tunnels. 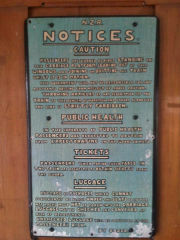 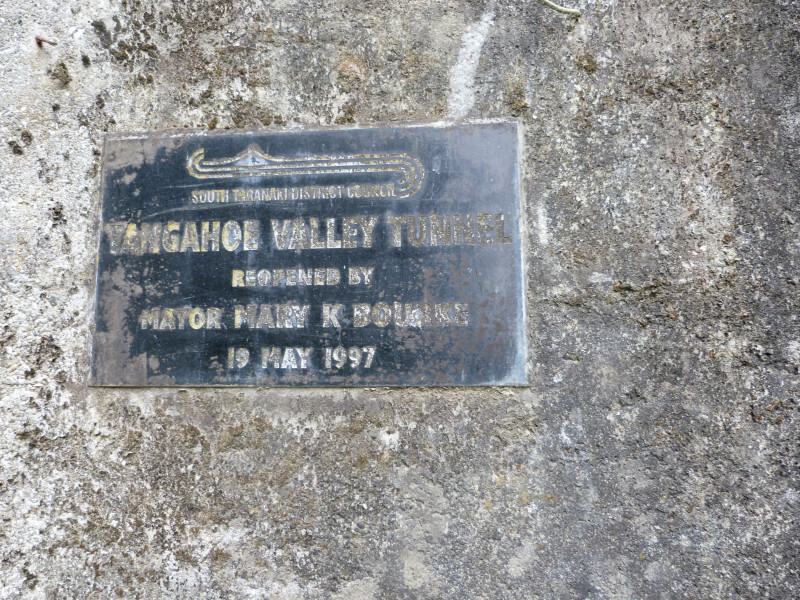 A plaque inside the eastern portal records the guniting of tunnel in 1954. 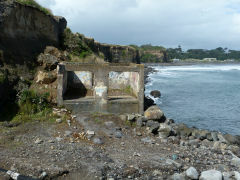 (Gunite or shotcrete is concrete sprayed under pressure to consolidate walls.) 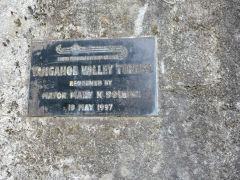 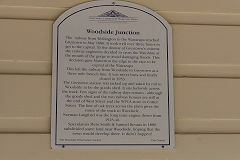 Another plaque at the west portal commemorates the re-opening of the tunnel after repairs in 1997. In 1986 part of the roof collapsed in an earthquake and the tunnel was closed. A deep and unstable cutting alongside, which proved to be often unpassable, served for traffic until the tunnel was repaired and re-opened in 1997. 'Palmerston' was built in 1872 at Dunedin by R S Sparrow & Co for the Foxton to Palmerston North Railway. 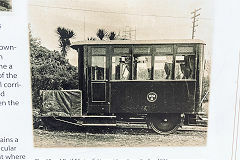 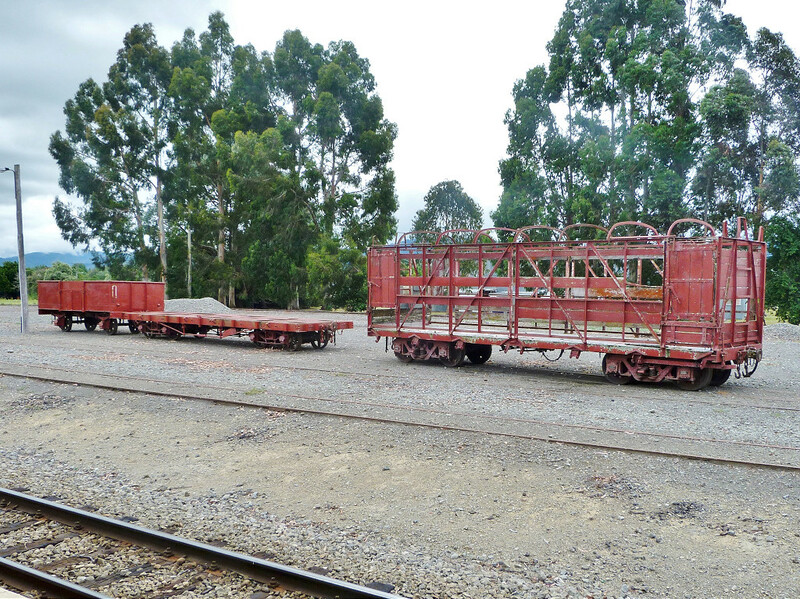 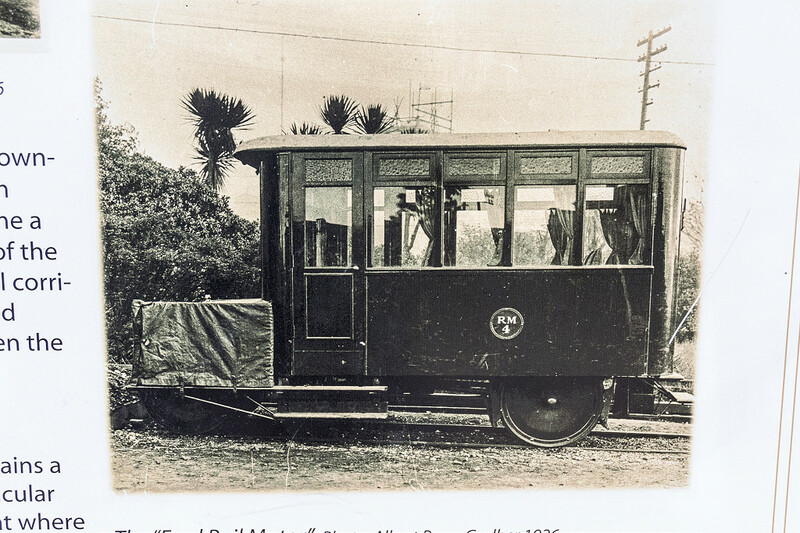 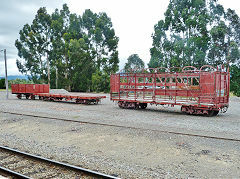 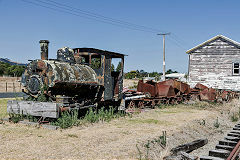 Neither the loco or the line were successful so the wooden rails replaced by iron and 'Palmerston' was replaced by 'Opossum', 'Skunk' and 'Wallaby' built by Mills of Wellington. 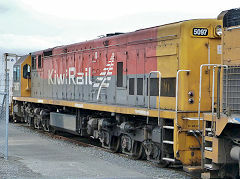 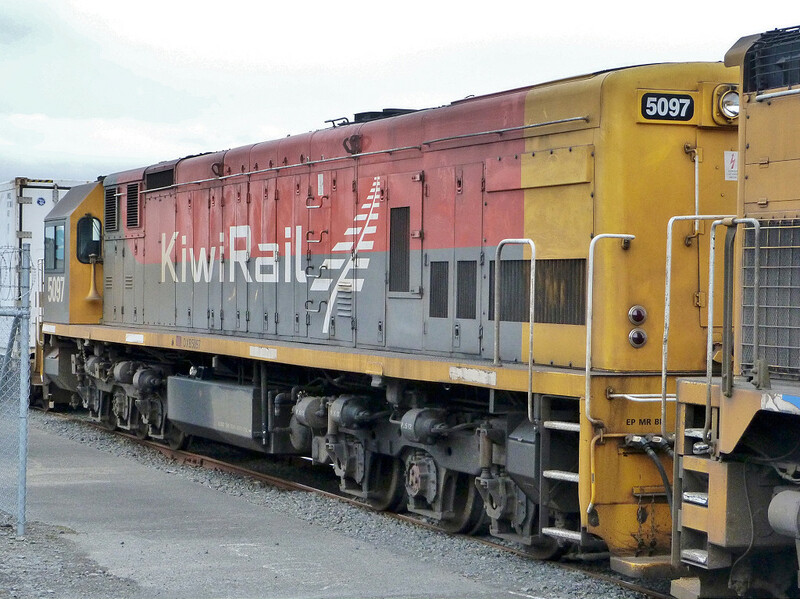 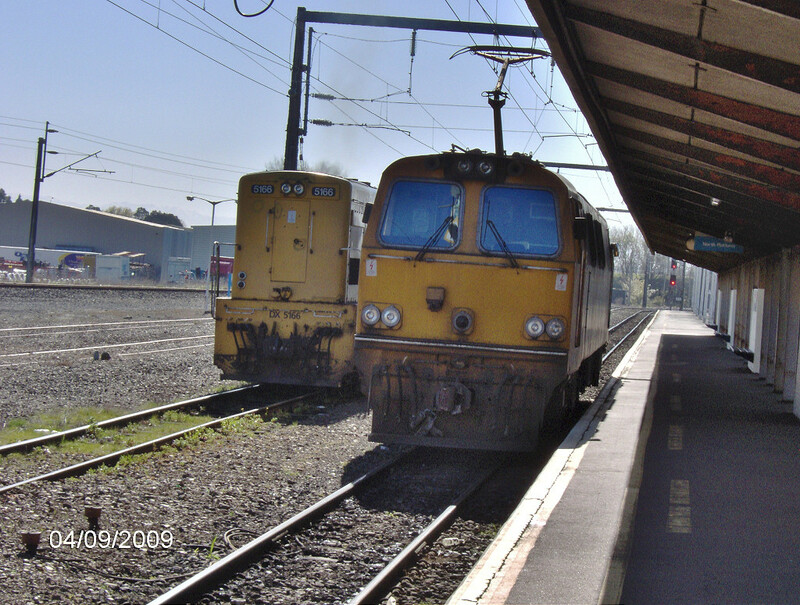 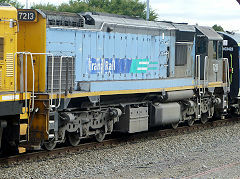 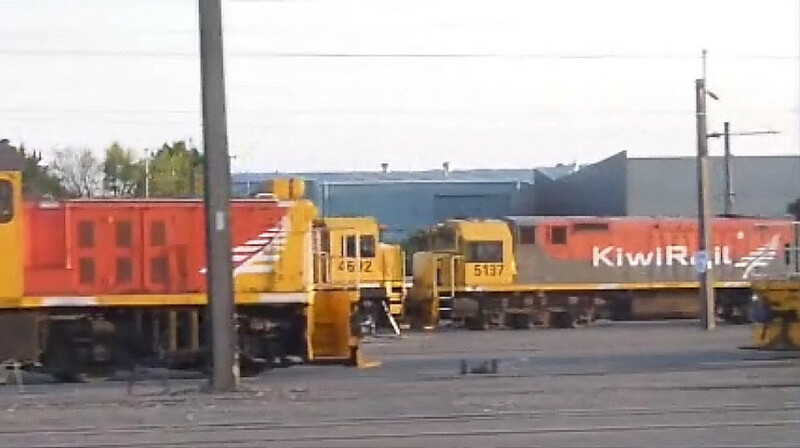 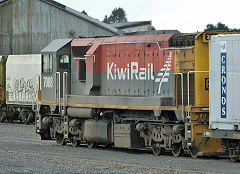 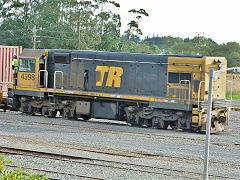 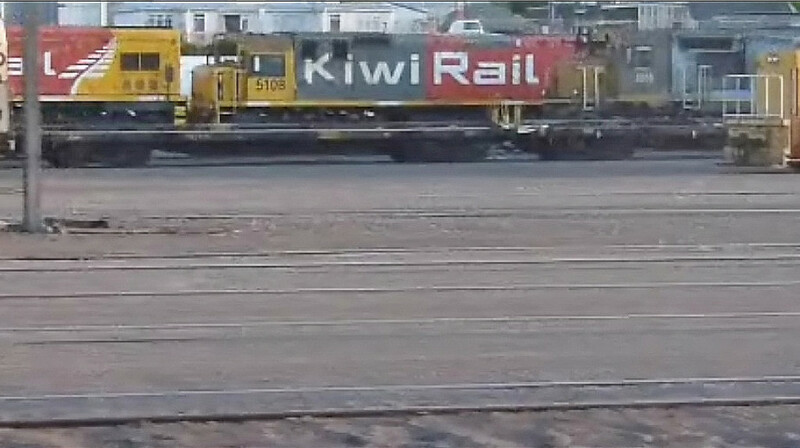 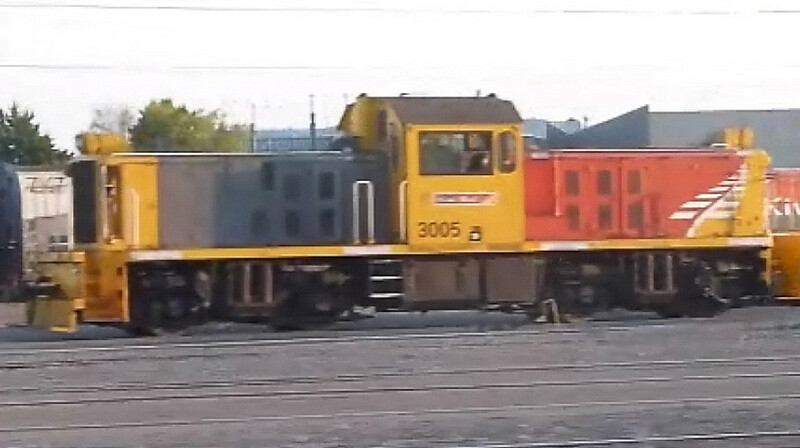 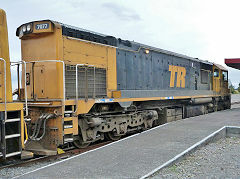 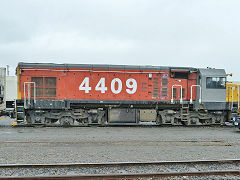 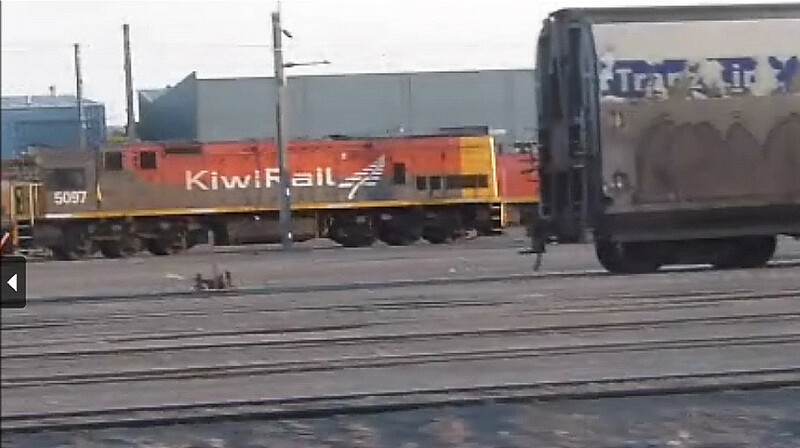 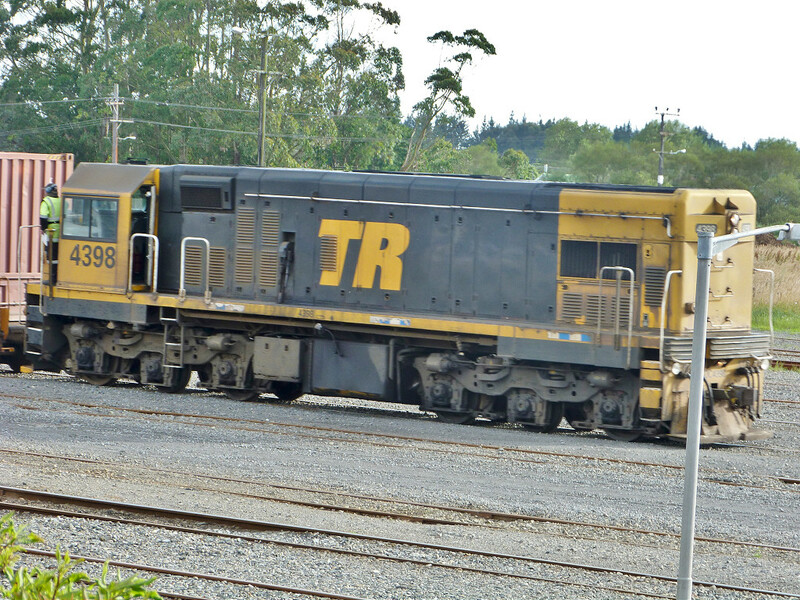 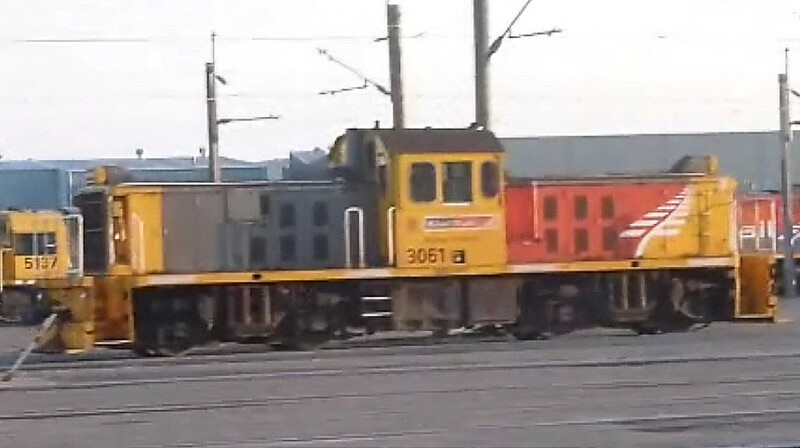 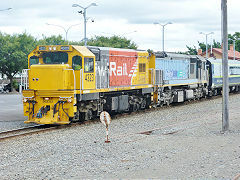 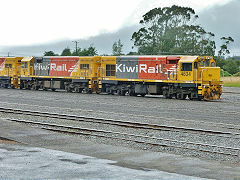 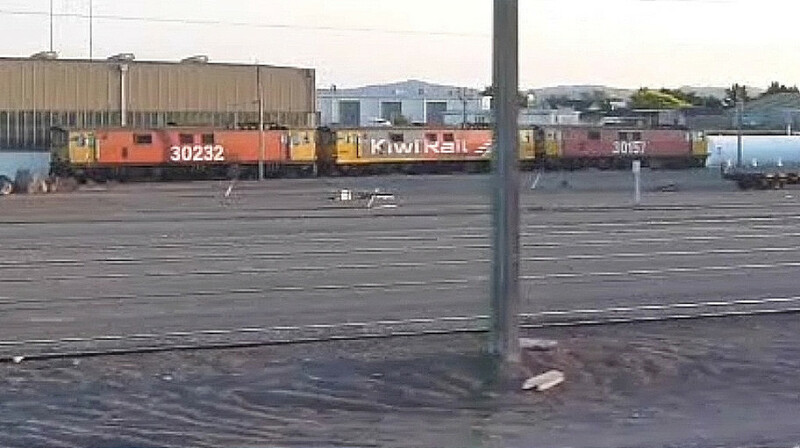 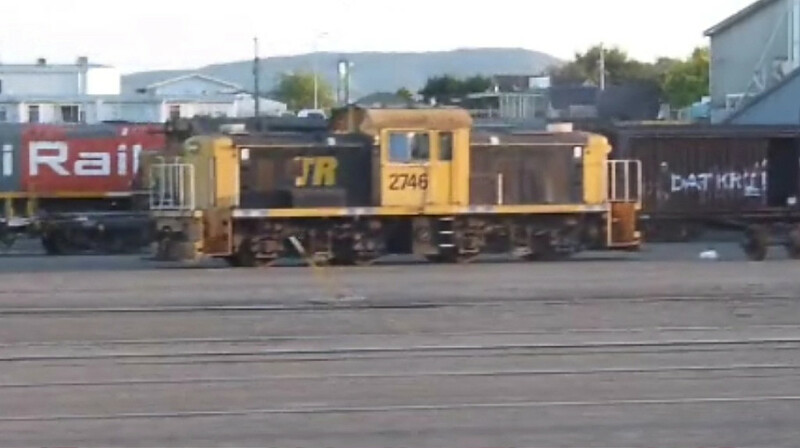 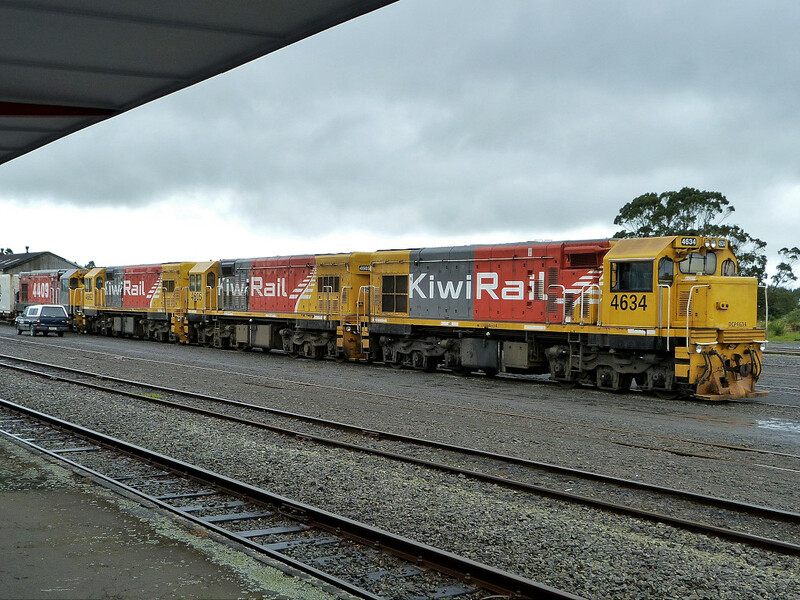 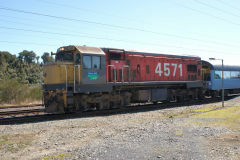 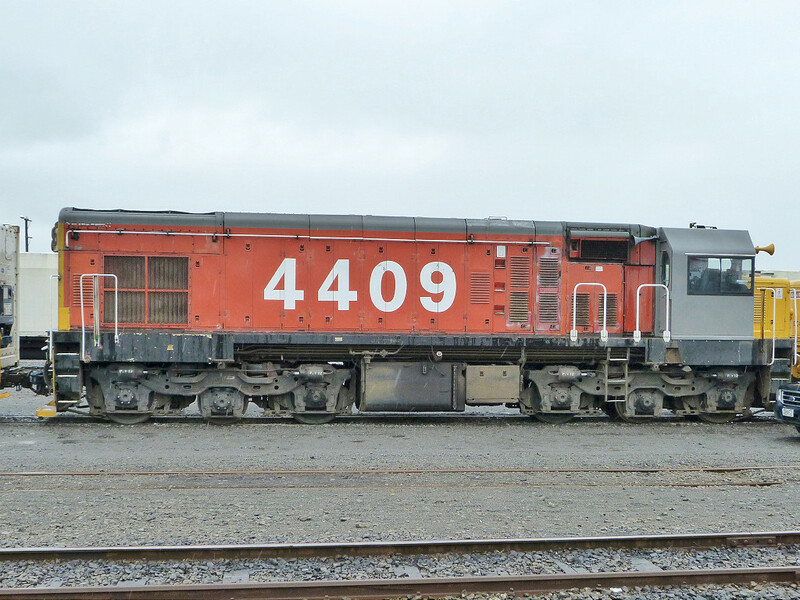 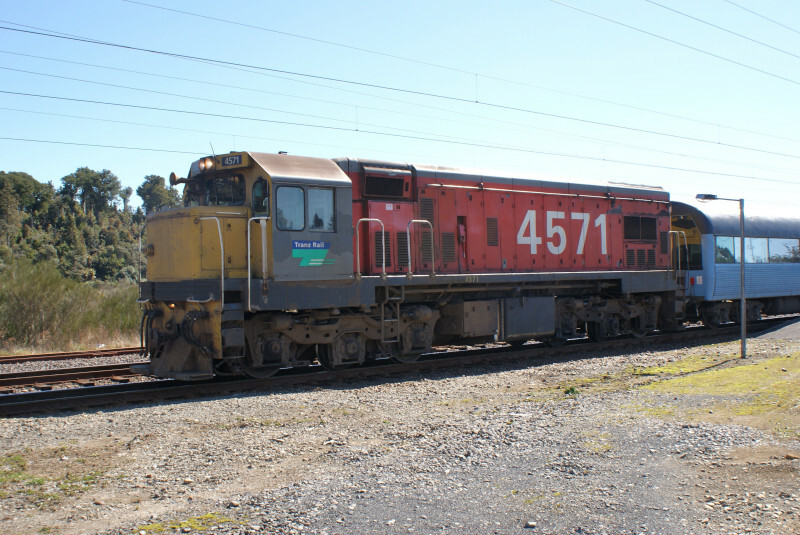 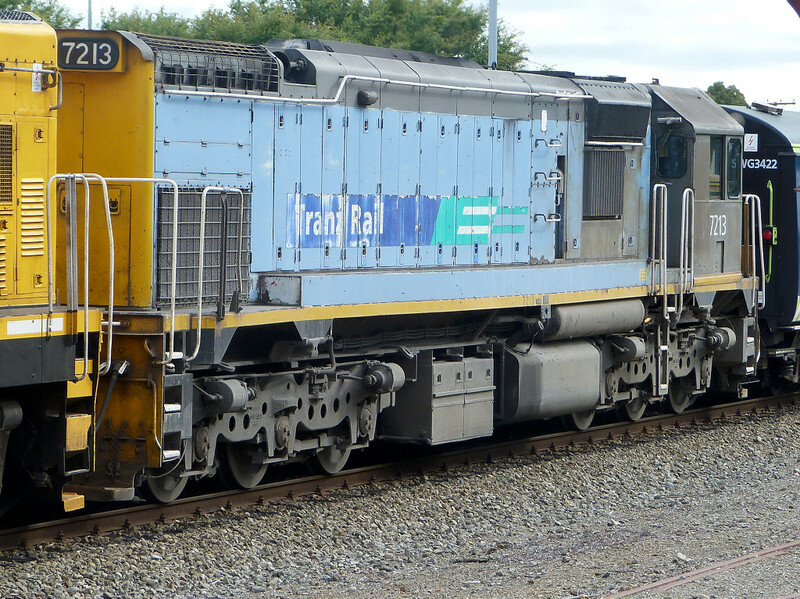 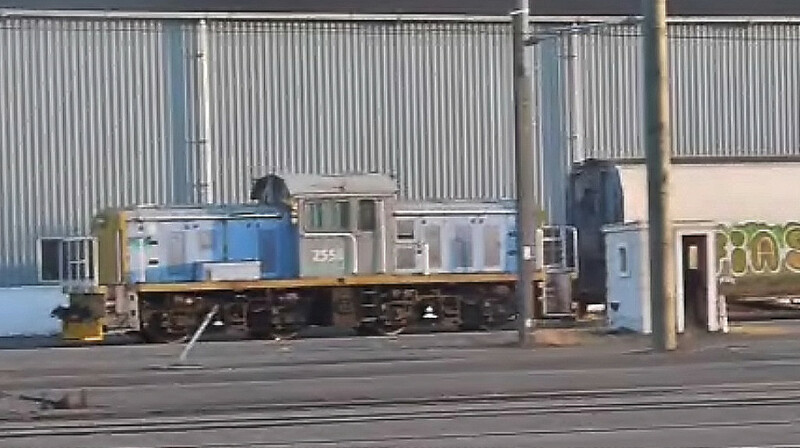 These in turn were replaced by NZR locos and were sold off. 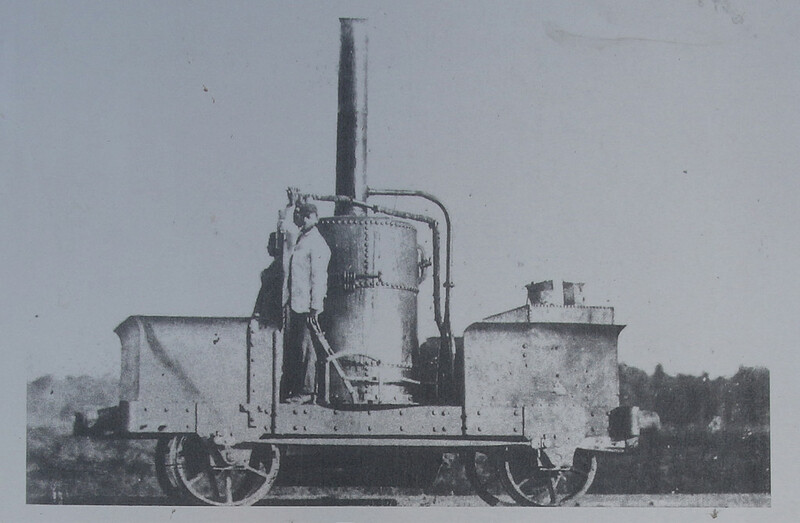 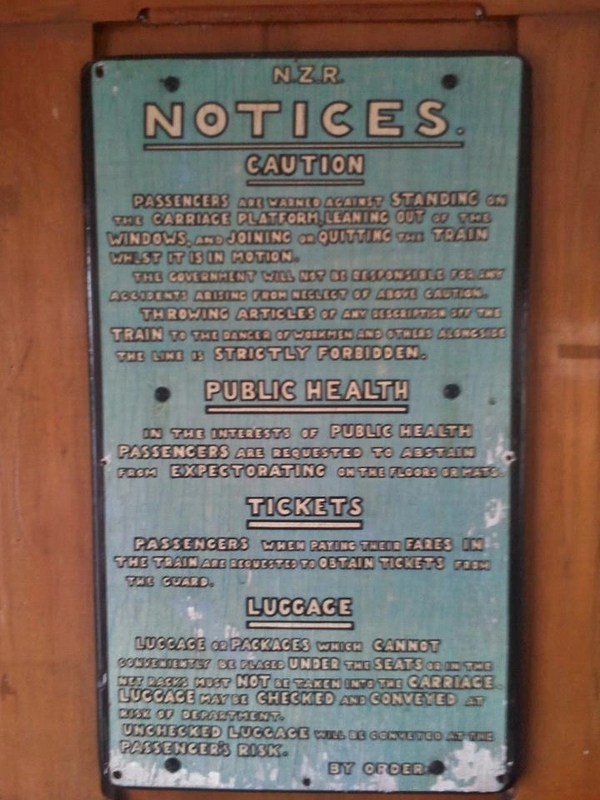 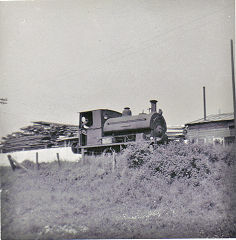 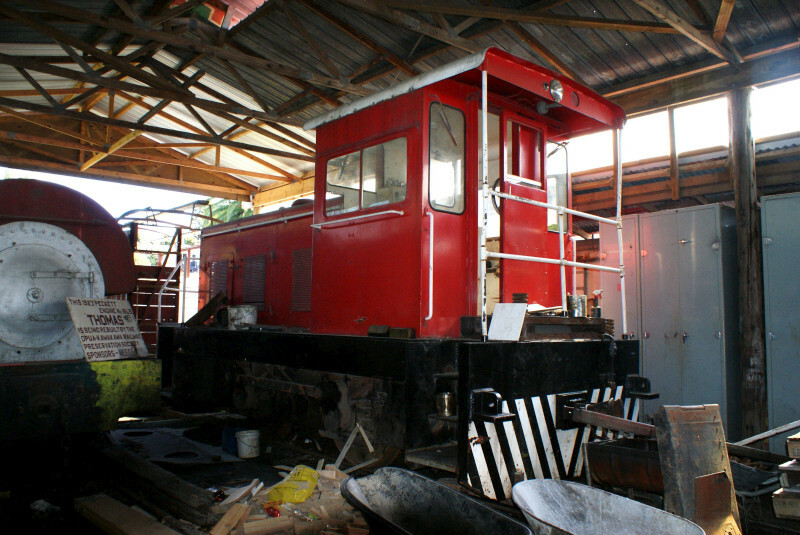 'Palmerston' continued in use on works trains etc until scrapped. 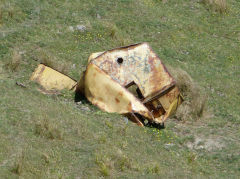 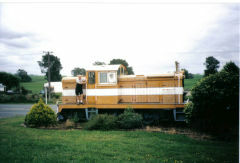 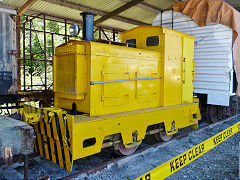 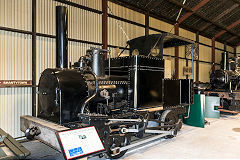 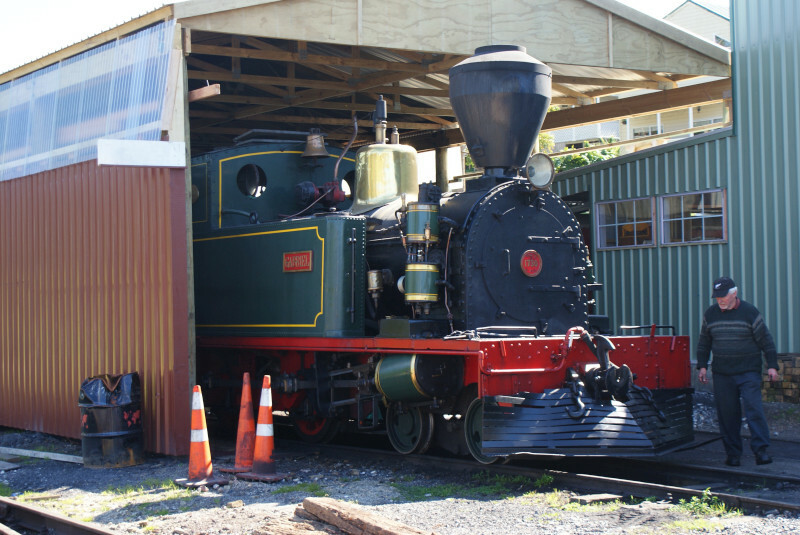 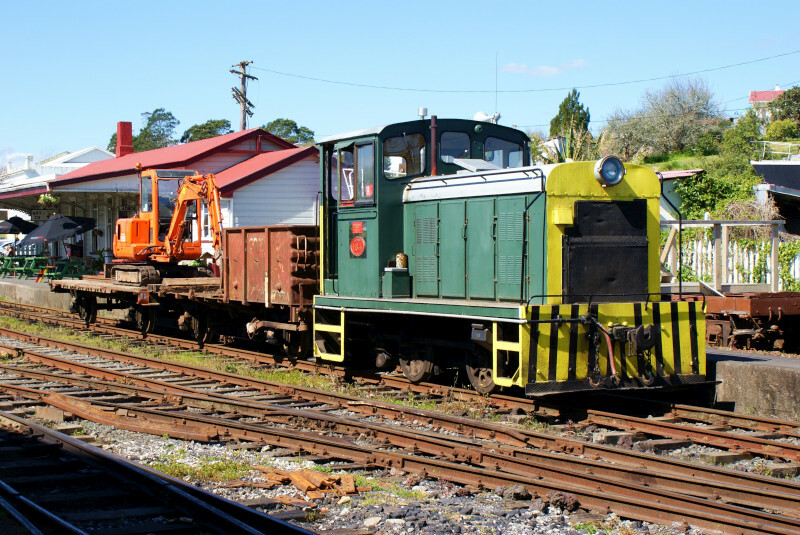 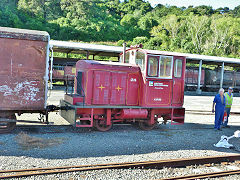 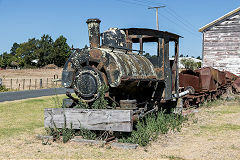 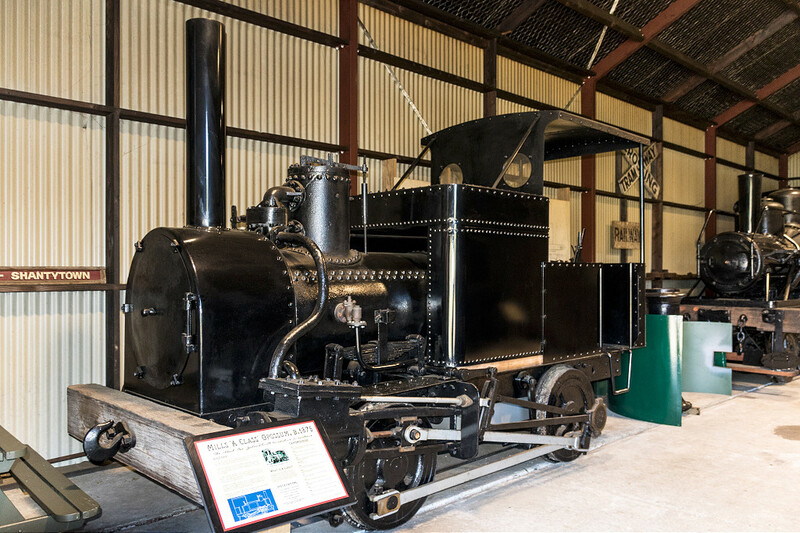 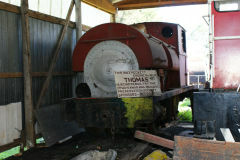 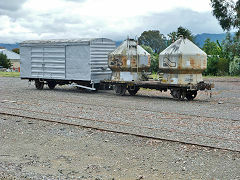 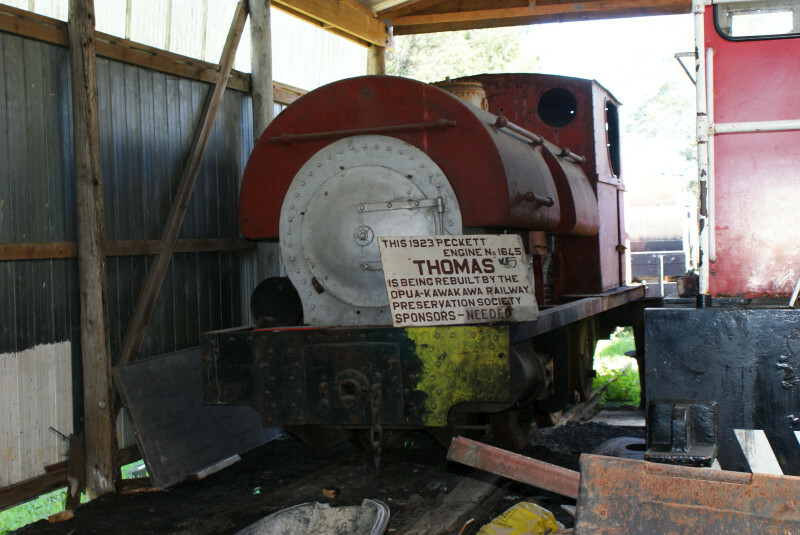 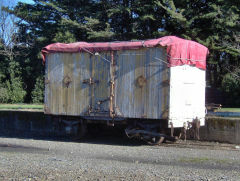 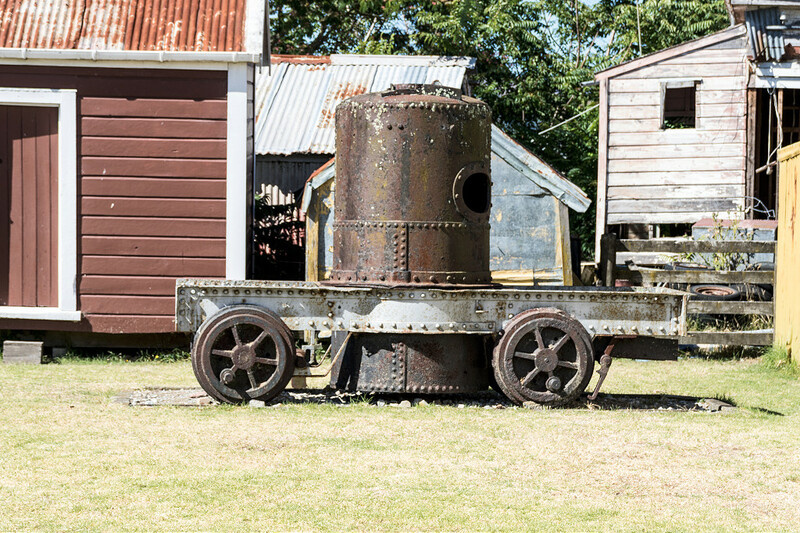 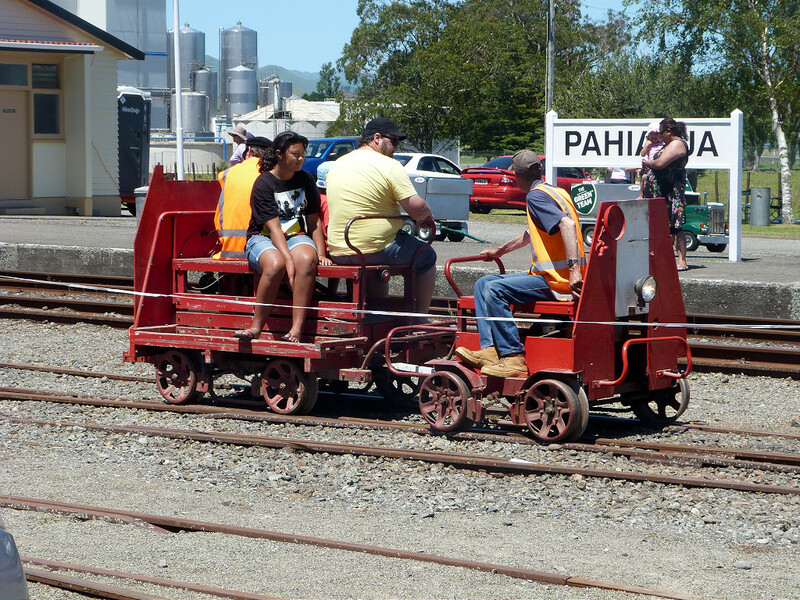 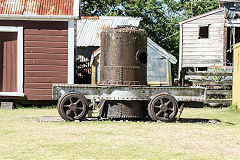 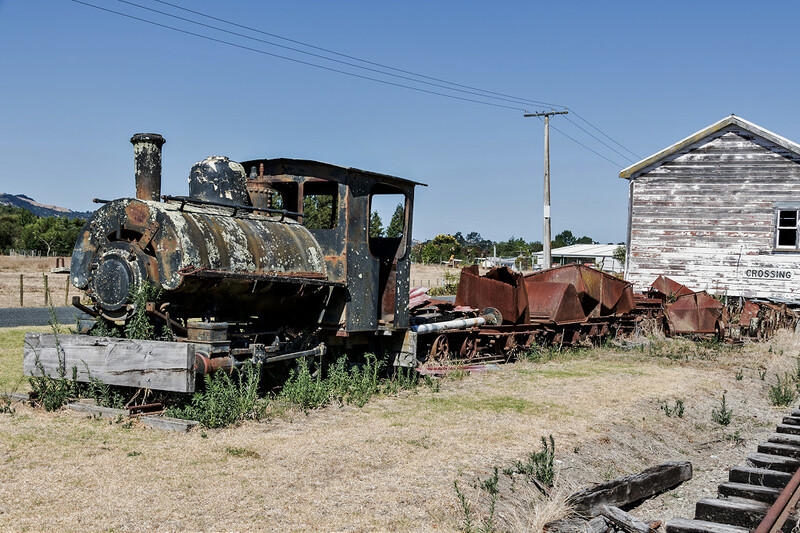 'Opossum' is preserved at Shantytown, South Island and the replica of 'Palmerston' was made in 1993. 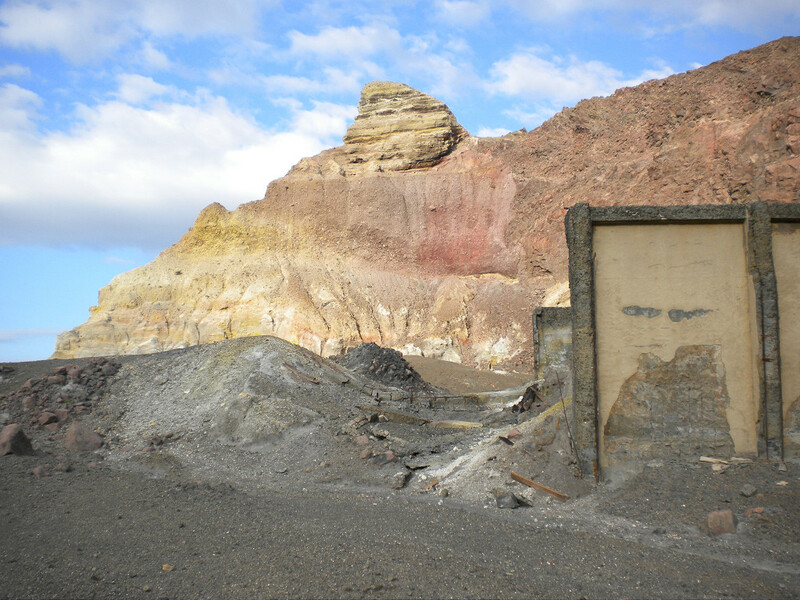 White Island or Whakaari in the Bay of Plenty contains one of New Zealand’s most active volcanoes. 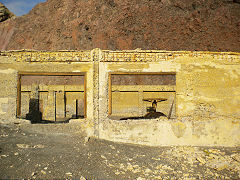 Early in the 20th century it was an important source of sulphur for the manufacture of superphosphate. Mining ended after 10 or 11 men were killed in a landslide in 1914. 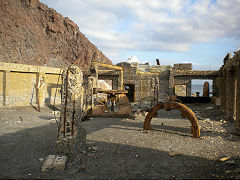 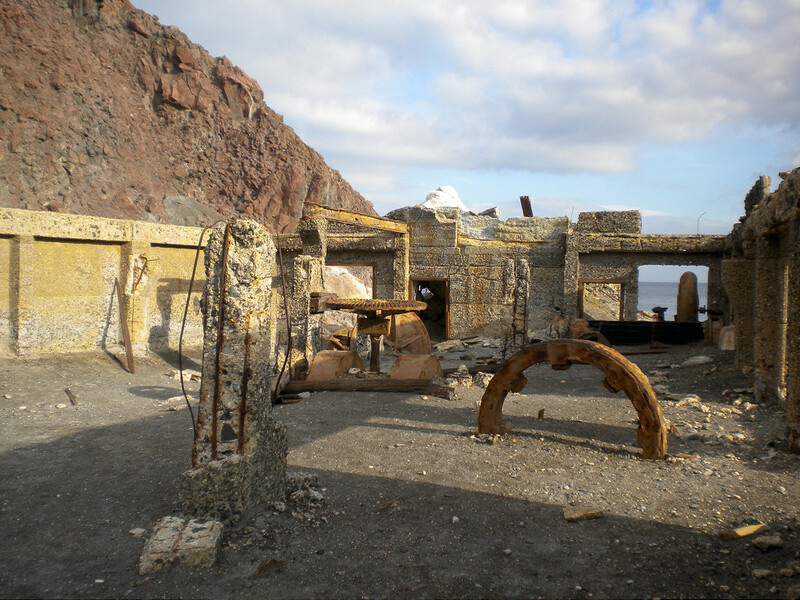 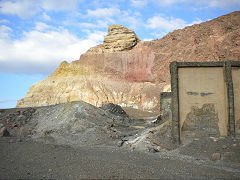 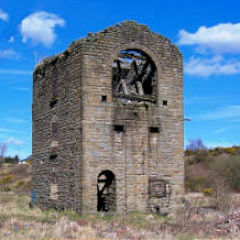 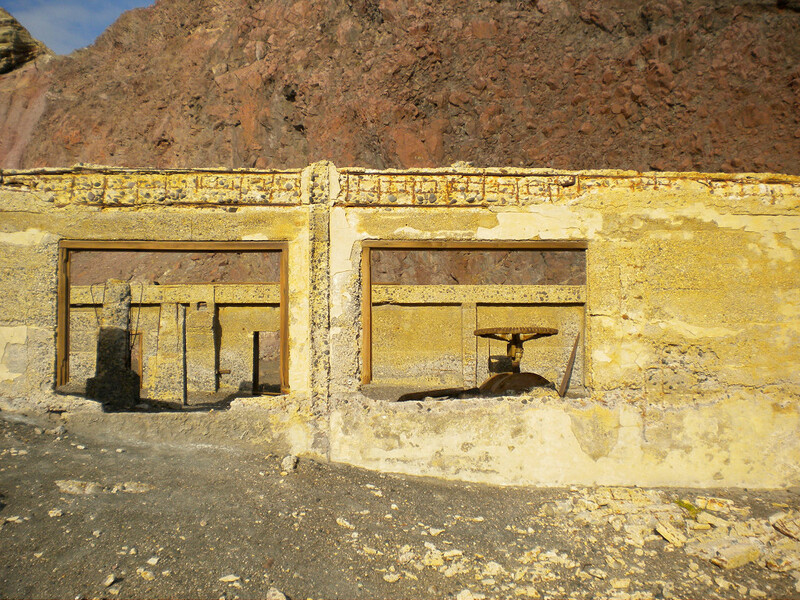 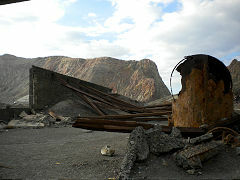 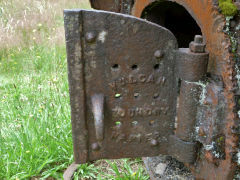 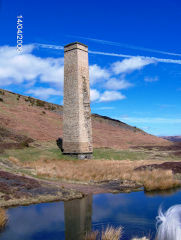 Some mining resumed in 1923, but eventually ceased in the 1930s when the sulphur was depleted.